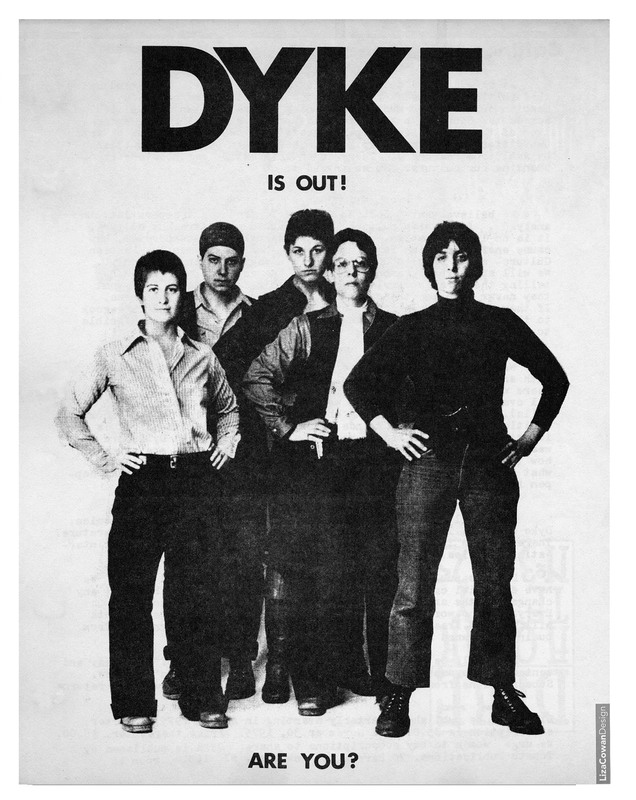 Part two of this monster posting on the exhibition Gay Gotham: Art and Underground Culture in New York at the Museum of the City of New York. 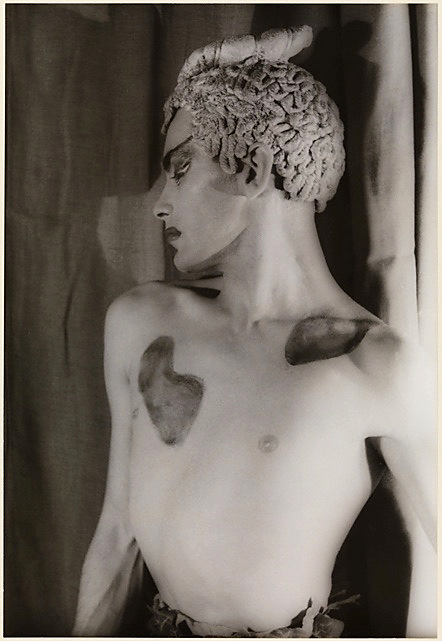 Highlights include photographs by Carl Van Vechten; art work by and of Andy Warhol; a video of the “Panzy Craze” of the the 1920s and 1930s; a photograph of a very young and skinny Robert Mapplethorpe and some of his early art work; some wonderful subversiveness from Greer Lankton; two glorious photographs from one of my favourite artists, Peter Hujar; and a great selection of book covers and posters, including the ever so sensual, German Expressionist inspired Nocturnes for the King of Naples cover art by Mel Odom. Léonard Tsuguharu Foujita (藤田 嗣治 Fujita Tsuguharu, November 27, 1886 – January 29, 1968) was a Japanese-French painter and printmaker born in Tokyo, Japan, who applied Japanese ink techniques to Western style paintings. He has been called “the most important Japanese artist working in the West during the 20th century”. His Book of Cats, published in New York by Covici Friede, 1930, with 20 etched plate drawings by Foujita, is one of the top 500 (in price) rare books ever sold, and is ranked by rare book dealers as “the most popular and desirable book on cats ever published”. 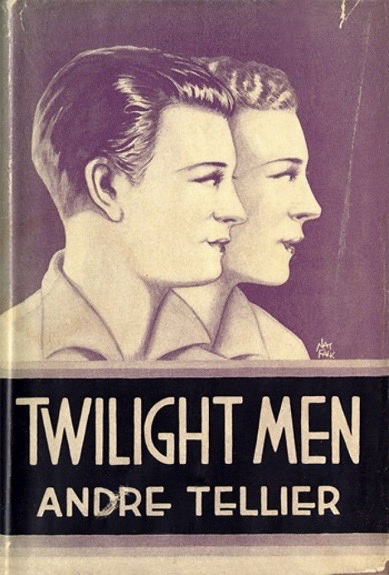 First published in 1931, this is an extremely uncommon early novel set in New York City of homosexuality and a young man whose gay tendencies infuriates his father, who attempts to set him upon the “path of normality” by hiring a mistress to seduce him. 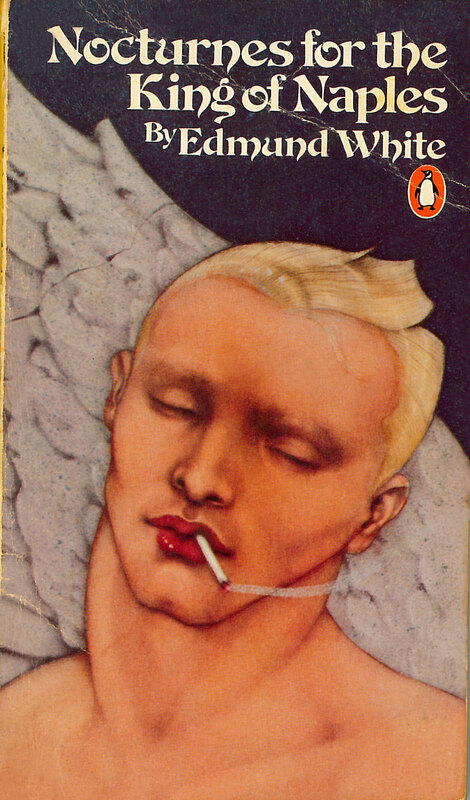 “Like many early gay novels, the book does not have a happy ending: the main character becomes addicted to drugs, murders his father, and kills himself. 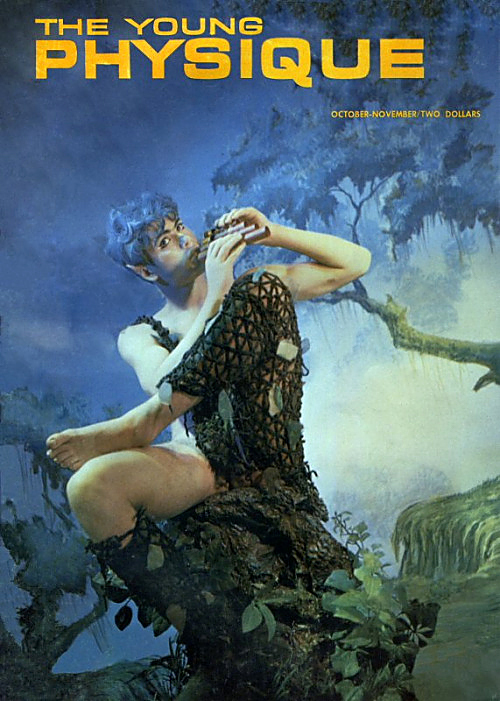 This theme (the gay monster or the gay degenerate) occurs very frequently before the 1960’s. 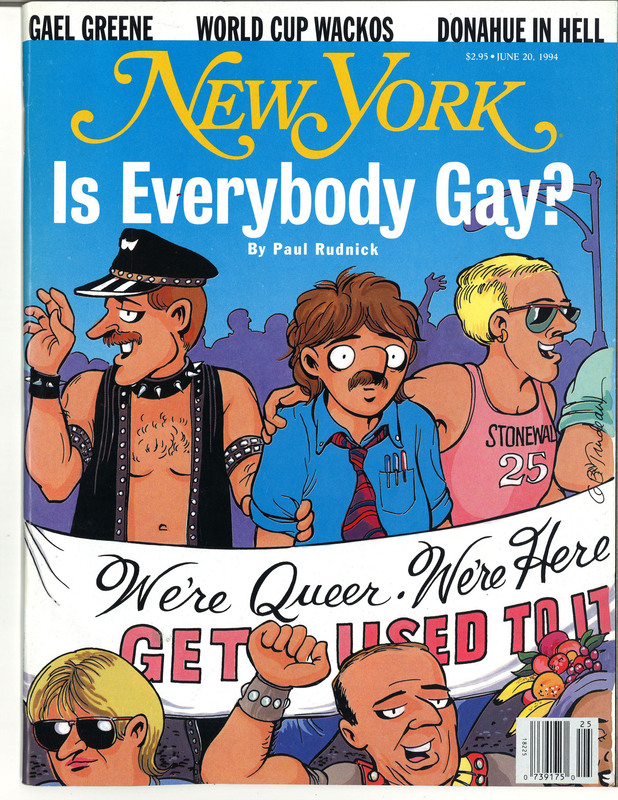 Originally, this was the only way that a book with any kind of gay themes could even be published; that is, it was only palatable – or even legal – to feature a gay protagonist if that person “gets what’s coming to him” in the end. 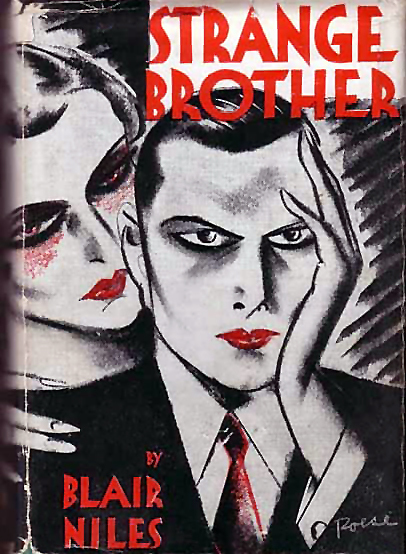 Strange Brother is a gay novel written by Blair Niles published in 1931. The story is about a platonic relationship between a heterosexual woman and a gay man and takes place in New York City in the late 1920s and early 1930s. Strange Brother provides an early and objective documentation of homosexual issues during the Harlem Renaissance. Mark Thornton, the story’s protagonist, moves to New York City in hopes of feeling like less of an outsider. 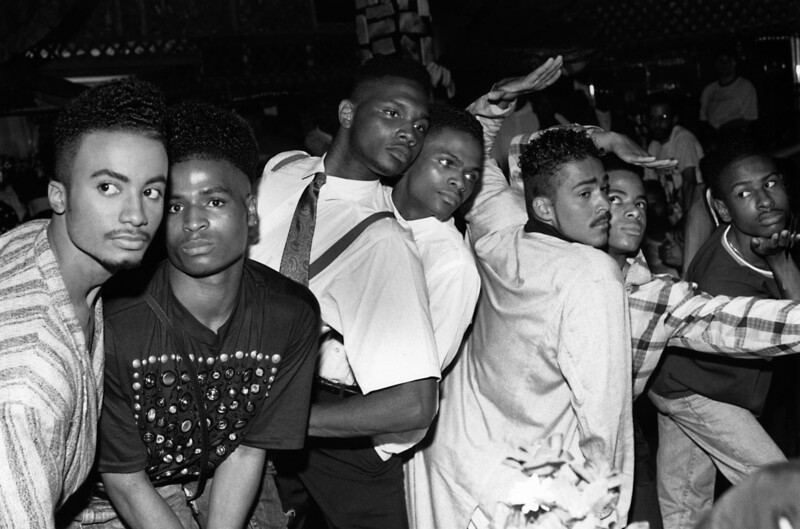 At a nightclub in Harlem he meets and befriends June Westbrook. One night they witness a man named Nelly being arrested. June encourages Mark to investigate. This leads Mark to attend Nelly’s trial, where he is found guilty and sentenced to six months’ imprisonment on Welfare Island for his feminine affections and gestures. Next Mark researches the crimes against nature sections of the penal code. Shaken up by his findings and the events, Mark confesses his own homosexuality to June. Mark and June’s friendship continues to grow, and June introduces Mark to a number of friends in her social circle. 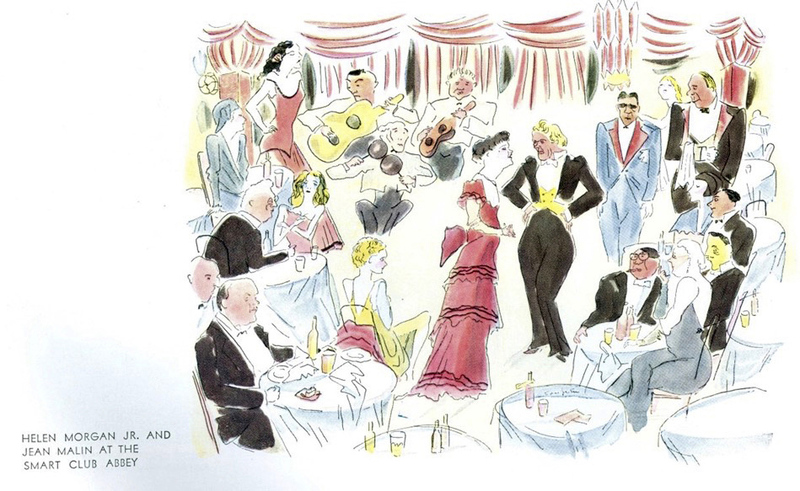 Various social interactions ensue including a dinner party for a departing professor, a trip to a nightspot featuring a singer called Glory who sings Creole Love Call and attending a drag ball. 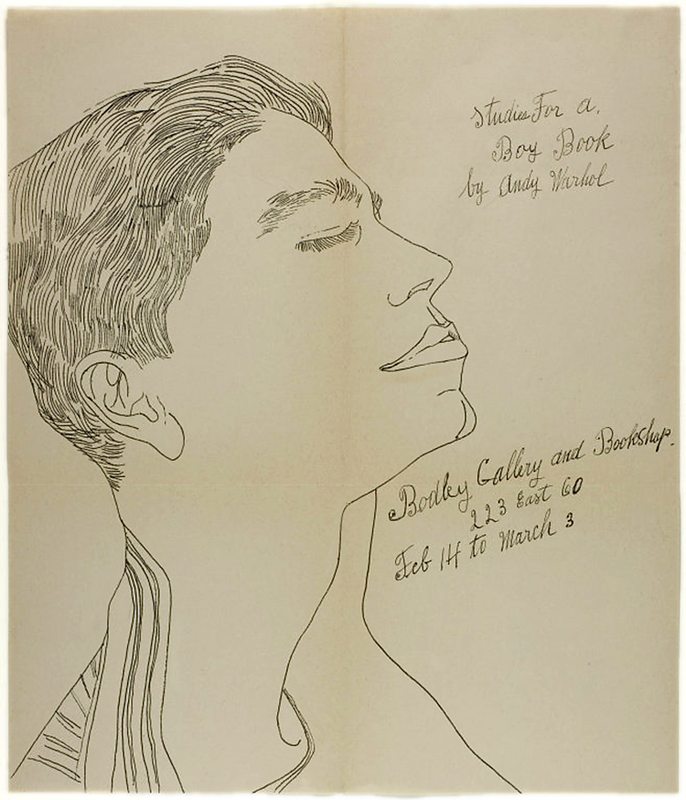 Despite reading Walt Whitman’s poetry collection Leaves of Grass, Edward Carpenter’s series of papers Love’s Coming of Age, and Countee Cullen’s poetry, Mark is afraid to come out. Subsequently, Mark is threatened with being outed at work. In response to this threat, Mark commits suicide by shooting himself. 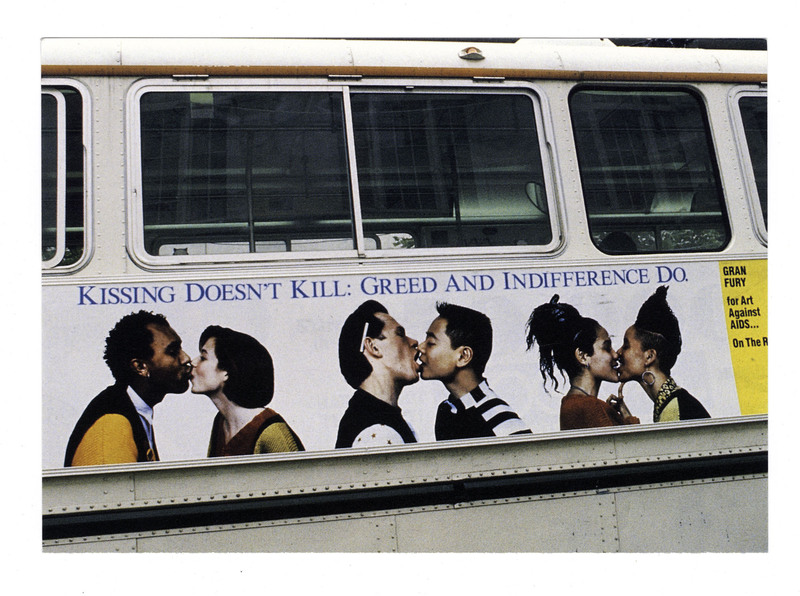 Design by Gran Fury for Art Against AIDS/On The Road and Creative Time, Inc. 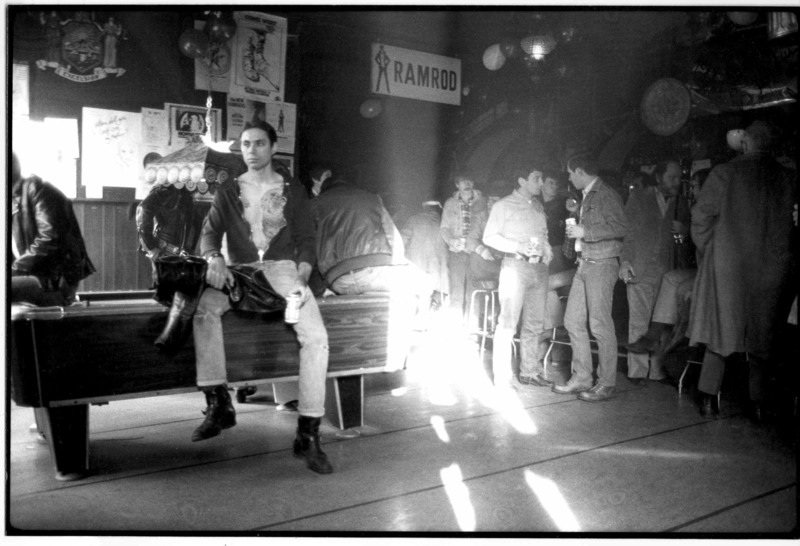 THE RAMROD, 394 West Street, (between Charles and West 10th Streets). Constructed in the 1850’s this building (actually two, that were attached) housed S. J. Seely & Co., a lime dealer, and C. August, (on the corner) a porter house, and private residence. In the late 70’s it was one of the most popular leather bars in New York. Attracting a large motorcycle clientele, West Street always had a plethora of bikes parked out front. The doorman, Rico, had a long black bushy beard, and an ever present black cowboy hat, also he wore on his hand a glove with sharp stainless steel blades attached to it, (sort of a precursor to Freddie Kruger). The bar, and Rico could be very intimidating, if you were new, or “Brown” as the uninitiated were called… referring to the brown leather they wore. 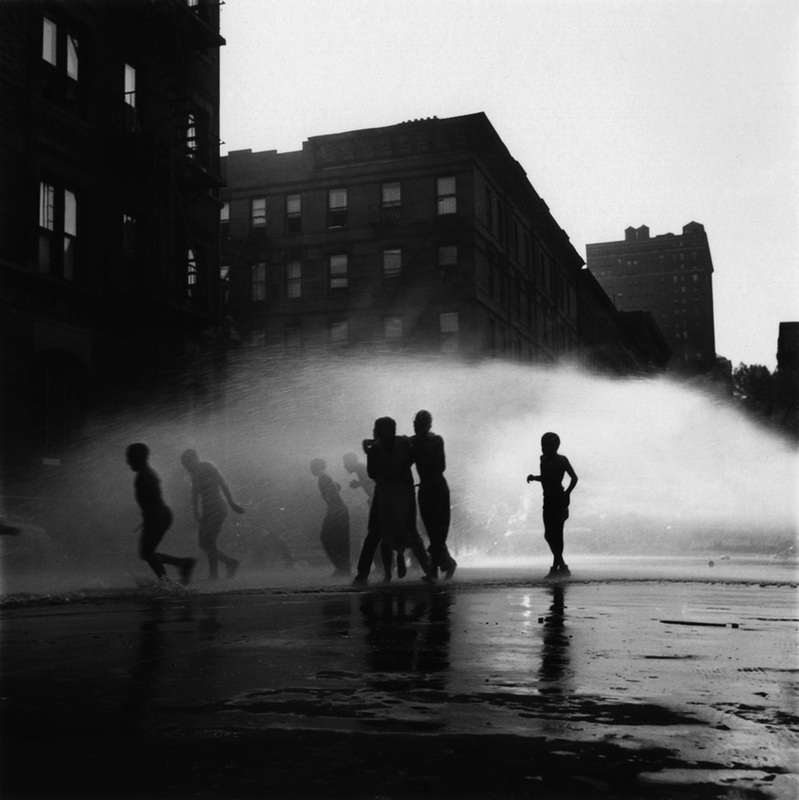 In June 1993, the Estate of Leonard Fink donated a photographic collection to The Center in New York City through its executor, Steven E. Bing. 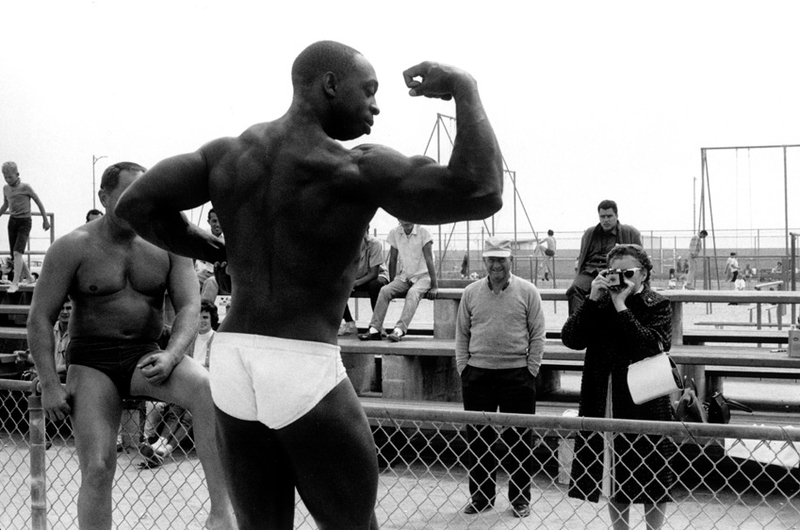 The materials in the Fink Estate was willed to four AIDS related organisations who gave all of the rights to the photos to the Center Archive. Some of these were signed “Len Elliot,” which might have ben a pseudonym of Fink’s. The collection consists of over 25,000 negatives and images capturing Greenwich Village and much of the spirit of the late 60s and 70s. 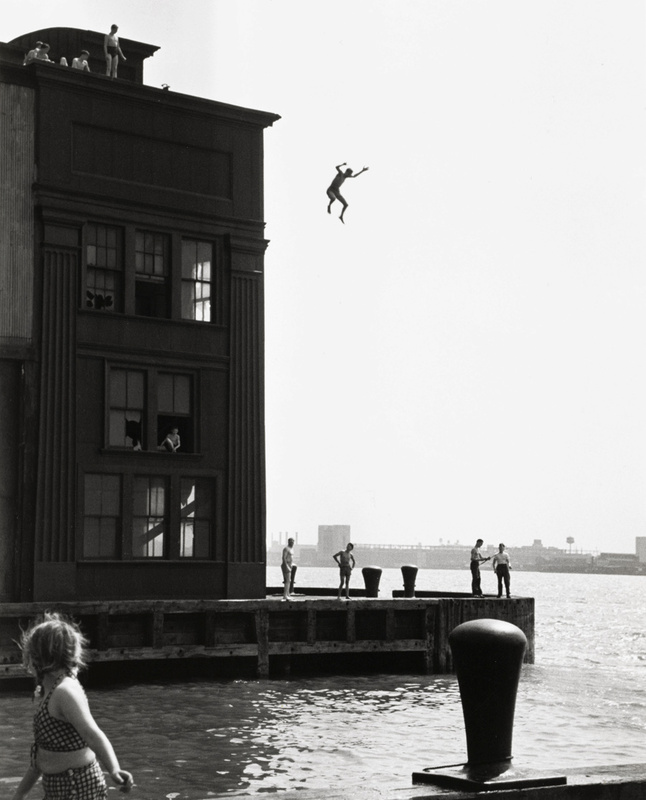 Some of the most well known images in the collection are Fink’s work at “The Piers” along the Hudson River. 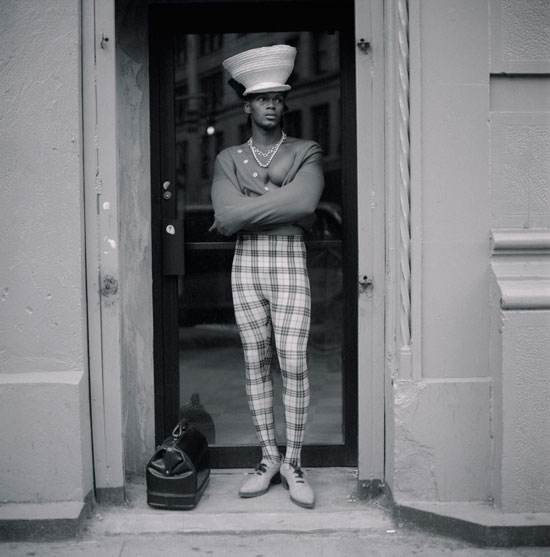 Fink documented over 25 years of gay life in New York City but his photography was never exhibited or published in his lifetime. 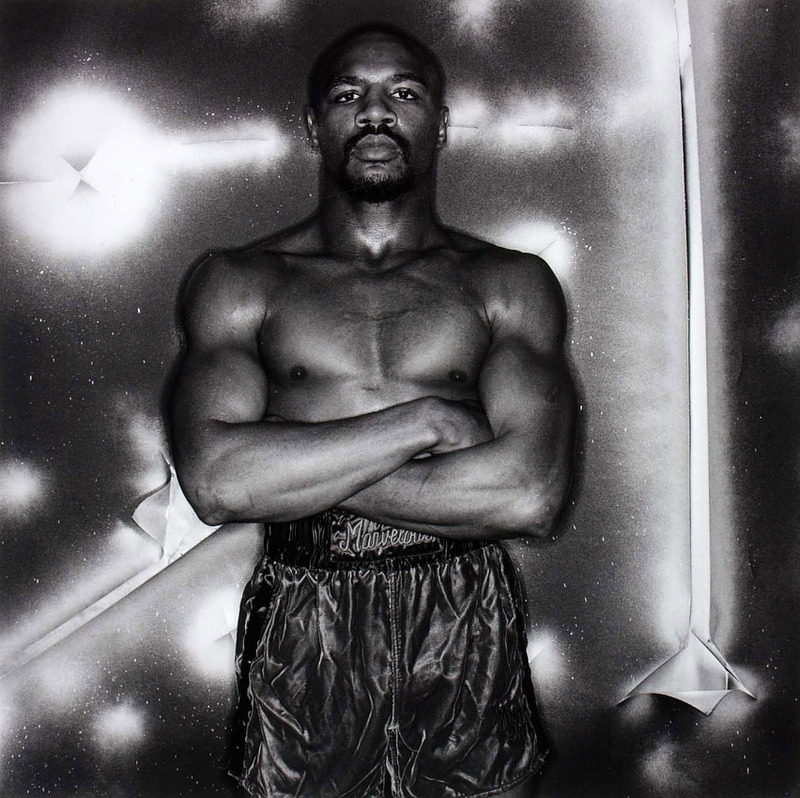 He was self taught and used an old 35mm camera while working out of a homemade darkroom in his West 92nd Street apartment. Leonard Fink was an amateur photographer who documented over 25 years of gay life in New York including parades, bars, and especially the west side piers. He worked in complete obscurity and was apparently very reclusive. His photographs were seen by only a few close friends and were never exhibited or published in his lifetime. He seems to have taught himself photography using an old 35mm camera and a homemade darkroom in his small apartment on West 92nd street. He lived frugally, spending much of his income on photographic supplies which he bought in bulk and stored in his darkroom and his bedroom. He stored the prints and negatives in a file cabinet. By the time of his death, the photos in the file cabinet covered a period from 1954 to 1992. 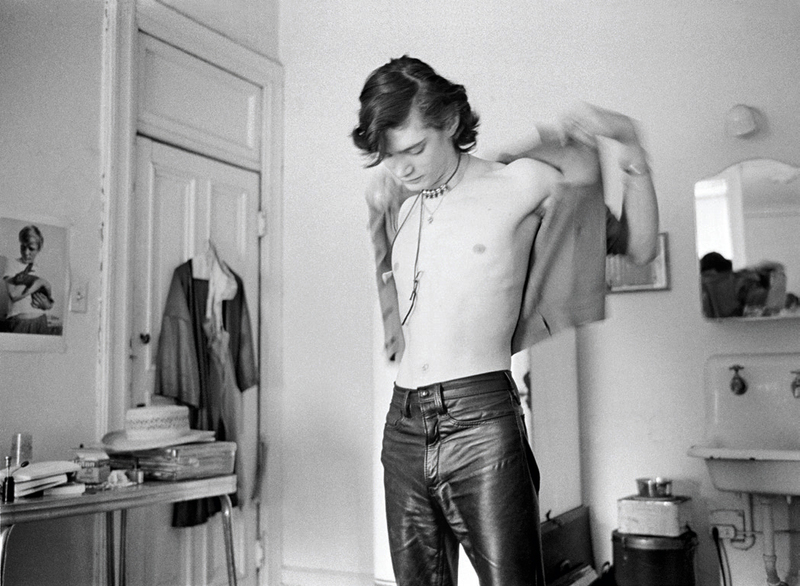 His photographs of gay life begin with groups of gay men photographed in Greenwich Village in 1967. 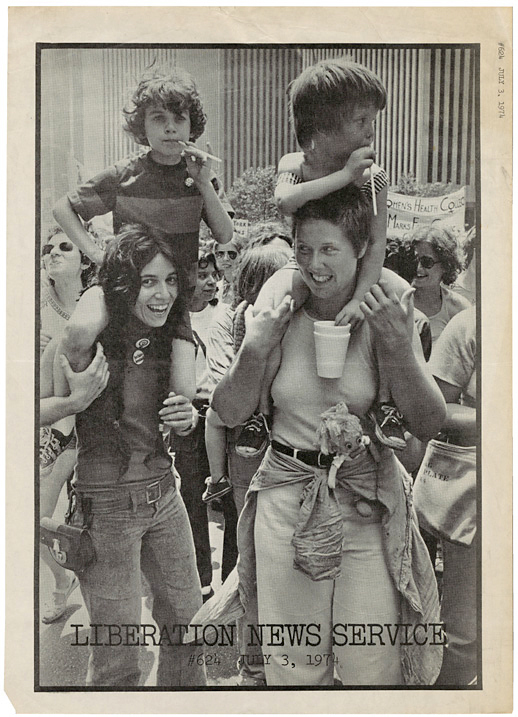 His photographs of Gay Pride parades begin with the first parade in 1970. His earlier photographs are of friends, trips to Europe, and scenes in New York. Leonard Fink was a colourful and ubiquitous character in the Village and at Pride parades, usually appearing on roller skates in short cut-offs, and a tight t-shirt with cameras always around his neck. He sometimes arrived on a bicycle or a motorcycle. He was born in 1930. His father and older brother were both physicians. He worked for many years as an attorney for the New York Transit Authority. He died of AIDS in 1993. Works by Van Der Zee are artistic as well as technically proficient. His work was in high demand, in part due to his experimentation and skill in double exposures and in retouching negatives of children. 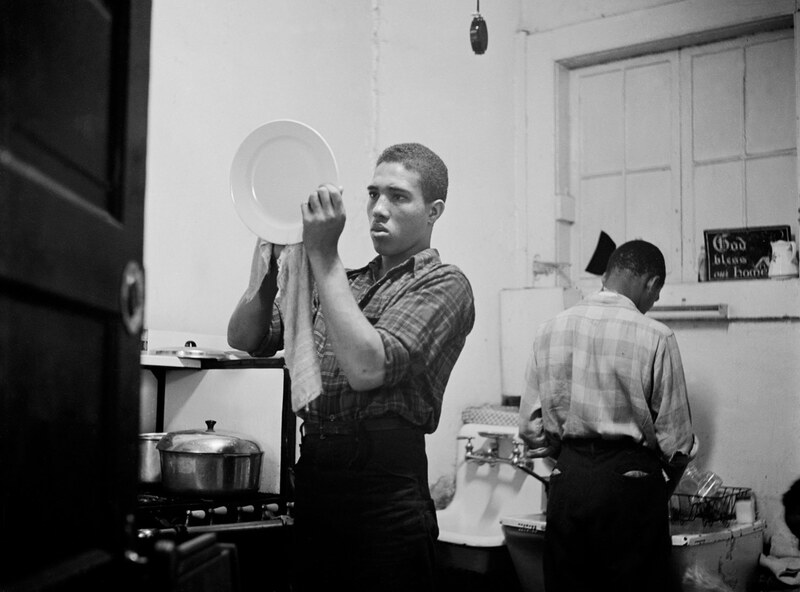 One theme that recurs in his photographs was the emergent black middle class, which he captured using traditional techniques in often idealistic images. Negatives were retouched to show glamor and an aura of perfection. This affected the likeness of the person photographed, but he felt each photo should transcend the subject. His carefully posed family portraits reveal that the family unit was an important aspect of Van Der Zee’s life. “I tried to see that every picture was better-looking than the person.” “I had one woman come to me and say ‘Mr.Van Der Zee my friends tell thats a nice picture, But it doesn’t look like you.’ That was my style.” Said Van Der Zee. Little known today, Carl Van Vechten was a prolific novelist, critic, photographer, and promoter of all things modern, most actively engaged in the city’s cultural life during the 1920s and ’30s. 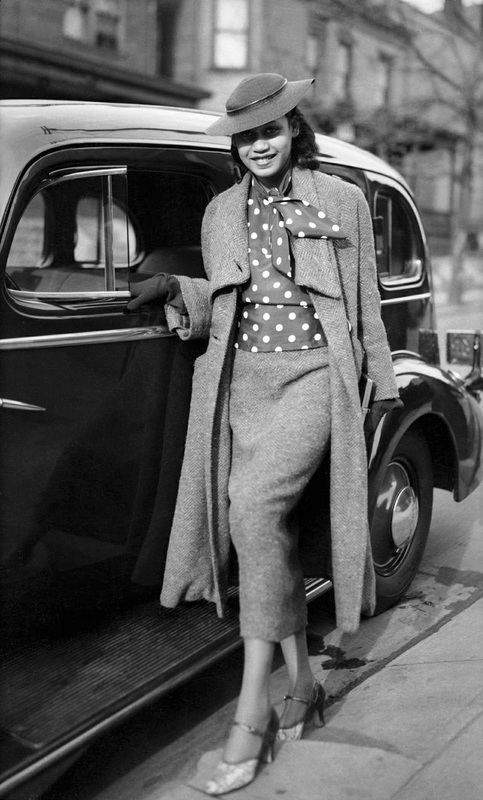 The City Museum is rich in Van Vechten materials; its collections include about 2,200 photographs taken by him and 3,000 Christmas cards sent to him and his wife, film and theater actress Fania Marinoff. 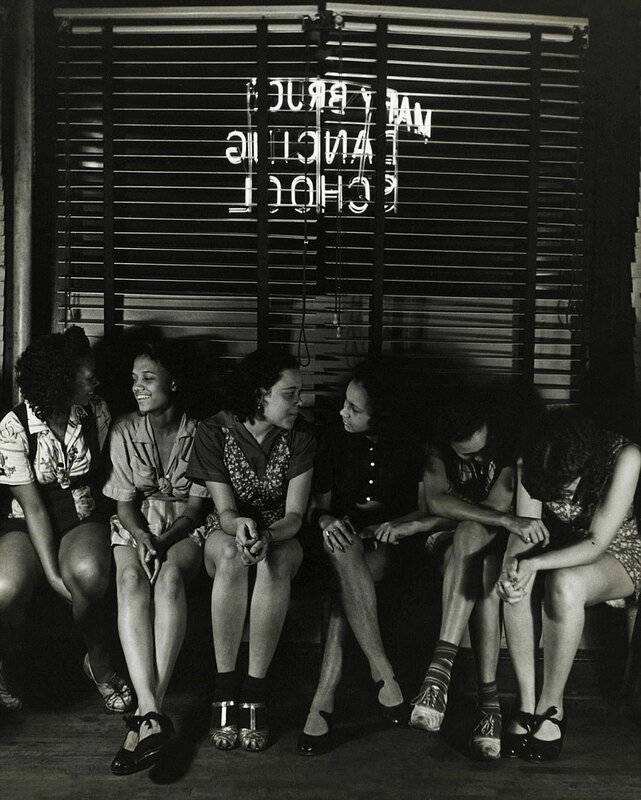 Taken together, they chronicle Van Vechten’s influential circles of friends and colleagues – a hybrid mash-up that defines the modern America at the heart of White’s new book. 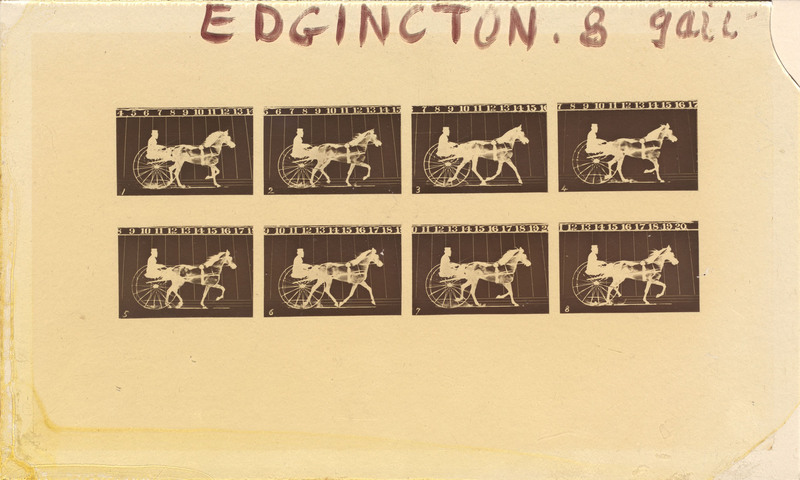 Images and correspondence in the City Museum’s collection range from Harlem Renaissance poet Langston Hughes to writer Zelda Fitzgerald (wife of F. Scott), and playwright Eugene O’Neill. Wong’s image and career have left a legacy. Through her films, public appearances and prominent magazine features, she helped to humanise Asian Americans to white audiences during a period of overt racism and discrimination. 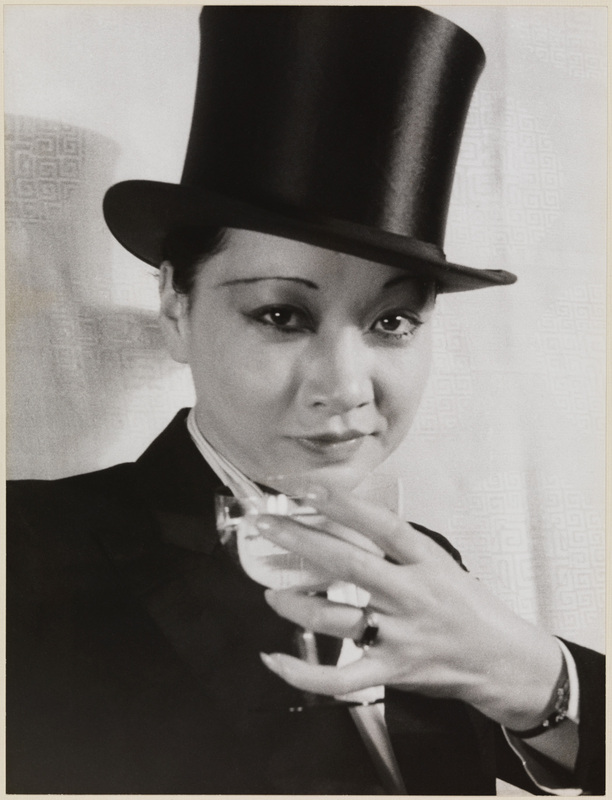 Asian Americans, especially the Chinese, had been viewed as perpetually foreign in U.S. society but Wong’s films and public image established her as an Asian-American citizen at a time when laws discriminated against Asian immigration and citizenship. Wong’s hybrid image dispelled contemporary notions that the East and West were inherently different. Hugh Laing (6 June 1911 – 10 May 1988) was one of the most significant dramatic ballet dancers of the 20th-century. He was the partner of choreographer Antony Tudor. Known for his good looks and the intensity of his stage presence, Laing was never considered a great technician, yet his powers of characterisation and his sense of theatrical timing were considered remarkable. His profile as a significant dancer of his era was almost certainly enhanced by Tudor’s choreographing to his undoubted strengths and Laing is generally regarded as one of the finest dramatic dancers of 20th-century ballet. 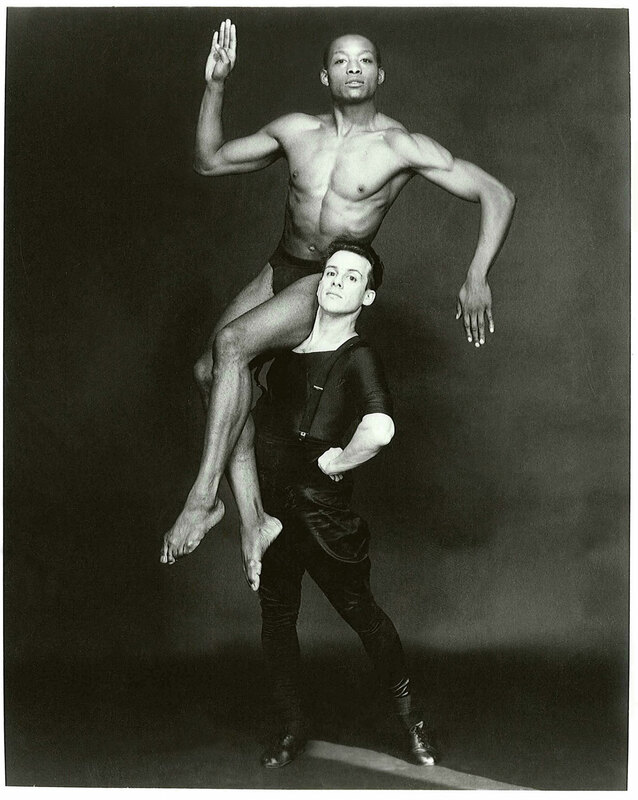 He remained Tudor’s artistic collaborator and companion until the choreographer’s death in 1987. Ailey’s dancers came to his company with training from a variety of other schools, from ballet to modern and jazz and later hip-hop. He was unique in that he did not train his dancers in a specific technique before they performed his choreography. He approached his dancers more in the manner of a jazz conductor, requiring them to infuse his choreography with a personal style that best suited their individual talents. This openness to input from dancers heralded a paradigm shift that brought concert dance into harmony with other forms of African-American expression, including big band jazz. Dong-Yeon Koh. 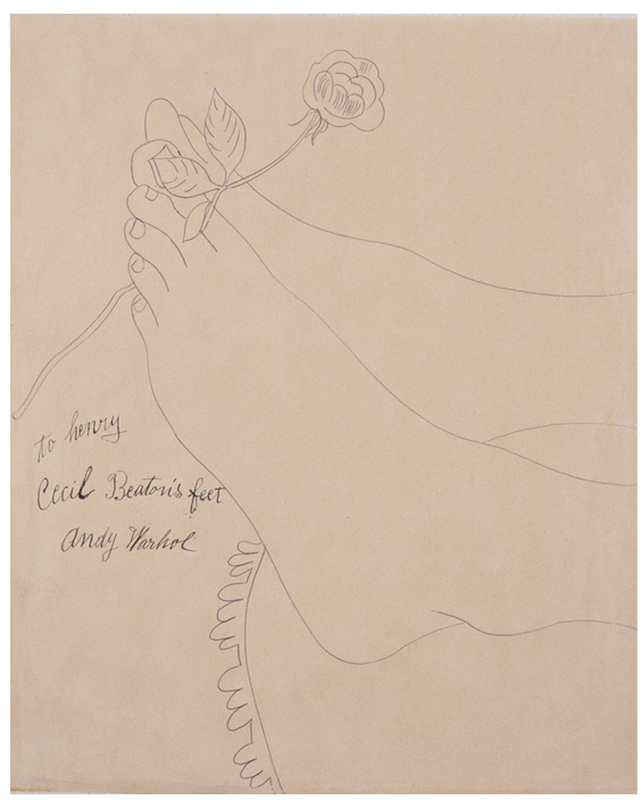 Larry Rivers and Frank O’Hara: Reframing Male Sexualities Phd dissertation 2006, pp. 196-198. Beauford Delaney (December 30, 1901 – March 26, 1979) was an American modernist painter. He is remembered for his work with the Harlem Renaissance in the 1930s and 1940s, as well as his later works in abstract expressionism following his move to Paris in the 1950s. James Arthur Baldwin (August 2, 1924 – December 1, 1987) was an American novelist, essayist, playwright, poet, and social critic. His essays, as collected in Notes of a Native Son (1955), explore palpable yet unspoken intricacies of racial, sexual, and class distinctions in Western societies, most notably in mid-20th-century America, and their inevitable if unnameable tensions. Some Baldwin essays are book-length, for instance The Fire Next Time (1963), No Name in the Street (1972), and The Devil Finds Work (1976). 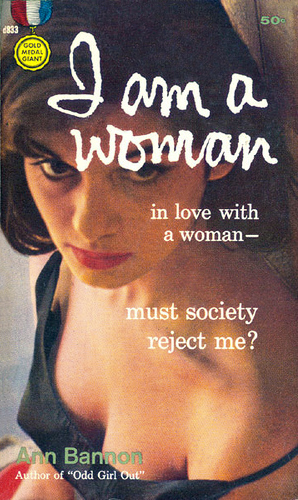 Baldwin’s novels and plays fictionalise fundamental personal questions and dilemmas amid complex social and psychological pressures thwarting the equitable integration not only of black people, but also of gay and bisexual men, while depicting some internalised obstacles to such individuals’ quests for acceptance. Such dynamics are prominent in Baldwin’s second novel, Giovanni’s Room, written in 1956, well before the gay liberation movement. 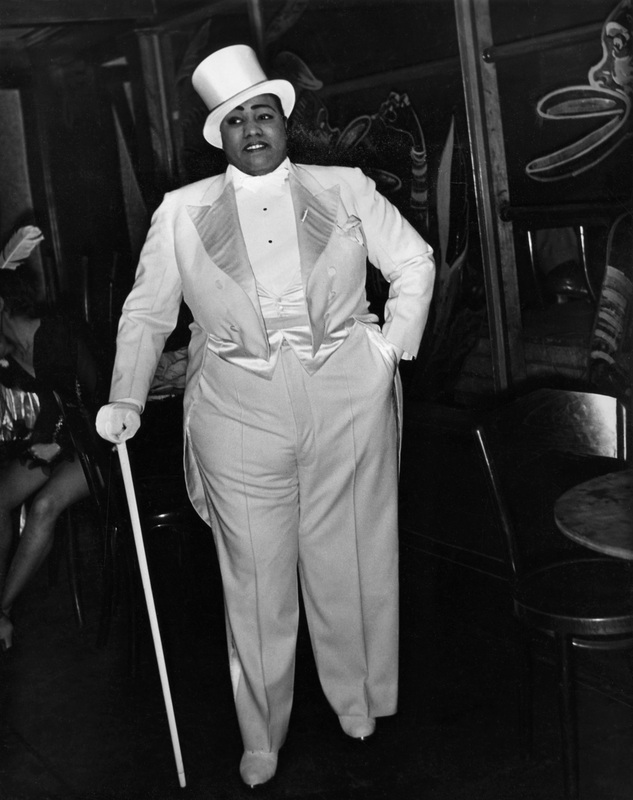 New York’s queer cultures gained remarkable visibility on the city’s stages in the 1920 and 1930s. 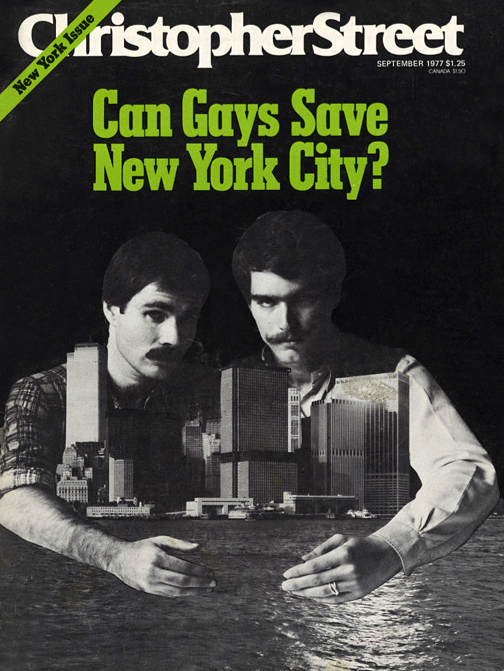 Broadway producers and nightclub owners put on plays and acts exploring gay and lesbian themes. They launched a popular “Panzy Craze,” where minorities where accepted. This period lasted until the mid-1930s when morals and ethics changed because of right-wing pressure. The film code was then in full force to protect society’s “morals” and there was, once more, open hostility towards minorities that latest into the 1970s. 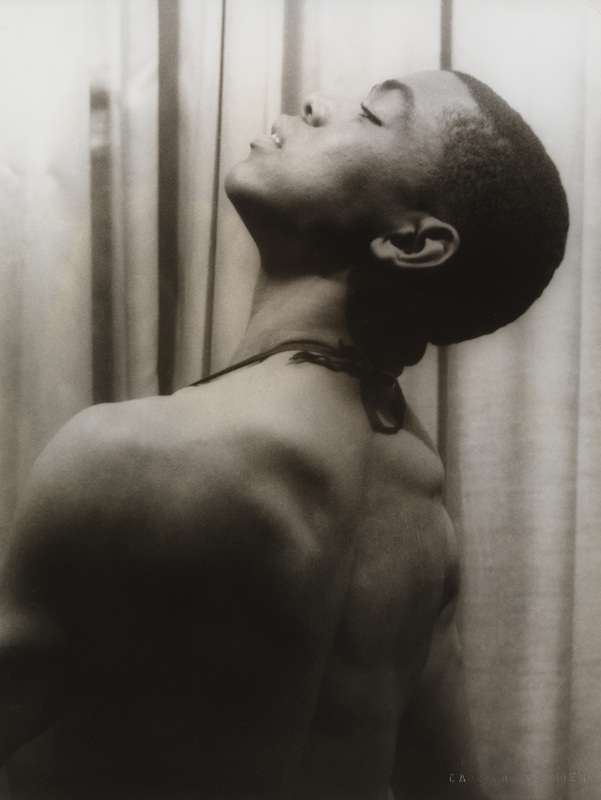 Max Ewing’s Gallery of Extraordinary Portraits encapsulates the exhibition’s wider exploration of queer communities in 20th-century New York. 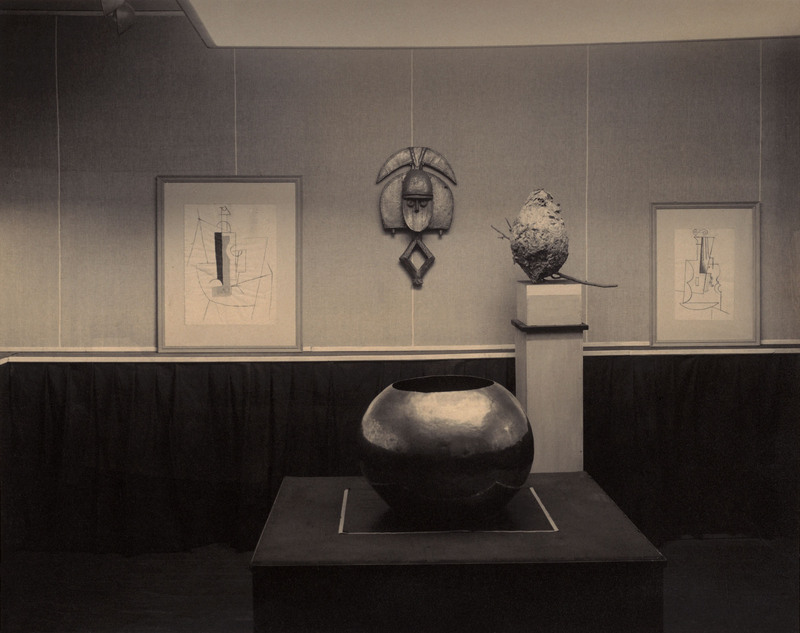 Ewing was a novelist, composer, pianist, and sculptor who created this gallery in the walk-in closet of his Manhattan studio apartment on West 31st Street. 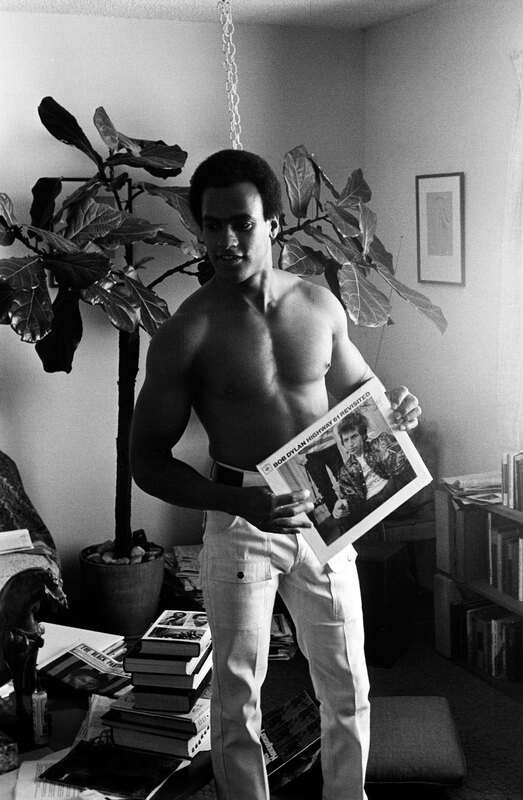 His semi-public closet exhibition paid homage to interracial, gay, and artistic communities with images of friends and celebrities plastered floor to ceiling, corner to corner. 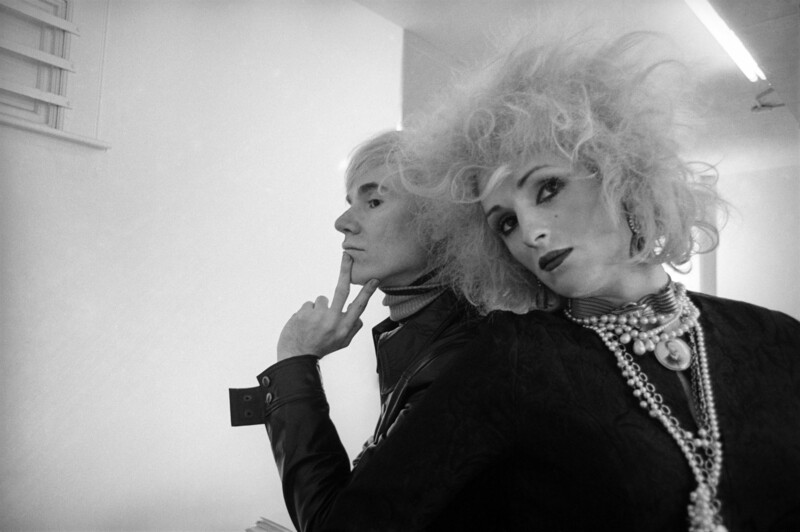 Candy Darling (November 24, 1944 – March 21, 1974) was an American transgender actress, best known as a Warhol Superstar. She starred in Andy Warhol’s films Flesh (1968) and Women in Revolt (1971), and was a muse of the protopunk band The Velvet Underground. In 1954, after a meeting with Salvador Dalí, she became his “muse”, pupil, studio assistant, and lover in both Port Lligat, Spain, and in New York City. Later, she would recall, “I realized that I was ‘surreal’, which I never knew until I met Dalí”. In the 1960s, Dufresne began to follow the progressive American Pop Art scene including Jasper Johns, Robert Rauschenberg and James Rosenquist. In 1990 she opened a studio in Nice and wrote another book detailing her own ideas about art, L’Ultratique. She lived and worked as an artist in New York City, and also maintained a studio in Nice for the rest of her life. 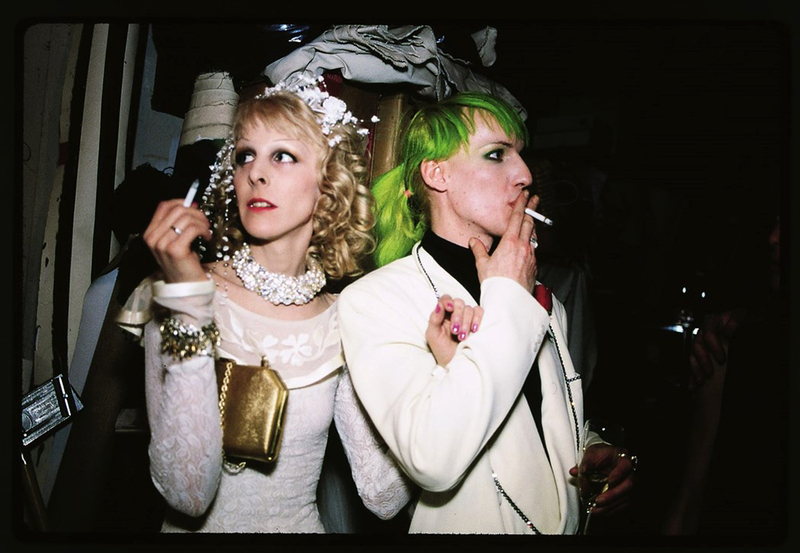 Greer Lankton (1958 – November 18, 1996) was an American artist known for creating lifelike, sewn dolls that were often modelled on friends and celebrities and posed in elaborate theatrical settings. She was a key figure in the East Village art scene of the 1980s in New York. 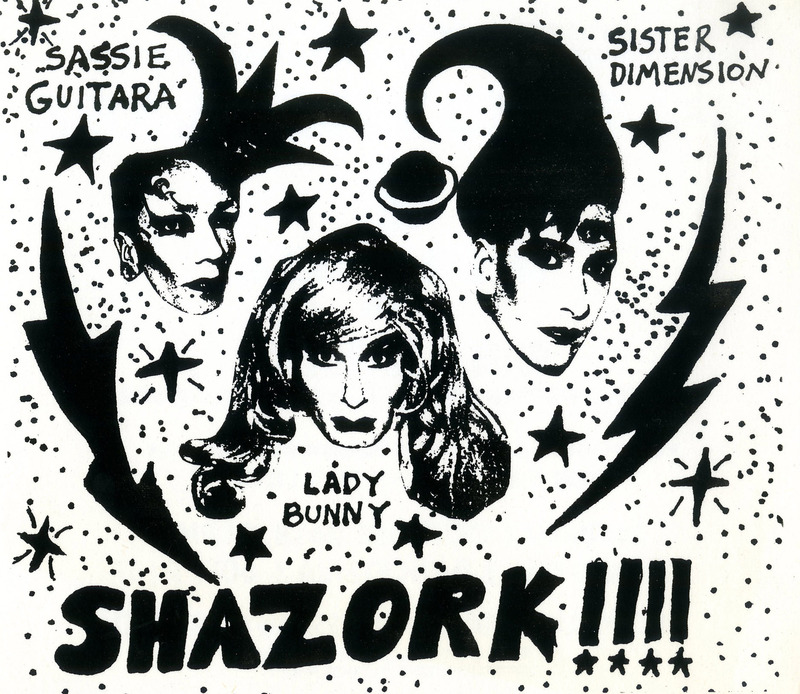 Gender and sexuality are recurring themes in Lankton’s art. 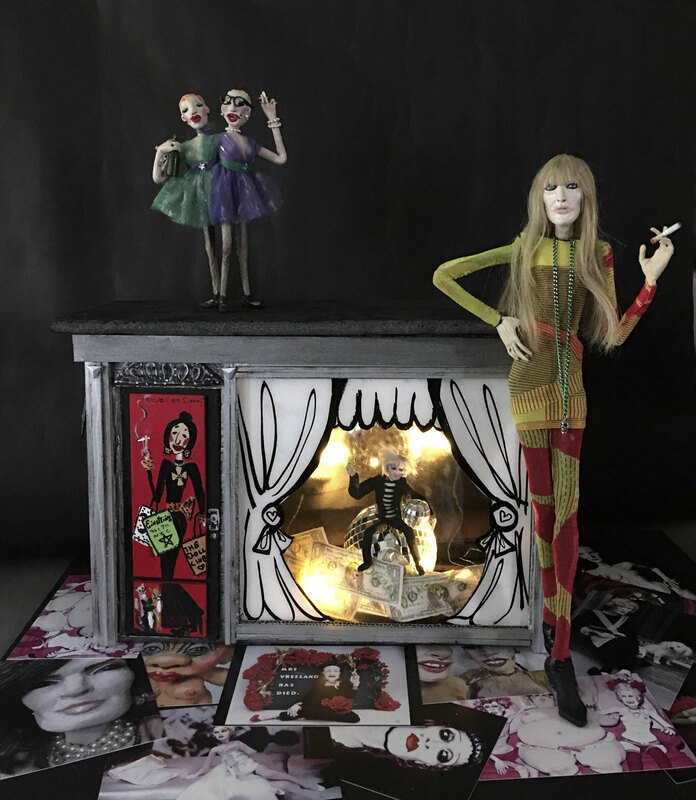 Her dolls are created in the likeness of those society calls “freaks”, and have often been compared to the surrealist works of Hans Bellmer, who made surreal dolls with interchangeable limbs. She created figures that were simultaneously distressing and glamorous, as if they were both victim and perpetrator of their existence. 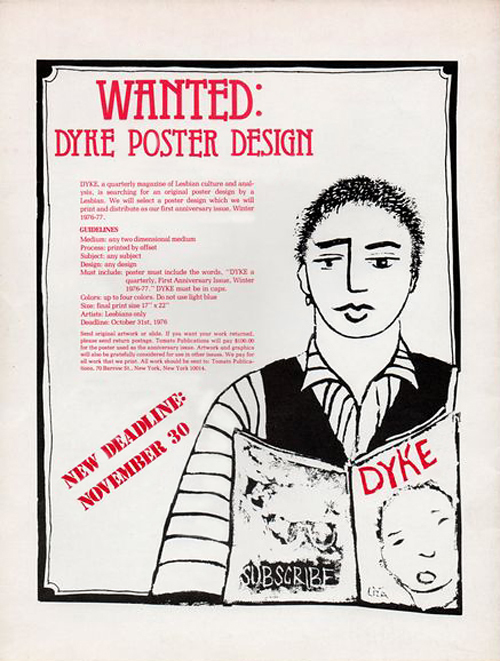 In 1981 Lankton was featured in the seminal “New York/New Wave” exhibition at P.S.1 in Long Island City, and began to show her work in the East Village at Civilian Warfare. 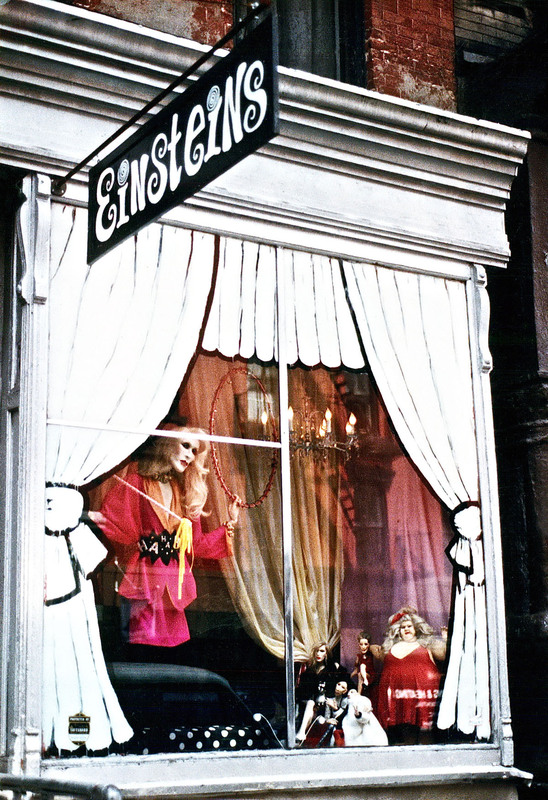 She gained an almost cult following among East Village residents from her highly theatrical window displays she designed for Einstein’s, the boutique that was run by her husband, Paul Monroe, at 96 East Seventh Street. Besides her more emotionally charged dolls, Lankton also created commissioned portrait dolls. 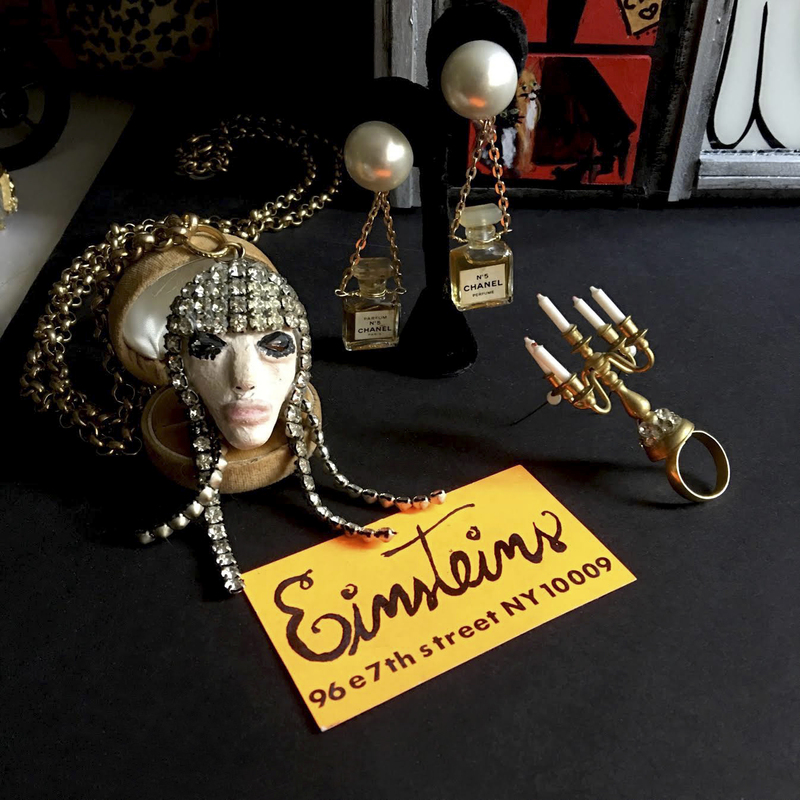 These include a 1989 doll of Diana Vreeland that was commissioned for a window display at Barney’s as well as shrines to her icons, such as Candy Darling. Greer was friends with photographer Nan Goldin, and lived in her apartment in the early 80’s, often posing for her. She also played muse to photographers like David Wojnarowicz and Peter Hujar. Mr. Snyder also created sets for dances by Bill T. Jones and Bart Cook, and for theater pieces by Ishmael Houston-Jones. 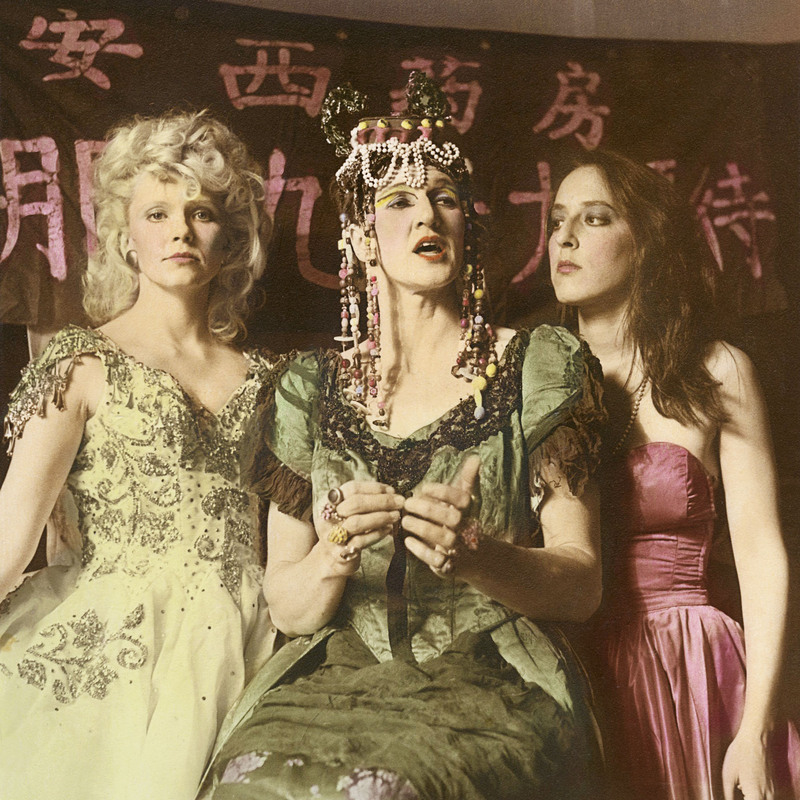 He conceived, directed and designed his own work “Circus,” a performance-art piece presented in 1987 at La Mama E.T.C. 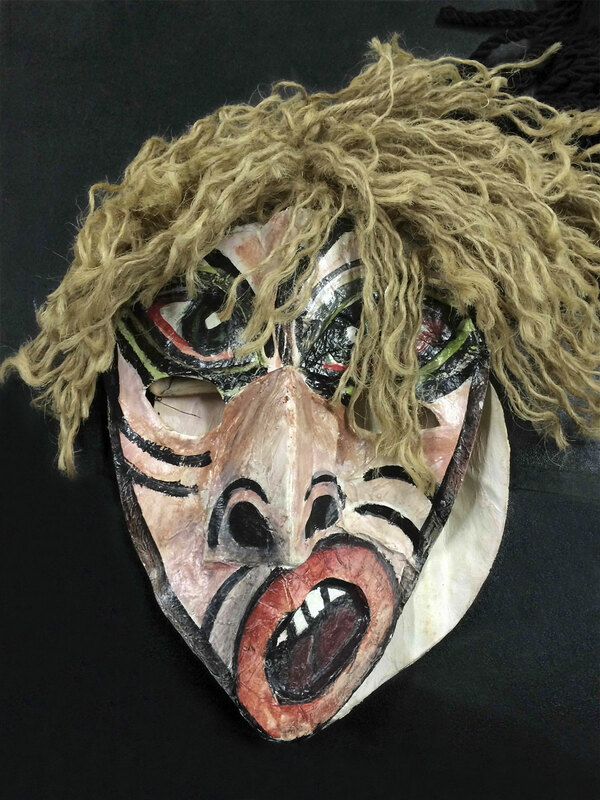 Mr. Snyder’s work has been displayed at the Lincoln Center for the Performing Arts, the Brooklyn Academy of Music and the Dance Theater Workshop in New York. 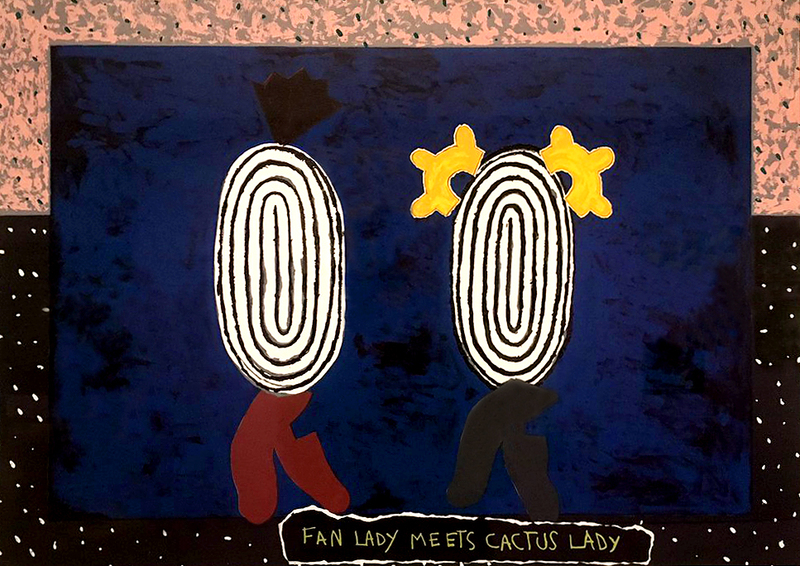 His paintings and installations have been exhibited at galleries throughout the United States and in solo and group shows in Europe and Japan. 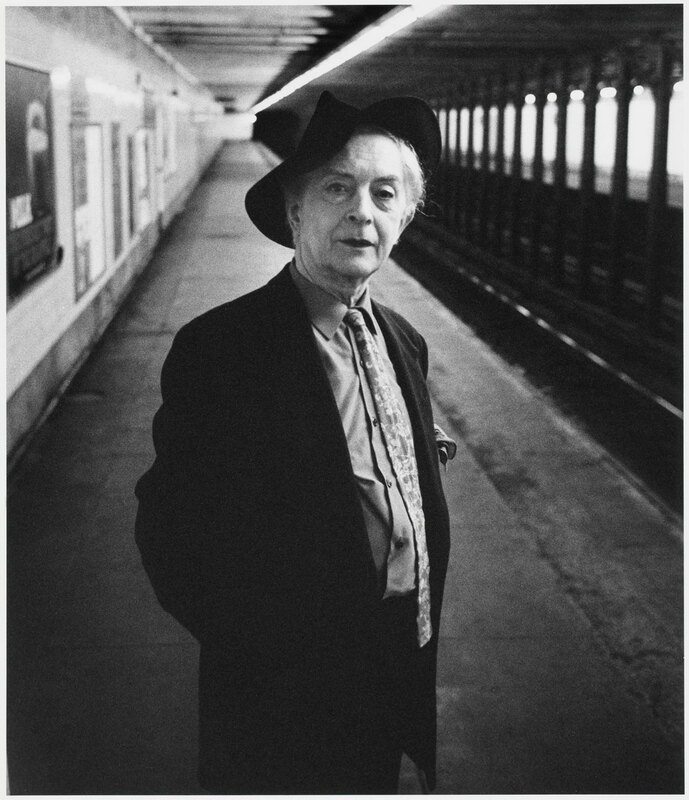 Quentin Crisp was born Denis Charles Pratt in Surrey, England, on December 25, 1908. 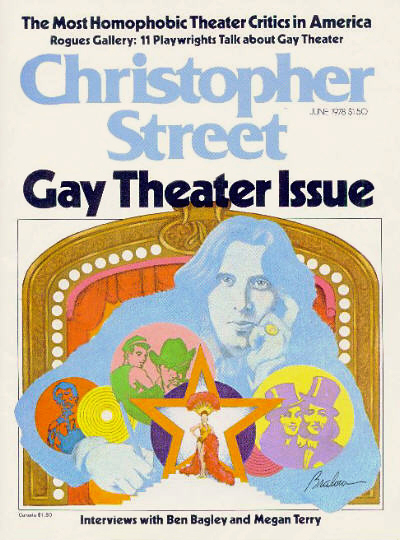 A self-described flamboyant homosexual, Crisp changed his name in his early 20s as part of his process of reinvention. Teased mercilessly at school as a boy, Crisp left school in 1926. 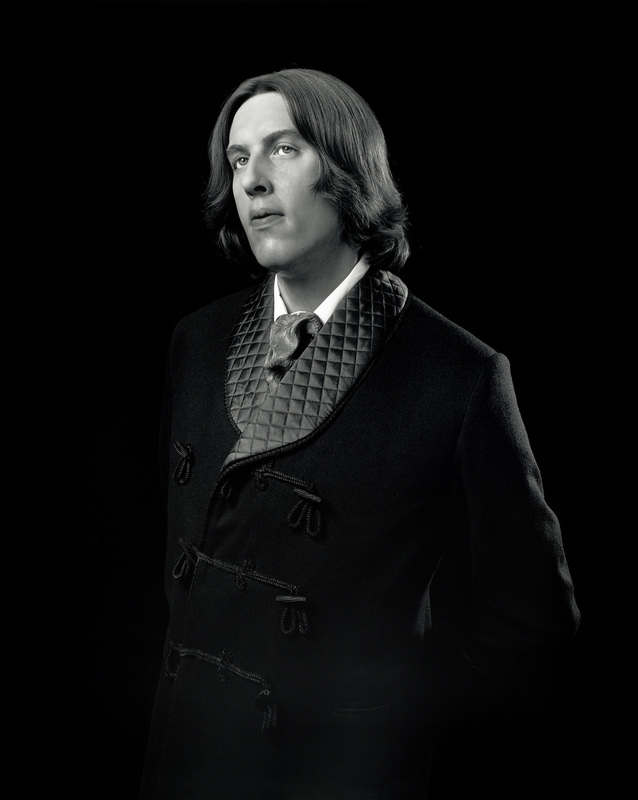 He studied journalism at King’s College London, but failed to graduate. He then moved on to take art classes at Regent Street Polytechnic. 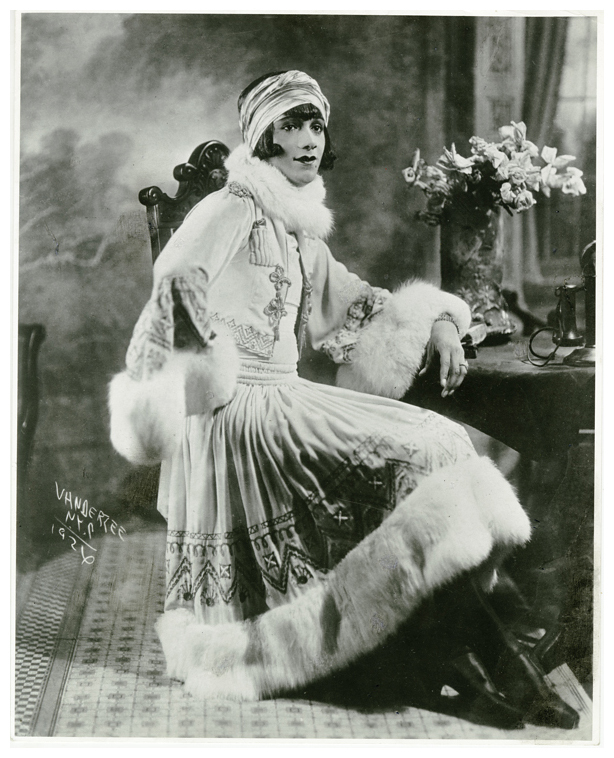 Crisp began visiting the cafés of Soho, London, and even worked as a prostitute for six months. Crisp was always true to himself and expressed himself by dying his long hair lavender, polishing his fingernails and toenails, and dressing in an often androgynous style. Despite the ridicule and violence often directed toward him, Crisp carried on. He tried to join the army with the outbreak of World War II, but was rejected by the medical board, who determined that he was suffering from sexual perversion. Instead, Crisp remained in London during the Blitz, entertaining American GIs, whose friendliness inculcated a love for Americans. Crisp continued to tour, write, and lecture; including instructions on how to live life with style and the importance of manners. Crisp landed a few roles on American television and the 1990s became his busiest decade as an actor. In 1992, Crisp took on the role of Elizabeth I in the film Orlando. Quentin Crisp died in November 1999, just shy of his 91st birthday, while touring his one-man show. 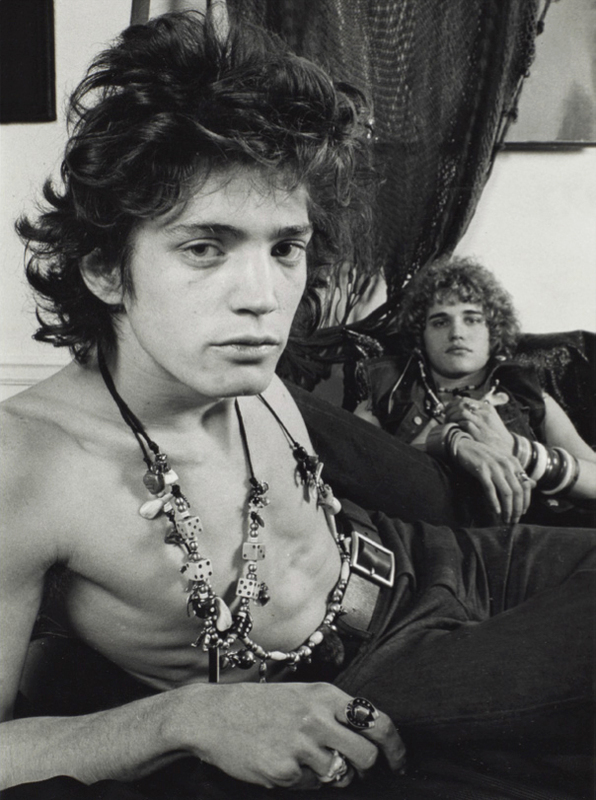 Peter Hujar (born 1934) died of AIDS in 1987, leaving behind a complex and profound body of photographs. Hujar was a leading figure in the group of artists, musicians, writers, and performers at the forefront of the cultural scene in downtown New York in the 1970s and early 80s, and he was enormously admired for his completely uncompromising attitude towards work and life. He was a consummate technician, and his portraits of people, animals, and landscapes, with their exquisite black-and-white tonalities, were extremely influential. Highly emotional yet stripped of excess, Hujar’s photographs are always beautiful, although rarely in a conventional way. His extraordinary first book, Portraits in Life and Death, with an introduction by Susan Sontag, was published in 1976, but his “difficult” personality and refusal to pander to the marketplace insured that it was his last publication during his lifetime. Susan Sontag (January 16, 1933 – December 28, 2004) was an American writer, filmmaker, teacher, and political activist. She published her first major work, the essay “Notes on ‘Camp'”, in 1964. Her best-known works include On Photography, Against Interpretation, Styles of Radical Will, The Way We Live Now, Illness as Metaphor, Regarding the Pain of Others, The Volcano Lover, and In America. It was through her essays that Sontag gained early fame and notoriety. Sontag wrote frequently about the intersection of high and low art and expanded the dichotomy concept of form and art in every medium. 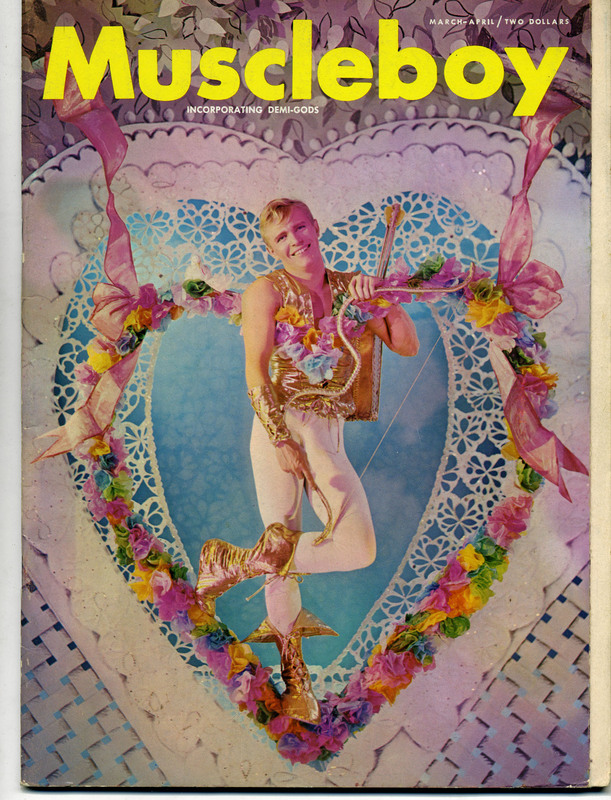 She elevated camp to the status of recognition with her widely read 1964 essay “Notes on ‘Camp’,” which accepted art as including common, absurd and burlesque themes. 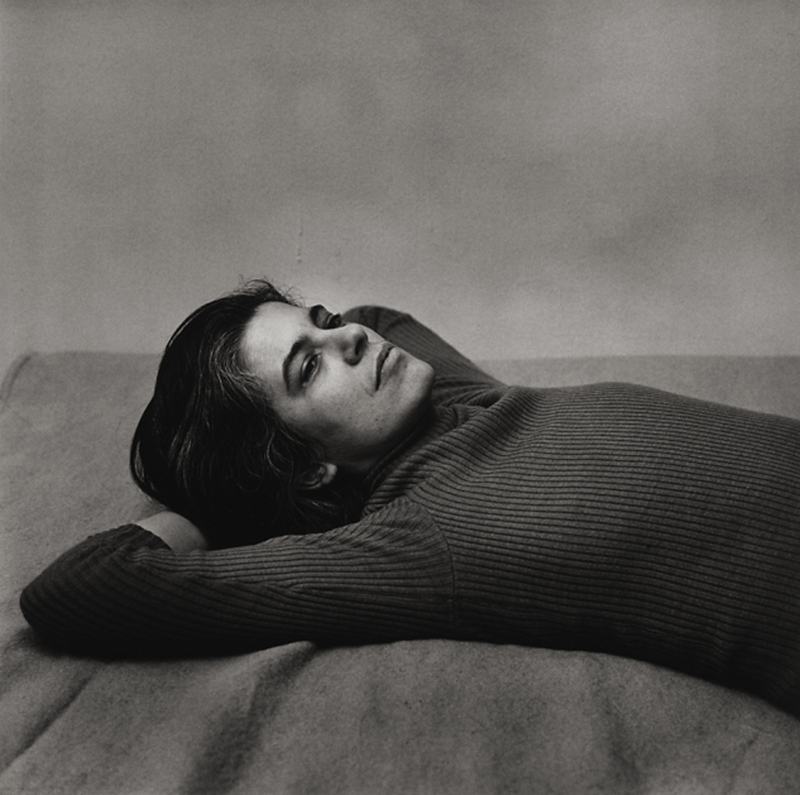 In 1977, Sontag published the series of essays On Photography. These essays are an exploration of photographs as a collection of the world, mainly by travelers or tourists, and the way we experience it… She became a role-model for many feminists and aspiring female writers during the 1960s and 1970s. 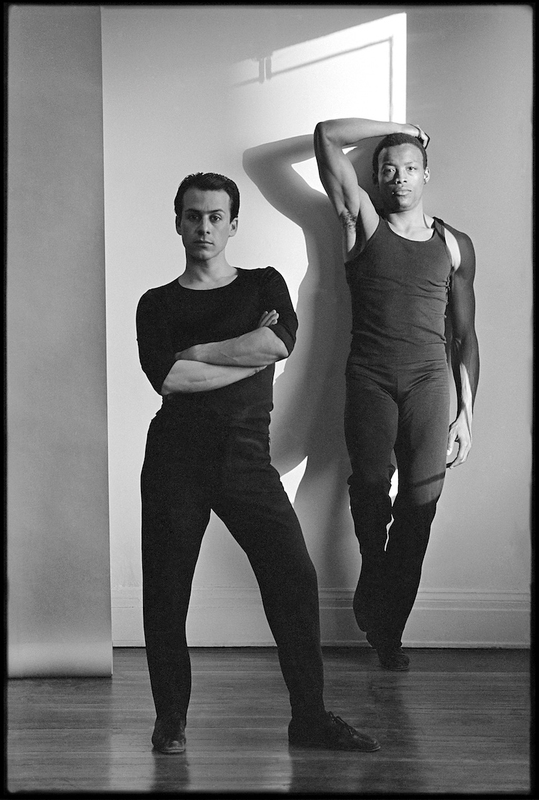 Muna Tseng Dance Projects Inc.
Tseng Kwong Chi, known as Joseph Tseng prior to his professional career (Chinese: 曾廣智; c. 1950 – March 10, 1990), was a Hong Kong-born American photographer who was active in the East Village art scene in the 1980s. Tseng was part of an circle of artists in the 1980s New York art scene including Keith Haring, Kenny Scharf, and Cindy Sherman. 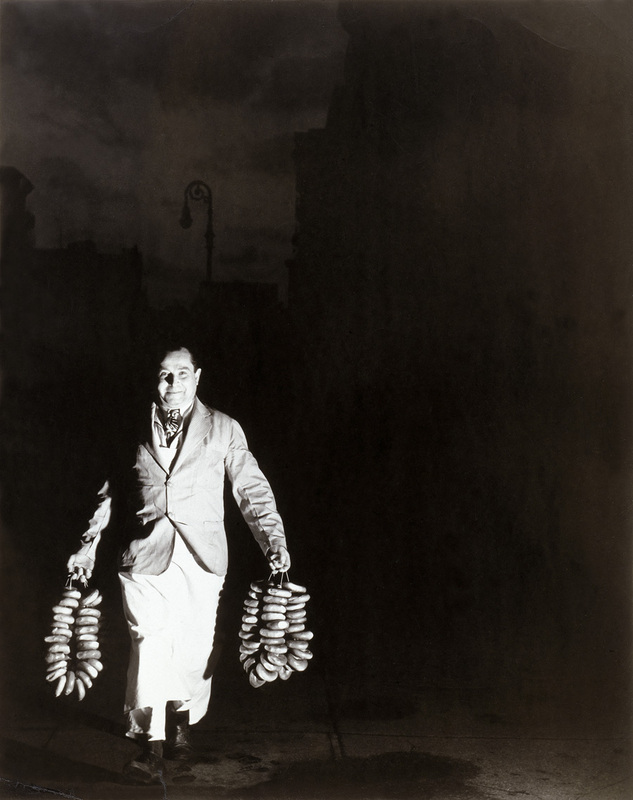 Tseng’s most famous body of work is his self-portrait series, East Meets West, also called the “Expeditionary Series”. 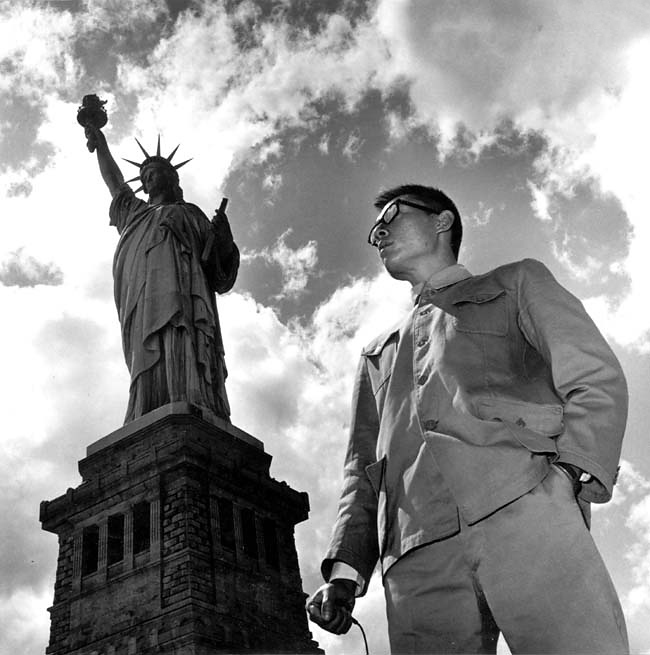 In the series, Tseng dressed in what he called his “Mao suit” and sunglasses (dubbed a “wickedly surrealistic persona” by the New York Times), and photographed himself situated, often emotionlessly, in front of iconic tourist sites. These included the Statue of Liberty, Cape Canaveral, Disney Land, Notre Dame de Paris, and the World Trade Center. 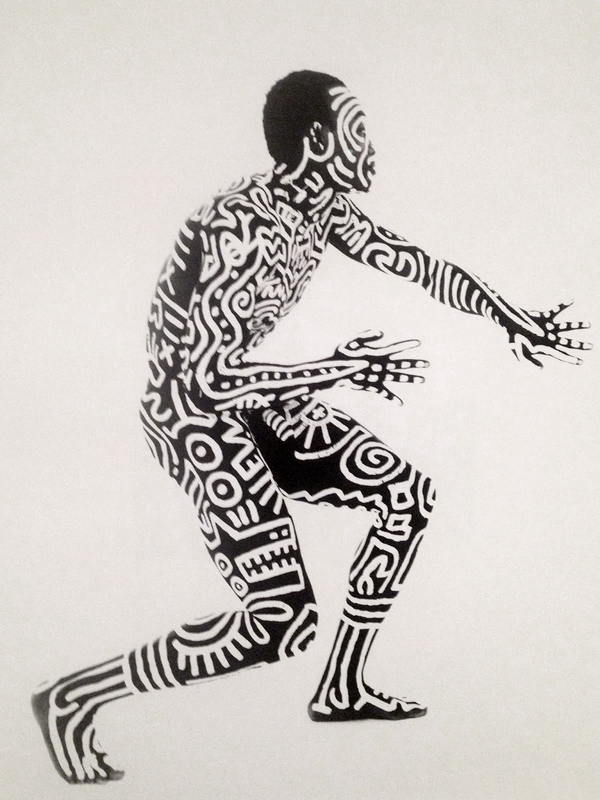 Tseng also took tens of thousands of photographs of New York graffiti artist Keith Haring throughout the 1980s working on murals, installations and the subway. 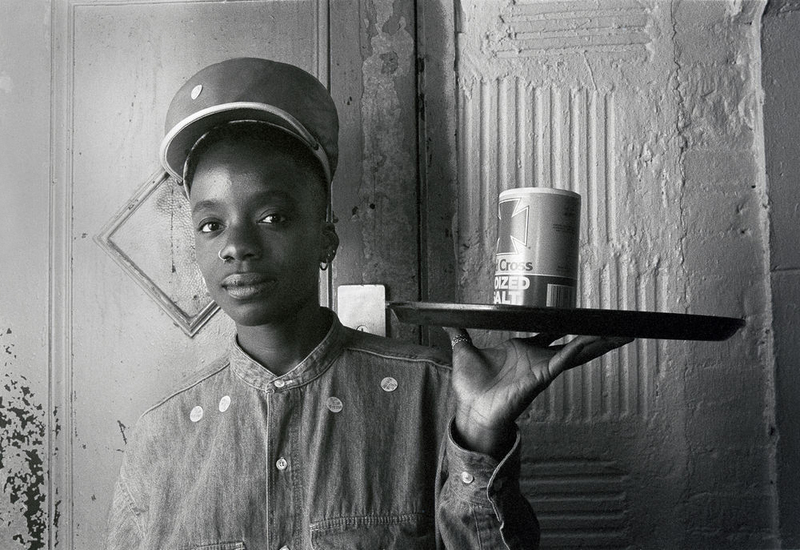 In 1984, his photographs were shown with Haring’s work at the opening of the Semaphore Gallery’s East Village location in a show titled “Art in Transit”. Tseng photographed the first Concorde landing at Kennedy International Airport, from the tarmac. 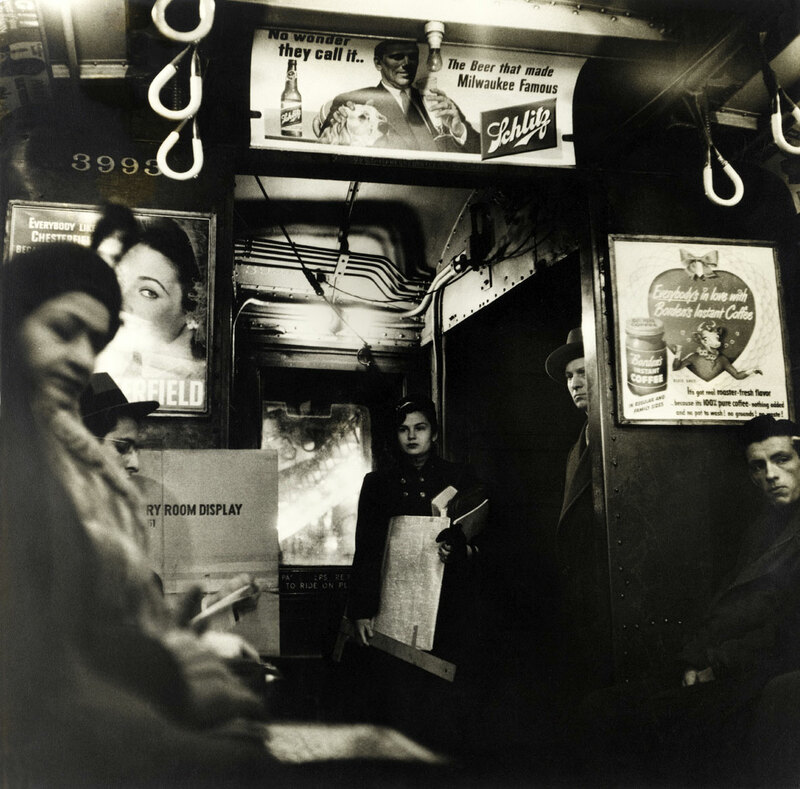 According to his sister, Tseng drew artistic influence from Brassai and Cartier-Bresson. Curators: Sarah Greenough, senior curator, department of photographs, and Philip Brookman, consulting curator, department of photographs, both National Gallery of Art, are the exhibition curators. The last posting of a fruitful year for Art Blart. I wish all the readers of Art Blart a happy and safe New Year! The exhibition is organized around five themes – movement, sequence, narrative, studio, and identity – found in the work of Muybridge and Stieglitz, themes then developed in the work of other artists. While there is some interesting work in the posting, the conceptual rationale and stand alone nature of the themes and the work within them is a curatorial ordering of ideas that, in reality, cannot be contained within any one boundary, the single point of view. 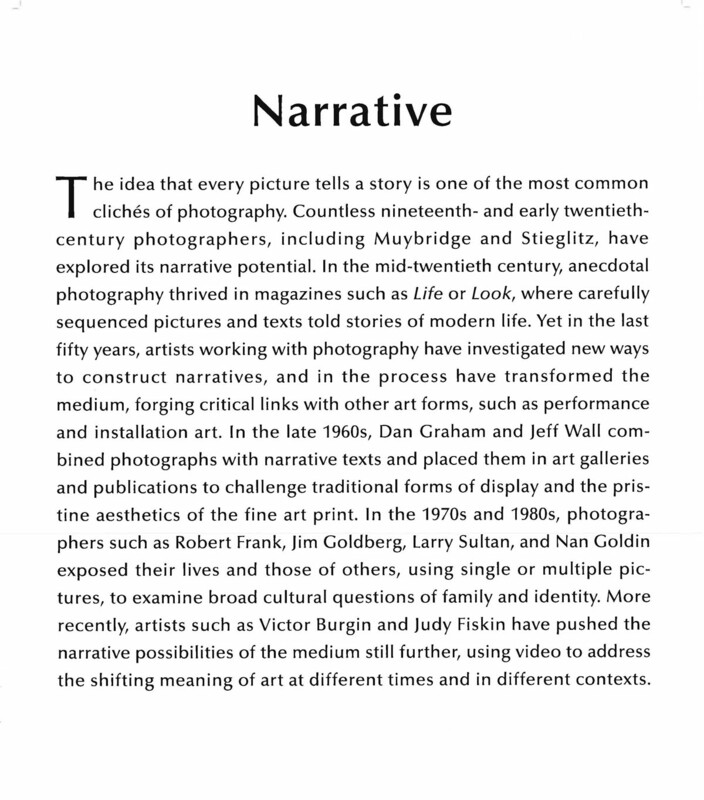 Movement can be contained in sequences; narrative can be unfolded in a sequence (as in the work of Duane Michals); narrative and identity have a complex association which can also be told through studio work (eg. 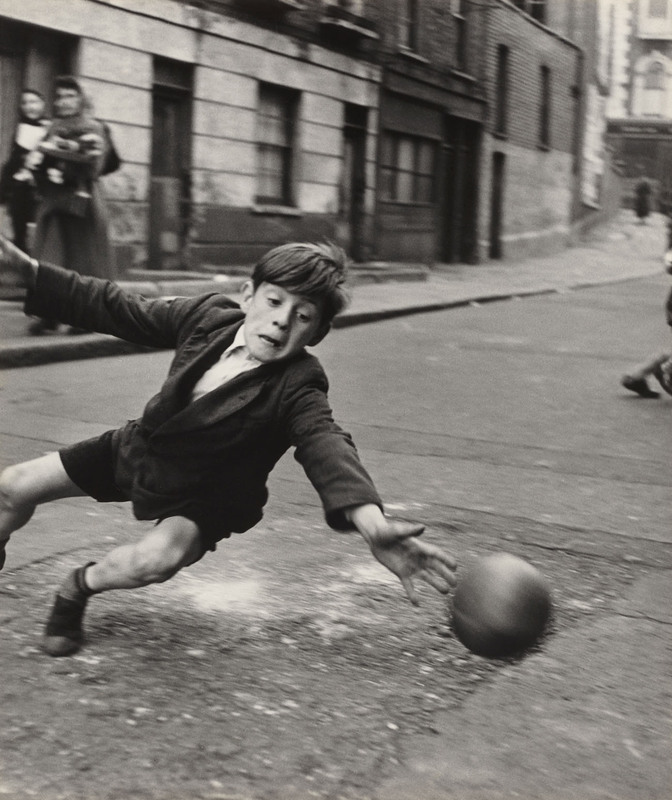 Gregory Crewdson), etc… What does Roger Mayne’s Goalie, Street Football, Brindley Road (1956, below) not have to do with identity, the young lad with his dirty hands, playing in his socks, in a poverty stricken area of London; why has Hiroshi Sugimoto’s Oscar Wilde (1999, below) been included in the studio section when it has much more to do with the construction of identity through photography- “Triply removing his portrait from reality – from Oscar Wilde himself to a portrait photograph to a wax sculpture and back to a photograph” – which confounds our expectations of the nature of photography. Photography is nefariously unstable in its depiction of an always, constructed reality, through representation(s) which reject simple causality. To isolate and embolden the centre is to disclaim and disavow the periphery, work which crosses boundaries, is multifaceted and multitudinous; work which forms a nexus for networks of association beyond borders, beyond de/lineation – the line from here to there. The self-contained themes within this exhibition are purely illusory. Many thankx to the National Gallery of Art for allowing me to publish the photographs in the posting. Please click on the photographs for a larger version of the image. “Intersections: Photographs and Videos from the National Gallery of Art and the Corcoran Gallery of Art explores the connections between the two newly joined photography collections. On view from May 29, 2016, through January 2, 2017, the exhibition is organized around themes found in the work of the two pioneers of each collection: Eadweard Muybridge (1830-1904) and Alfred Stieglitz (1864-1946). Inspired by these two seminal artists, Intersections brings together more than 100 highlights of the recently merged collections by a range of artists from the 1840s to today. 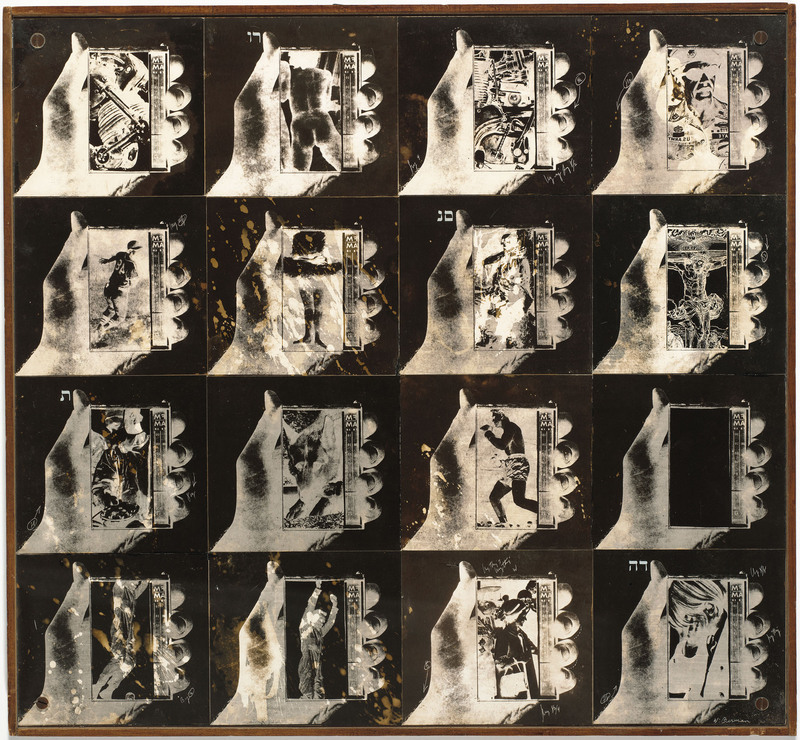 The exhibition is organized around five themes – movement, sequence, narrative, studio, and identity – found in the work of Muybridge and Stieglitz. 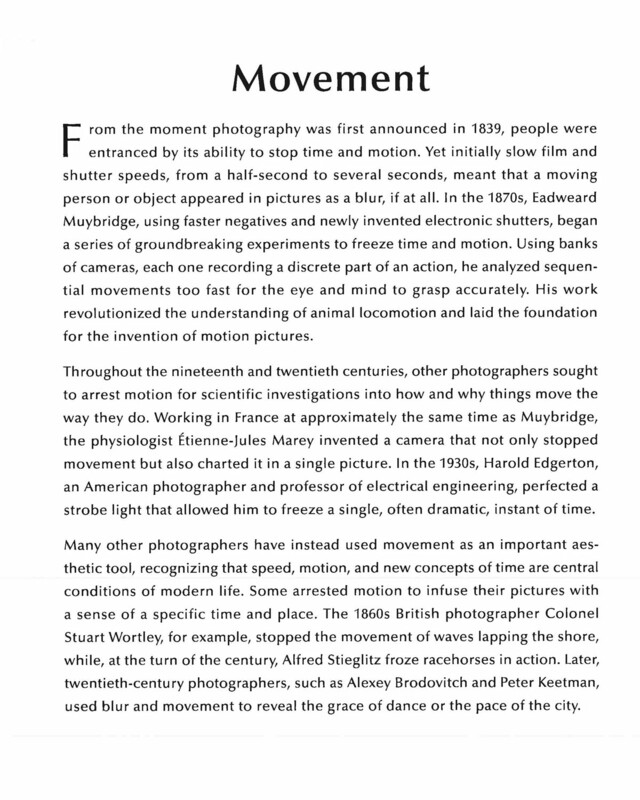 Works by Muybridge, who is best known for creating photographic technologies to stop and record motion, anchor the opening section devoted to movement. 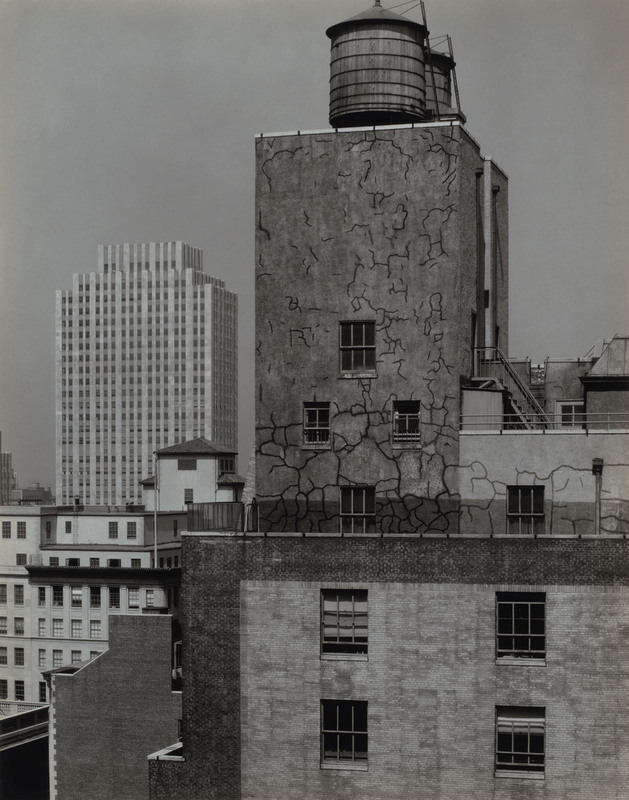 Photographs by Berenice Abbott and Harold Eugene Edgerton, which study how objects move through space, are included, as are works by Roger Mayne, Alexey Brodovitch, and other who employed the camera to isolate an instant from the flux of time. 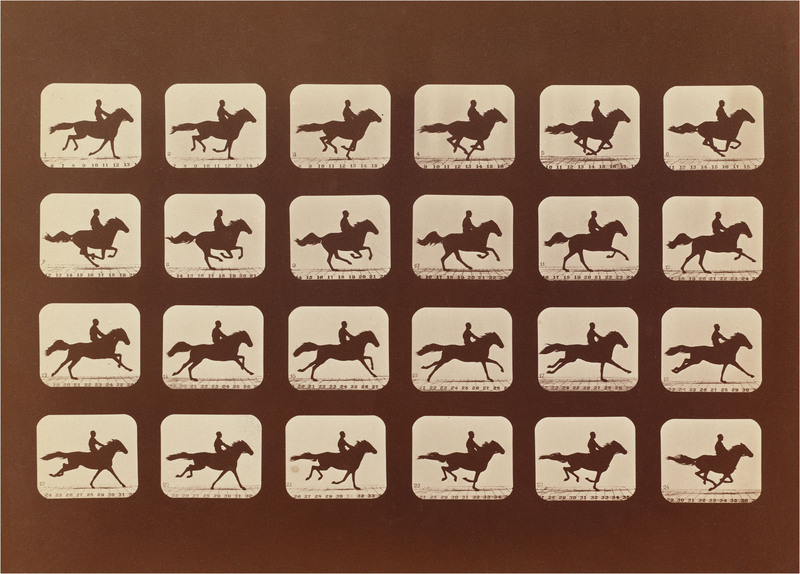 In order to analyze the movement of racehorses, farm animals, and acrobats, Muybridge pioneered new and innovative ways to stop motion with photography. In 1878, he started making pictures at railroad magnate Leland Stanford’s horse farm in Palo Alto, California, where he developed an electronic shutter that enabled exposures as fast as one-thousandth of a second. In this print from Muybridge’s 1881 album The Attitudes of Animals in Motion, Stanford’s prized racehorse Phryne L is shown running in a sequential grid of pictures made by 24 different cameras with electromagnetic shutters tripped by wires as the animal ran across the track. These pictures are now considered a critical step in the development of cinema. 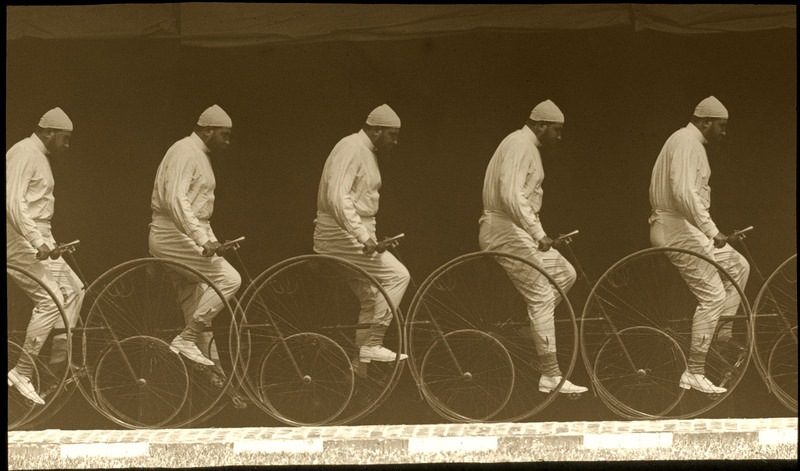 This glass negative shows the sequence of Leland Stanford’s horse Abe Edgington trotting across a racetrack in Palo Alto, California – a revolutionary record of the changes in the horse’s gait in about one second. Muybridge composed the negative from photographs made by eight different cameras lined up to capture the horse’s movements. 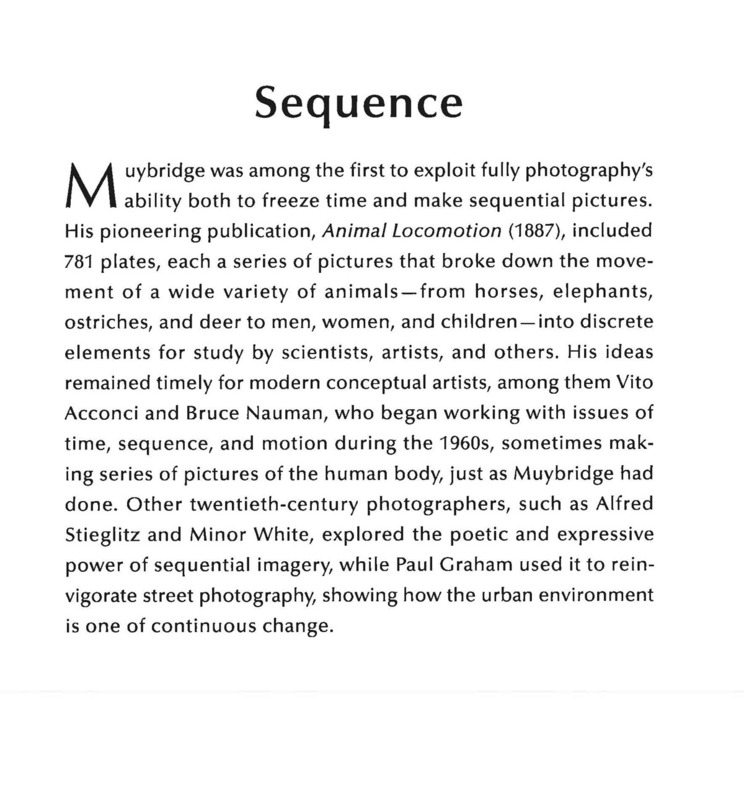 Used to print the whole sequence together onto albumen paper, this internegative served as an intermediary step in the production of Muybridge’s 1881 album The Attitudes of Animals in Motion. A scientist and physiologist, Marey became fascinated with movement in the 1870s. Unlike Muybridge, who had already made separate pictures of animals in motion, Marey developed in 1882 a means to record several phases of movement onto one photographic plate using a rotating shutter with slots cut into it. 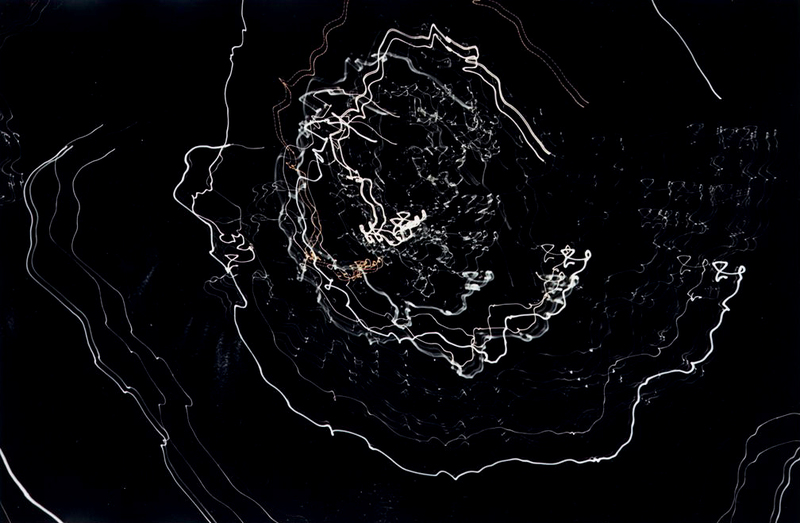 He called this process “chronophotography,” meaning photography of time. His photographs, which he published in books and showed in lantern slide presentations, influenced 20th-century cubist, futurist, and Dada artists who examined the interdependence of time and space. 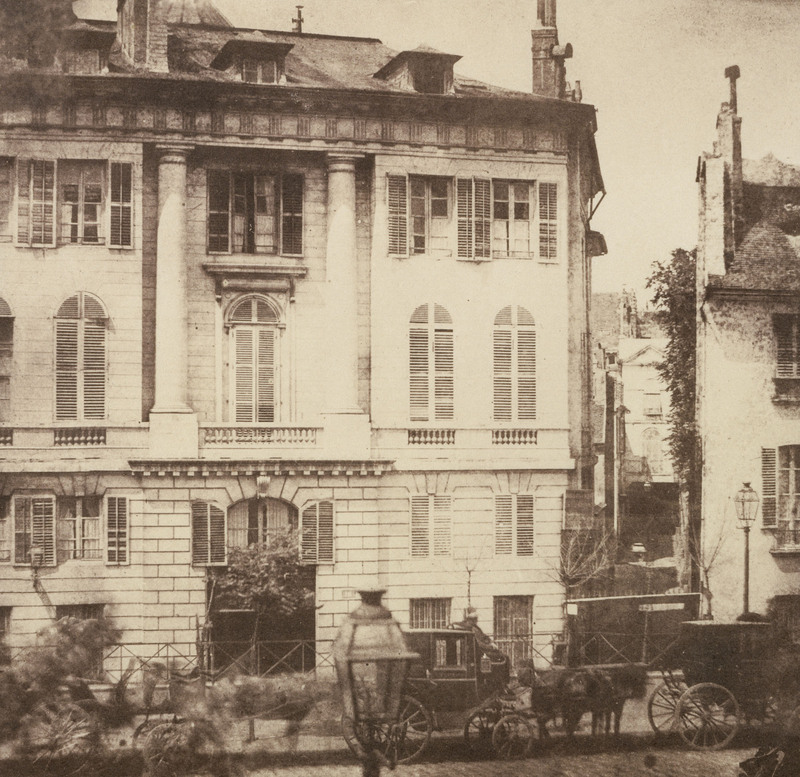 As soon as Talbot announced his invention of photography in 1839, he realized that its ability to freeze time enabled him to present the visual spectacle of the world in an entirely new way. By capturing something as mundane as a fleeting moment on a busy street, he could transform life into art, creating a picture that could be savored long after the event had transpired. 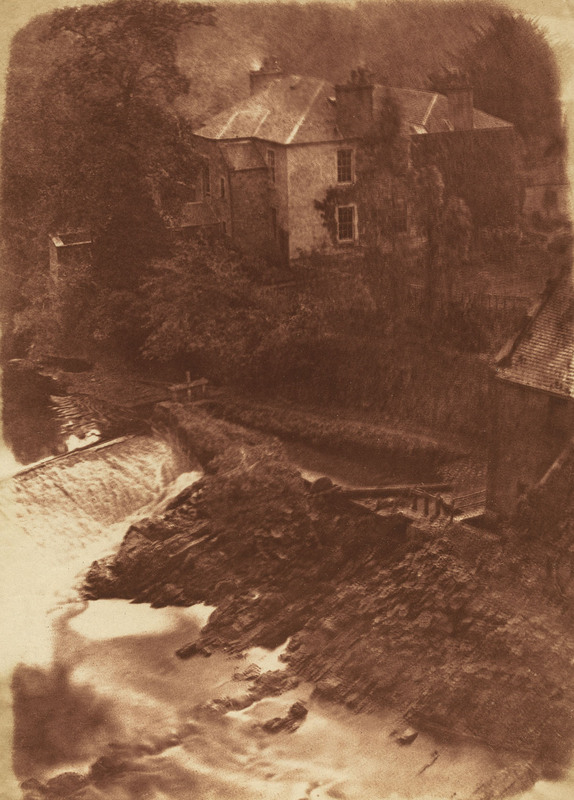 In 1843, only four years after Talbot announced his negative/positive process of photography, painter David Octavius Hill teamed up with engineer Robert Adamson. Working in Scotland, they created important early portraits of the local populace and photographed Scottish architecture, rustic landscapes, and city scenes. Today a suburb southwest of Edinburgh, 19th-century Colinton was a mill town beside a river known as the Water of Leith. Because of the long exposure time required to make this photograph, the water rushing over a small dam appears as a glassy blur. 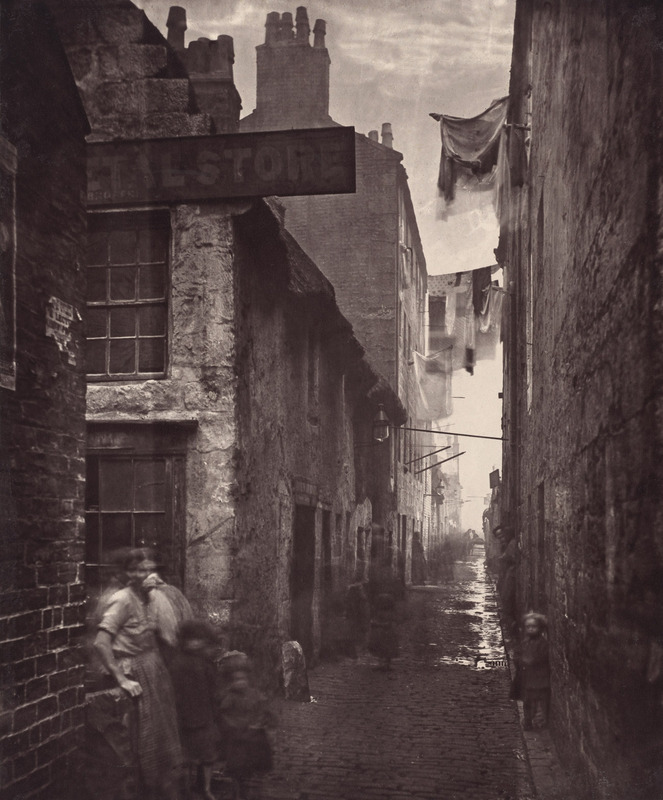 In 1868, Glasgow’s City Improvements Trust hired Annan to photograph the “old closes and streets of Glasgow” before the city’s tenements were demolished. 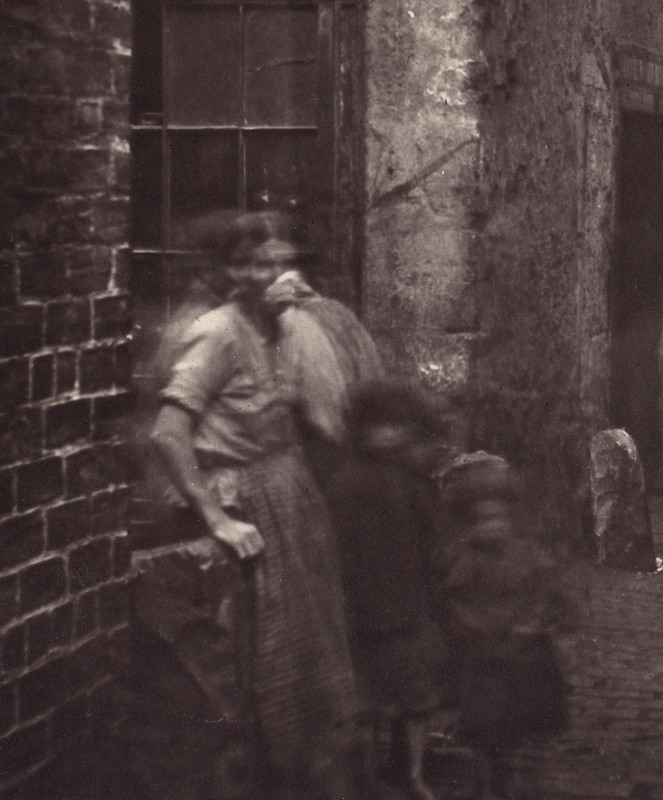 Annan’s pictures constitute one of the first commissioned photographic records of living conditions in urban slums. The collodion process Annan used to make his large, glass negatives required a long exposure time. In the dim light of this narrow passage, it was impossible for the photographer to stop the motion of the restless children, who appear as ghostly blurs moving barefoot across the cobblestones. In the 1880s and 1890s, improvements in photographic processes enabled manufacturers to produce small, handheld cameras that did not need to be mounted on tripods. Faster film and shutter speeds also allowed practitioners to capture rapidly moving objects. Stieglitz was one of the first fine art photographers to exploit the aesthetic potential of these new cameras and films. 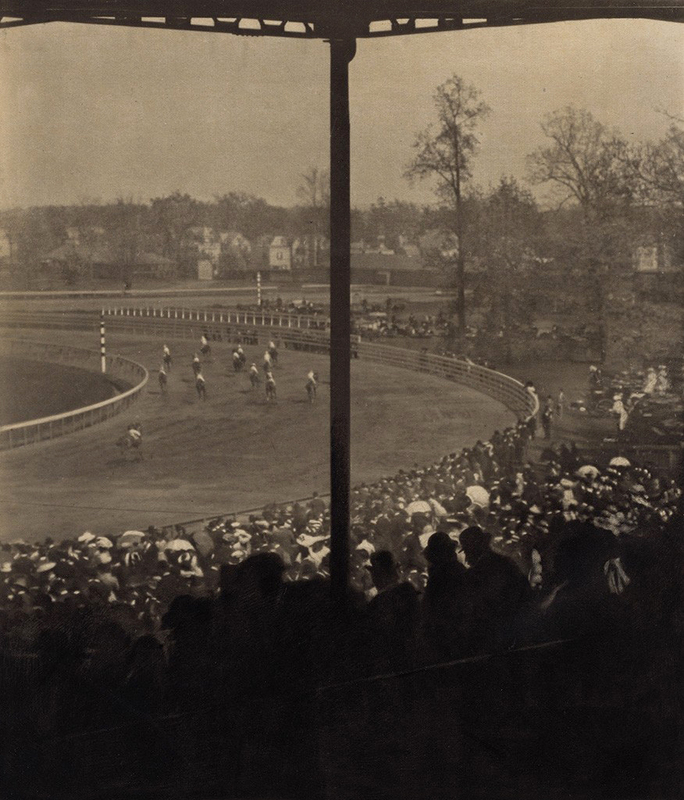 Around the turn of the century, he made many photographs of rapidly moving trains, horse-drawn carriages, and racetracks that capture the pace of the increasingly modern city. Image: 11 1/2 x 9 5/8 in. Sheet: 13 15/16 x 11 in. A professor of electrical engineering at the Massachusetts Institute of Technology, Edgerton in the early 1930s invited the stroboscope, a tube filled with gas that produced high-intensity bursts of light at regular and very brief intervals. He used it to illuminate objects in motion so that they could be captured by a camera. At first he was hired by industrial clients to reveal flaws in their production of materials, but bt the mid-1930s he began to photography everyday events… Edgerton captured phenomena moving too fast for the naked eye to see, and revealed the beauty of people and objects in motion. A graphic artist, Russian-born Brodovitch moved to the United States from Paris in 1930. Known for his innovative use of photographs, illustrations, and type on the printed page, he became art director for Harper’s Bazaar in 1934, and photographed the Ballets Russes de Monte Carlo during their American tours from 1935 to 1939. 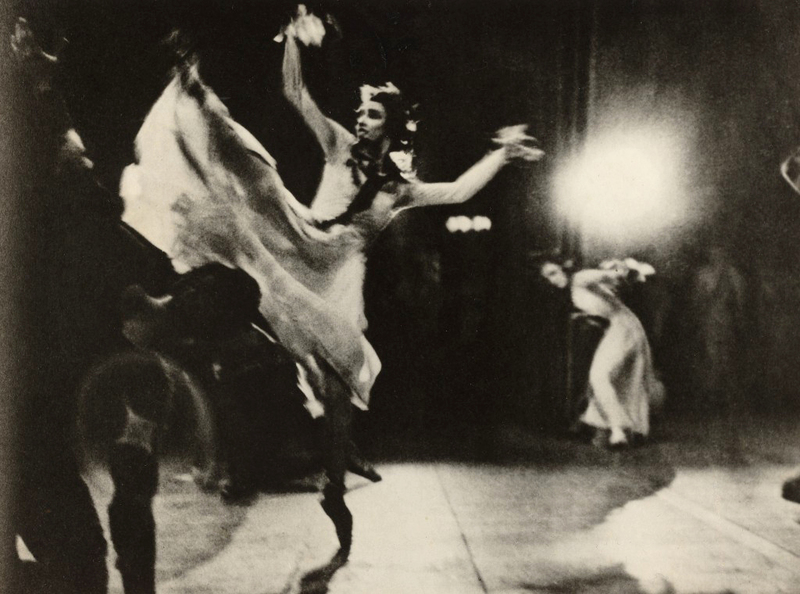 Using a small-format, 35 mm camera, Brodovitch worked in the backstage shadows and glaring light of the theater to produce a series of rough, grainy pictures that convey the drama and action of the performance. This photograph employs figures in motion, a narrow field of focus, and high-contrast effects to express the stylized movements of Léonide Massine’s 1938 choreography for Beethoven’s Seventh Symphony. Image: 8 3/4 x 13 5/8 in. Sheet: 10 3/8 x 13 15/16 in. Gare Saint-Lazare is one of the principal railway stations in Paris. Because of its industrial appearance, steaming locomotives, and teeming crowds, it was a frequent subject for 19th-century French painters – including Claude Monet, Édouard Manet, and Gustave Caillebotte – who used it to express the vitality of modern life. 20th-century artists such as Horvat also depicted it to address the pace and anonymity that defined their time. Using a telephoto lens and long exposure, he captured the rushing movement of travelers scattered beneath giant destination signs. From 1956 to 1961, Mayne photographed London’s North Kensington neighborhood to record its emergence from the devastation and poverty caused by World War II. This dramatic photograph of a young goalie lunging for the ball during an after-school soccer game relies on the camera’s ability to freeze the fast-paced and unpredictable action. Because the boy’s daring lunge is forever suspended in time, we will never know its outcome. Best known for his expressive documentation of World War II’s impact on Japanese culture, Tomatsu was one of Japan’s most creative and influential photographers. 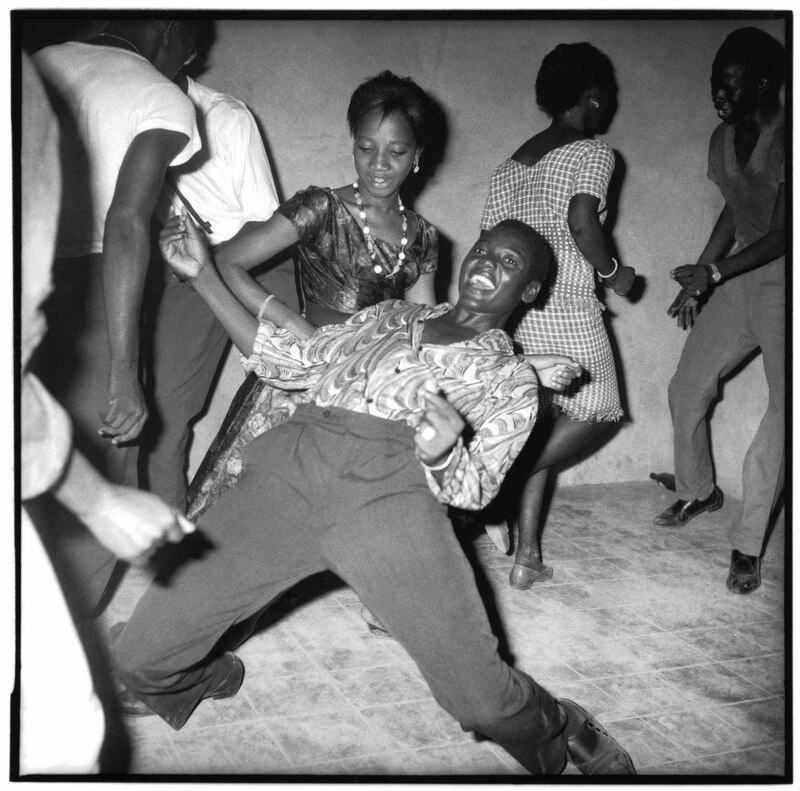 Starting in the early 1960s, he documented the country’s dramatic economic, political, and cultural transformation. This photograph – a long exposure made with his camera mounted on a tripod – conveys the chaotic rush of commuters on their way through downtown Tokyo. 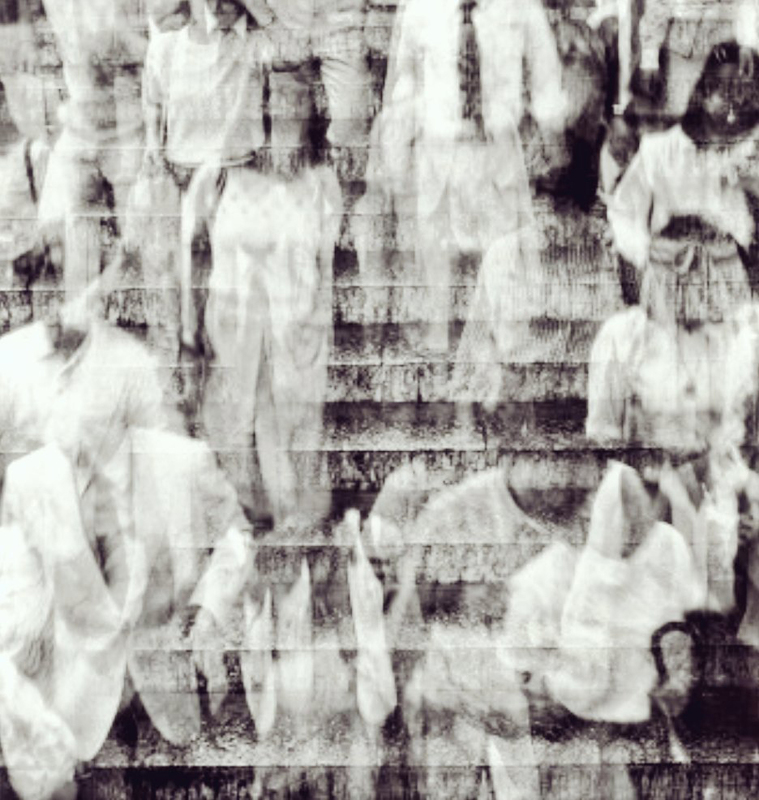 Tomatsu used this graphic description of movement, which distorts the faceless bodies of commuters dashing down a flight of stairs, to symbolize the dehumanizing nature of work in the fast-paced city of the early 1980s. 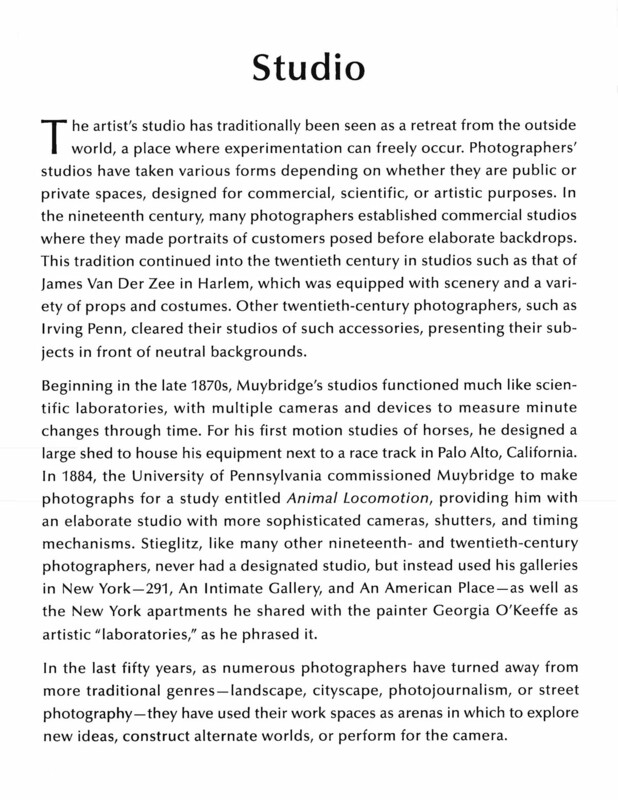 Muybridge set up banks of cameras and used electronic shutters triggered in sequence to analyze the motion of people and animals. Like a storyteller, he sometimes adjusted the order of images for visual and sequential impact. 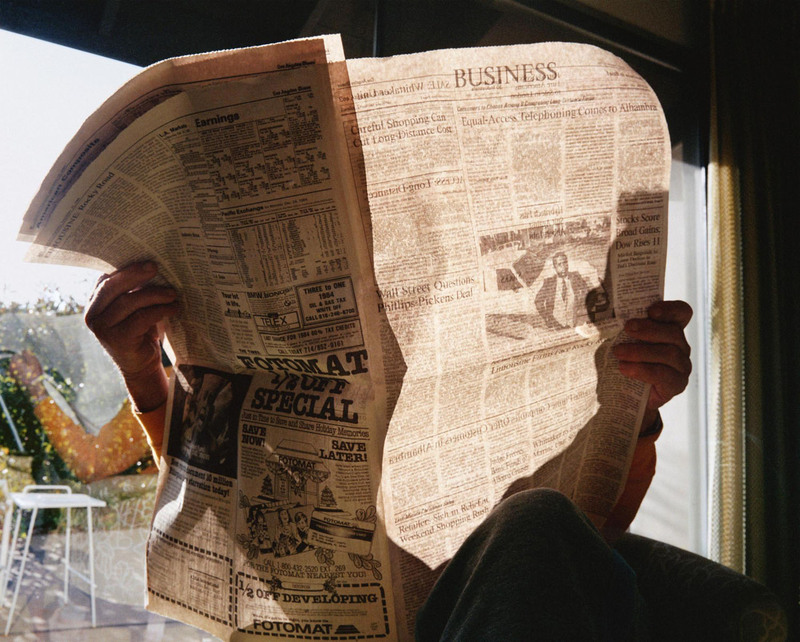 Other photographers have also investigated the medium’s capacity to record change over time, express variations on a theme, or connect seemingly disparate pictures. In the early 1920s, Stieglitz began to create poetic sequences of cloud photographs meant to evoke distinct emotional experiences. These works (later known as Equivalents) influenced Ansel Adams and Minor White – both artists created specific sequences to evoke the rhythms of nature or the poetry of time passing. Offset lithography book: 7 x 5 3/4 in. (17.78 x 14.61 cm) unfolded (open flat): 7 x 276 in. 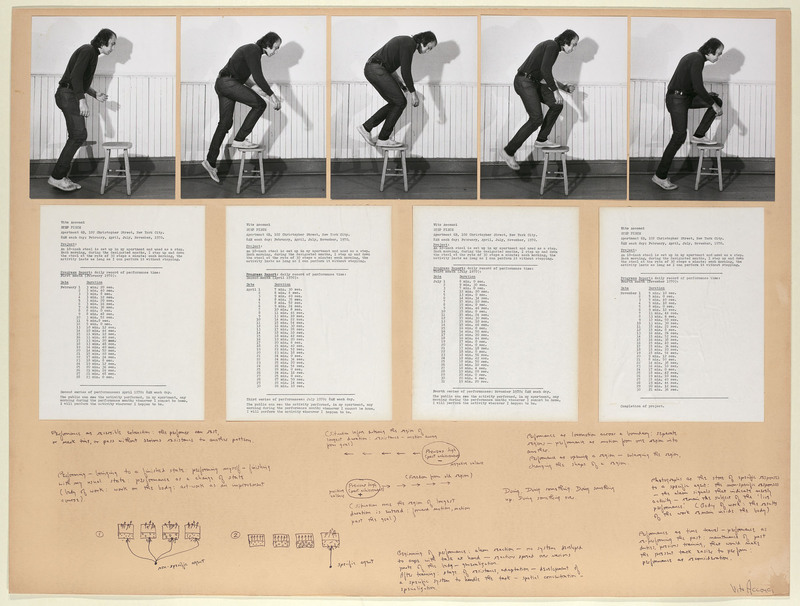 Acconci’s Step Piece is made up of equal parts photography, drawing, performance, and quantitative analysis. It documents a test of endurance: stepping on and off a stool for as long as possible every day. This performance-based conceptual work is rooted in the idea that the body itself can be a medium for making art. 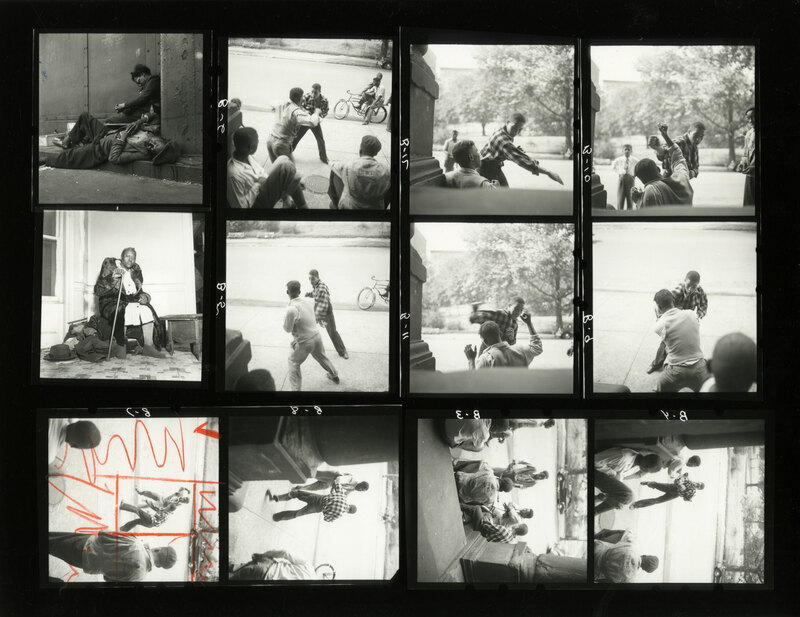 To record his activity, Acconci made a series of five photographs spanning one complete action. Like the background grid in many of Muybridge’s motion studies, vertical panels in Acconci’s studio help delineate the space. His handwritten notes and sketches suggest the patterns of order and chaos associated with the performance, while typewritten sheets, which record his daily progress, were given to people who were invited to observe. 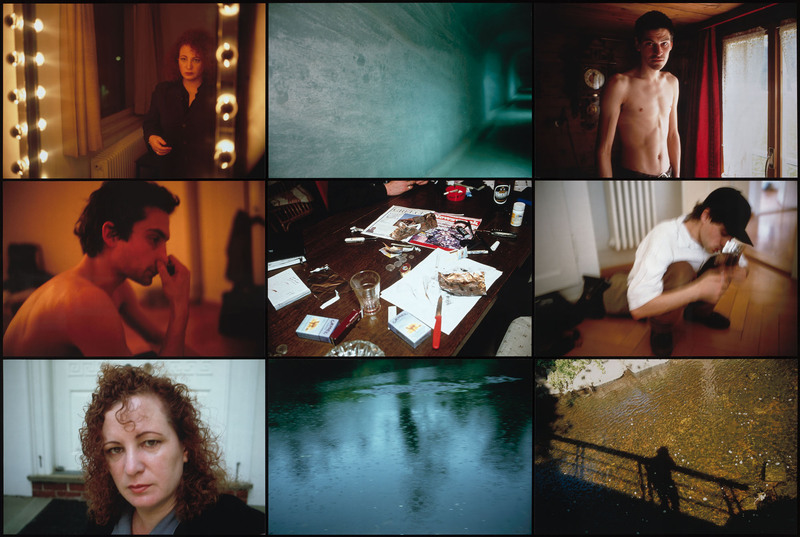 The exhibition also explores the narrative possibilities of photography found in the interplay of image and text in the work of Robert Frank, Larry Sultan, and Jim Goldberg; the emotional drama of personal crisis in Nan Goldin’s image grids; or the expansion of photographic description into experimental video and film by Victor Burgin and Judy Fiskin. In 1920, Stieglitz’s family sold their Victorian summerhouse on the shore of Lake George, New York, and moved to a farmhouse on a hill above it. 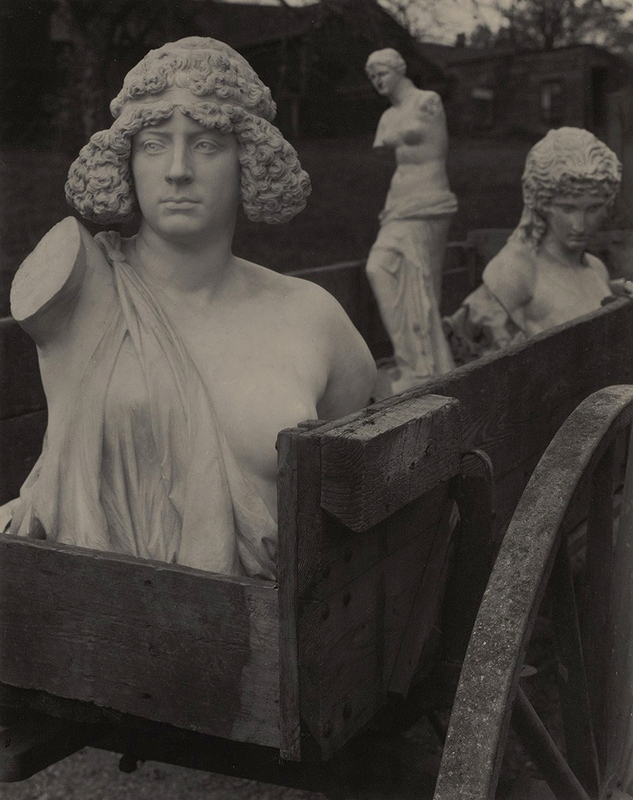 This photograph shows three sculptures his father had collected – two 19th-century replicas of ancient statues and a circa 1880 bust by Moses Ezekiel depicting the Old Testament heroine Judith – as they were being moved in a wooden cart from one house to another. 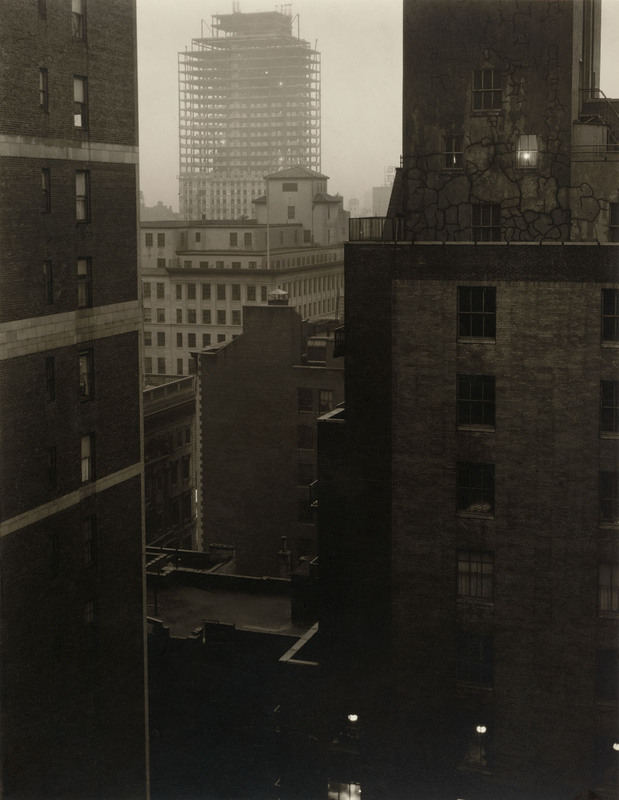 Stieglitz titled it The Way Art Moves, wryly commenting on the low status of art in American society. With her masculine face and bared breast, Judith was much maligned by Georgia O’Keeffe and other younger family members. In a playful summer prank, they later buried her somewhere near the farmhouse, where she remained lost, despite many subsequent efforts by the perpetrators themselves to find her. Beginning in the mid-1960s, conceptual artist Dan Graham created several works of art for magazine pages and slide shows. 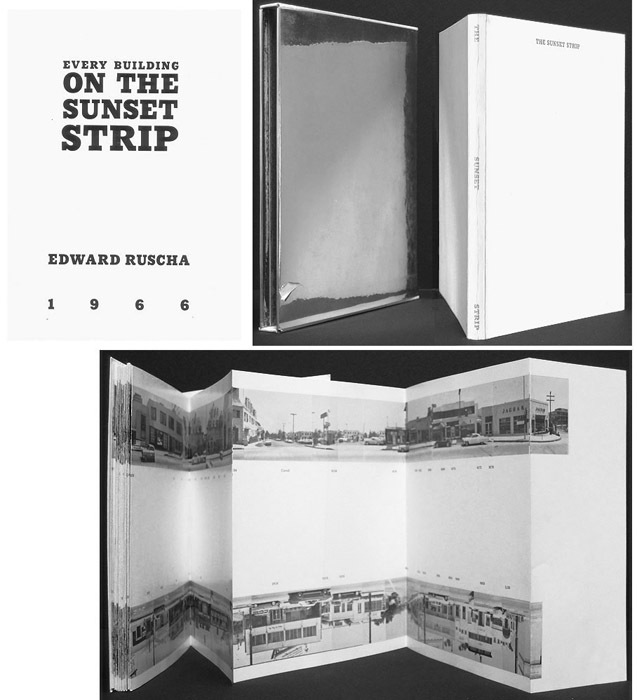 When Homes for America was designed for Arts magazine in 1966, his accompanying text critiqued the mass production of cookie-cutter homes, while his photographs – made with an inexpensive Kodak Instamatic camera – described a suburban world of offices, houses, restaurants, highways, and truck stops. 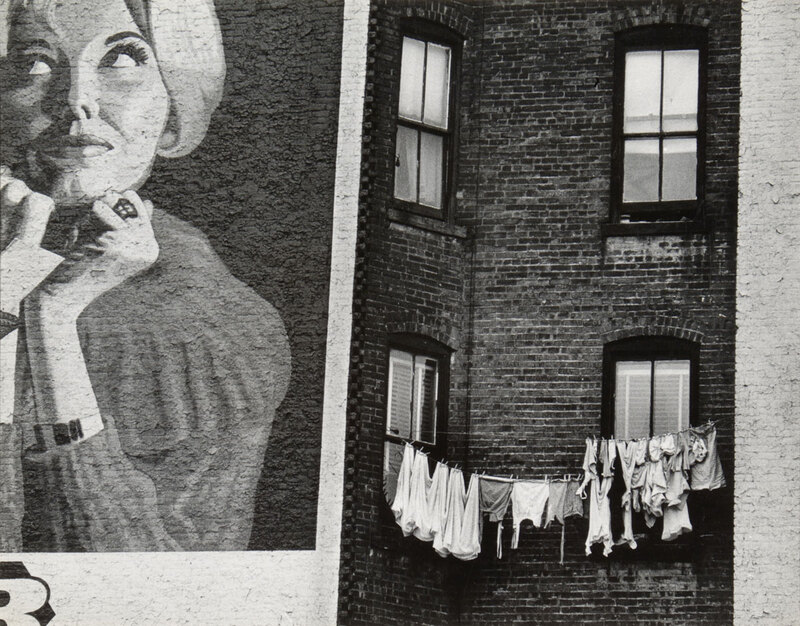 With their haphazard composition and amateur technique, Graham’s pictures ironically scrutinized the aesthetics of America’s postwar housing and inspired other conceptual artists to incorporate photographs into their work. 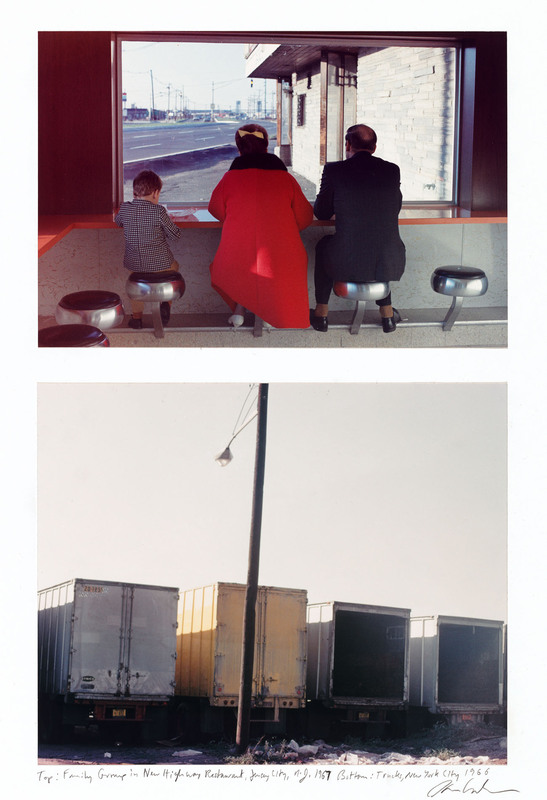 Together, these two photographs link a middle-class family at the opening of a Jersey City highway restaurant with the soulless industrial landscape seen through the window. Other (2 text panels): 50.8 × 76.2 cm (20 × 30 in.) overall: 30 x 117 in. Attie projected historical photographs made in 1932 onto the sides of a building at Mulackstrasse 32, the site of a Hebrew reading room in a Jewish neighborhood in Berlin during the 1930s. 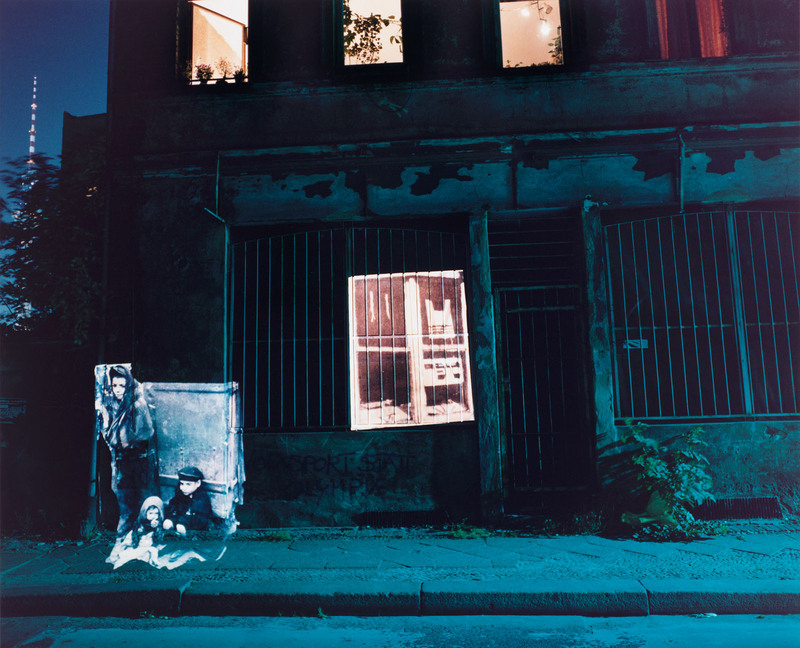 Fusing pictures made before Jews were removed from their homes and killed during World War II with photographs of the same dark, empty street made in 1992, Attie has created a haunting picture of wartime loss. Goldin has unsparingly chronicled her own community of friends by photographing their struggles, hopes, and dreams through years of camaraderie, abuse, addiction, illness, loss, and redemption. Relapse/Detox Grid presents nine colorful yet plaintive pictures in a slide show-like narrative, offering glimpses of a life rooted in struggle, along with Goldin’s own recovery at a detox center, seen in the bottom row. An early advocate of conceptual art, Burgin is an artist and writer whose work spans photographs, text, and video. Watergate shows how the meaning of art can change depending on the context in which it is seen. Burgin animated digital, 160-degree panoramic photographs of nineteenth-century American art hanging in the Corcoran Gallery of Art and in a hotel room. While the camera circles the gallery, an actor reads from Jean-Paul Satre’s Being and Nothingness, which questions the relationship between presence and absence. Then a dreamlike pan around a hotel room overlooking the nearby Watergate complex mysteriously reveals Niagara, the Corcoran’s 1859 landscape by Frederic Church, having on the wall. In 1859, Niagara Falls was seen as a symbol of the glory and promise of the American nation, yet when Church’s painting is placed in the context of the Watergate, an icon of the scandal that led to Richard Nixon’s resignation, it assumes a different meaning and suggests an ominous sense of disillusionment. 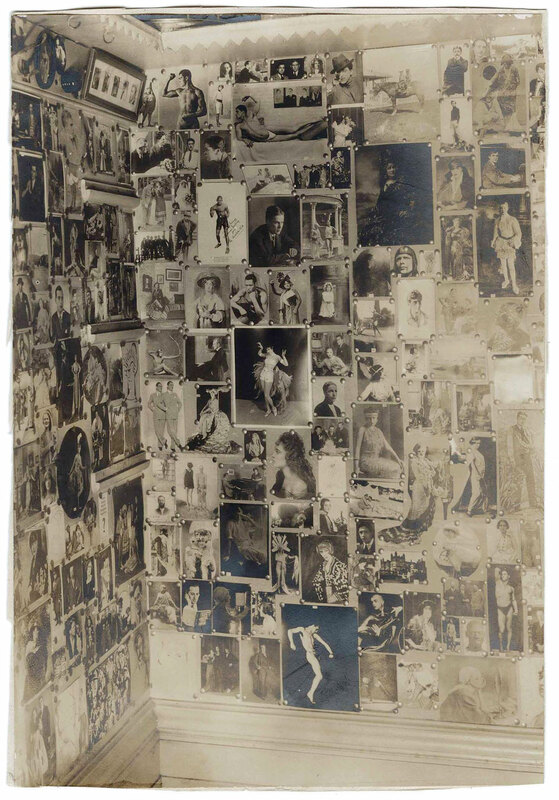 Intersections also examines the studio as a locus of creativity, from Stieglitz’s photographs of his gallery, 291, and James Van Der Zee’s commercial studio portraits, to the manipulated images of Wallace Berman, Robert Heinecken, and Martha Rosler. Works by Laurie Simmons, David Levinthal, and Vik Muniz also highlight the postmodern strategy of staging images created in the studio. Nadar (a pseudonym for Gaspard-Félix Tournachon) was not only a celebrated portrait photographer, but also a journalist, caricaturist, and early proponent of manned flight. In 1863, he commissioned a prominent balloonist to build an enormous balloon 196 feet high, which he named The Giant. The ascents he made from 1863 to 1867 were widely covered in the press and celebrated by the cartoonist Honoré Daumier, who depicted Nadar soaring above Paris, its buildings festooned with signs for photography studios. Nadar made and sold small prints like this self-portrait to promote his ballooning ventures. 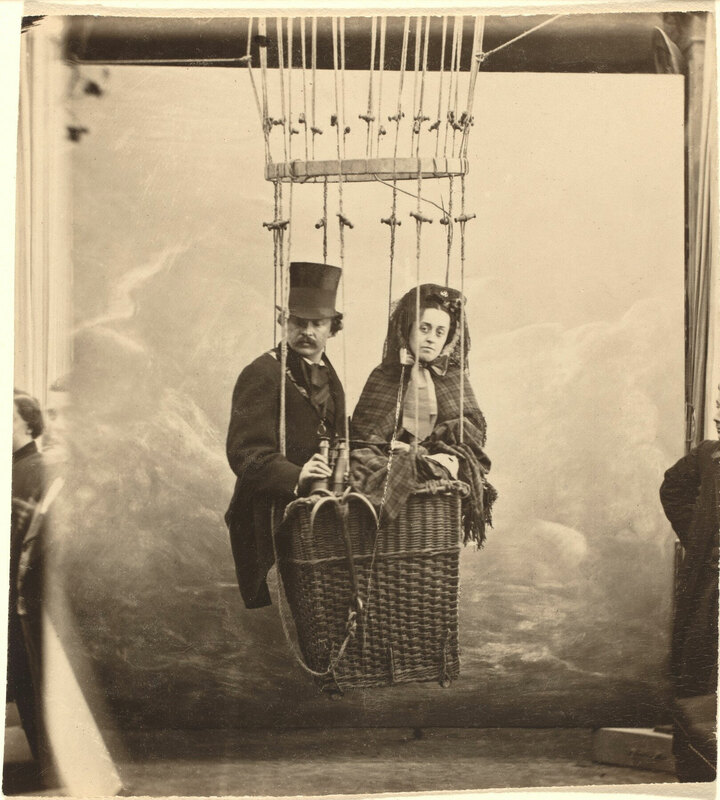 The obviously artificial construction of this picture – Nadar and his wife sit in a basket far too small for a real ascent and are posed in front of a painted backdrop – and its untrimmed edges showing assistants at either side make it less of the self-aggrandizing statement that Nadar wished and more of an amusing behind-the-scenes look at studio practice. 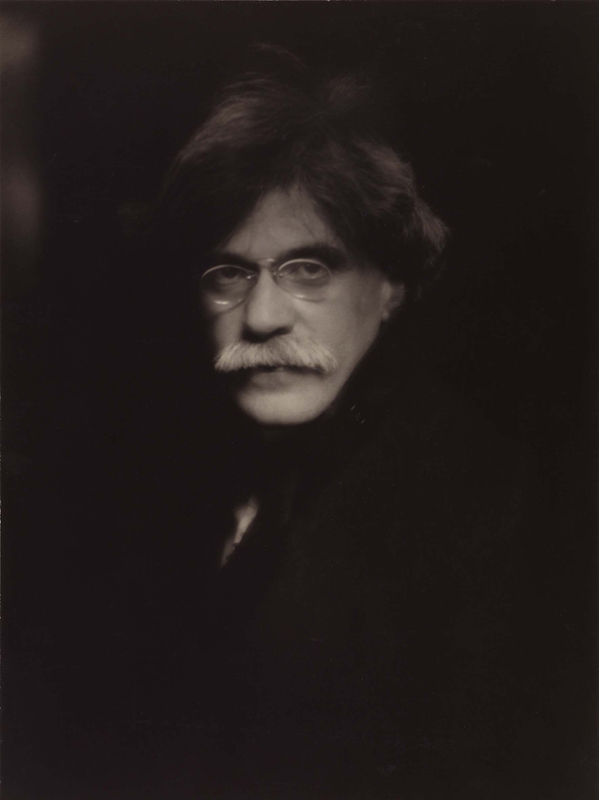 Unlike many other photographers, Stieglitz made few self-portraits. He created this one shortly before he embarked on a series of portraits of the artists who frequented his New York gallery, 291. 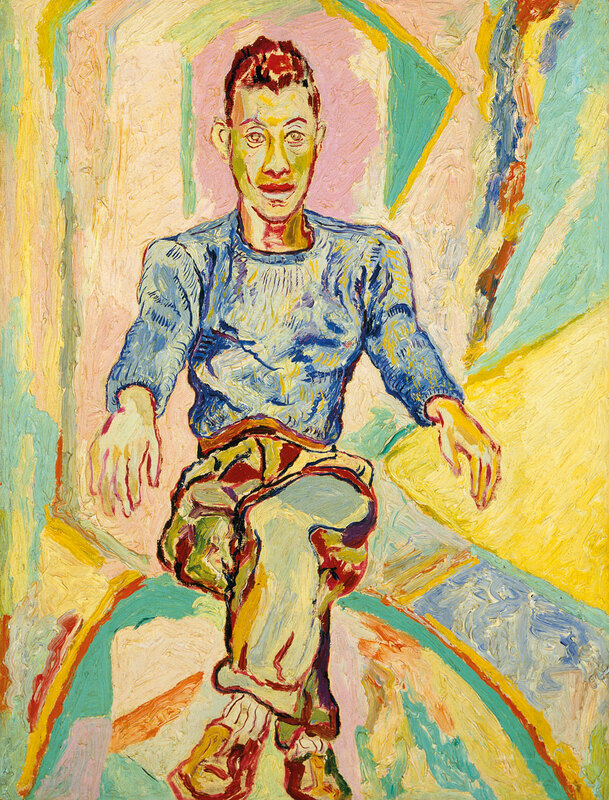 Focusing only on his face and leaving all else in shadow, he presents himself not as an artist at work or play, but as a charismatic leader who would guide American art and culture into the 20th century. 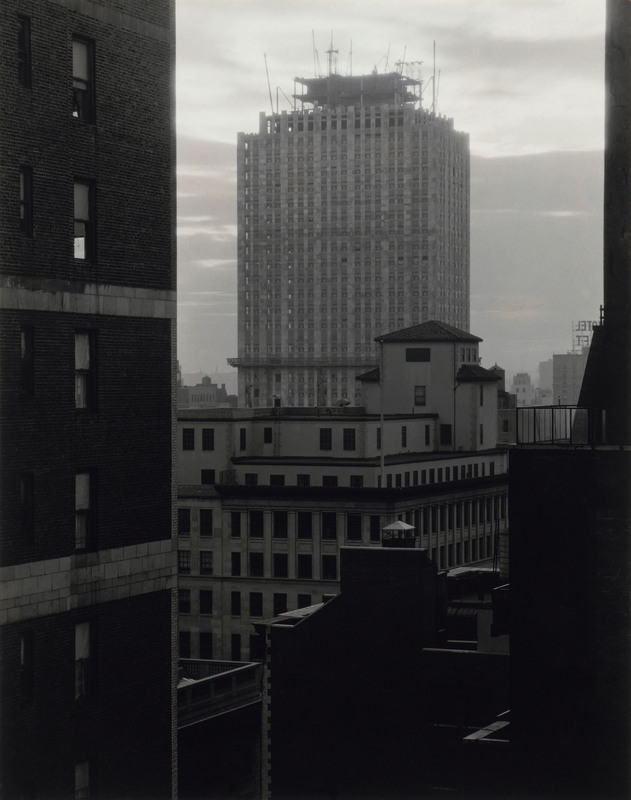 291 was Stieglitz’s legendary gallery in New York City (its name derived from its address on Fifth Avenue), where he introduced modern European and American art and photography to the American public. He also used 291 as a studio, frequently photographing friends and colleagues there, as well as the views from its windows. This picture records what Stieglitz called a “demonstration” – a short display of no more than a few days designed to prompt a focused discussion. Including two works by Picasso, an African mask from the Kota people, a wasps’ nest, and 291’s signature brass bowl, the photograph calls into question the relationship between nature and culture, Western and African art. 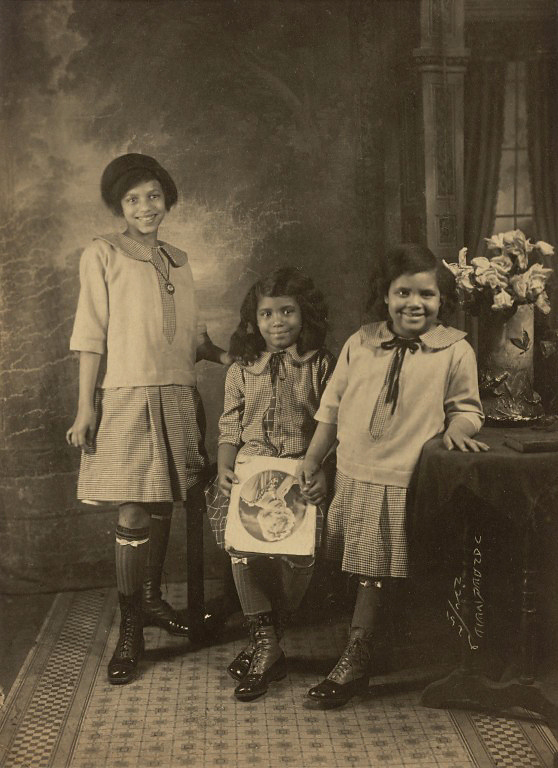 James Van Der Zee was a prolific studio photographer in Harlem during a period known as the Harlem Renaissance, from the end of World War I to the middle of the 1930s. 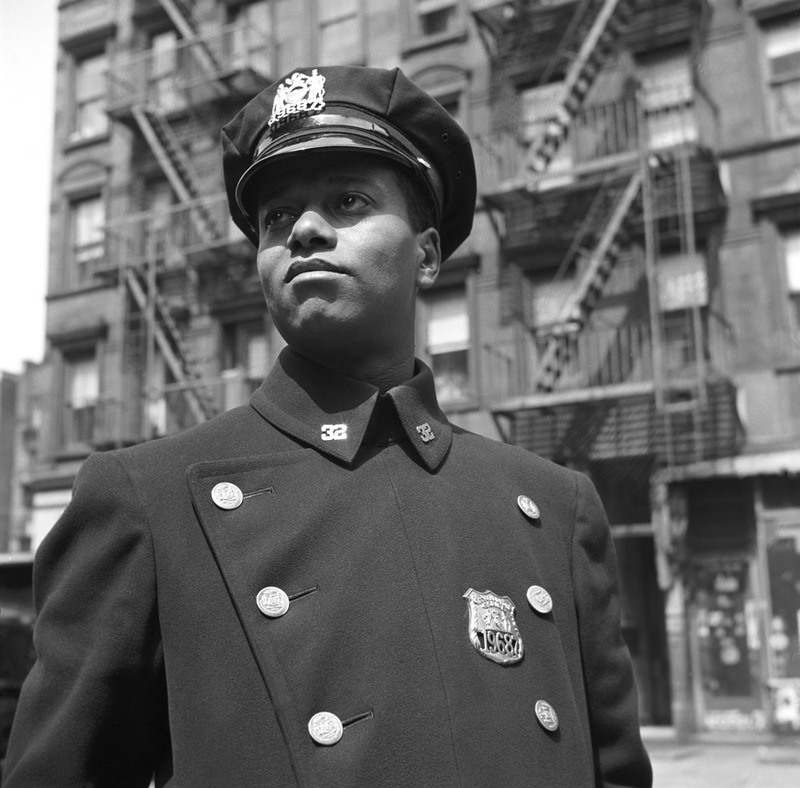 He photographed many of Harlem’s celebrities, middle-class residents, and community organizations, establishing a visual archive that remains one of the best records of the era. He stands out for his playful use of props and retouching, thereby personalizing each picture and enhancing the sitter’s appearance. In this portrait of three sisters, clasped hands show the tender bond of the two youngest, one of whom holds a celebrity portrait, revealing her enthusiasm for popular culture. Part 1 overall: 26 1/2 x 13 7/8 in. Part 2 overall: 26 3/8 x 13 3/4 in. Overall: 26 1/2 x 27 3/4 in. Doug and Mike Starn, identical twins who have worked collaboratively since they were thirteen, have a reputation for creating unorthodox works. 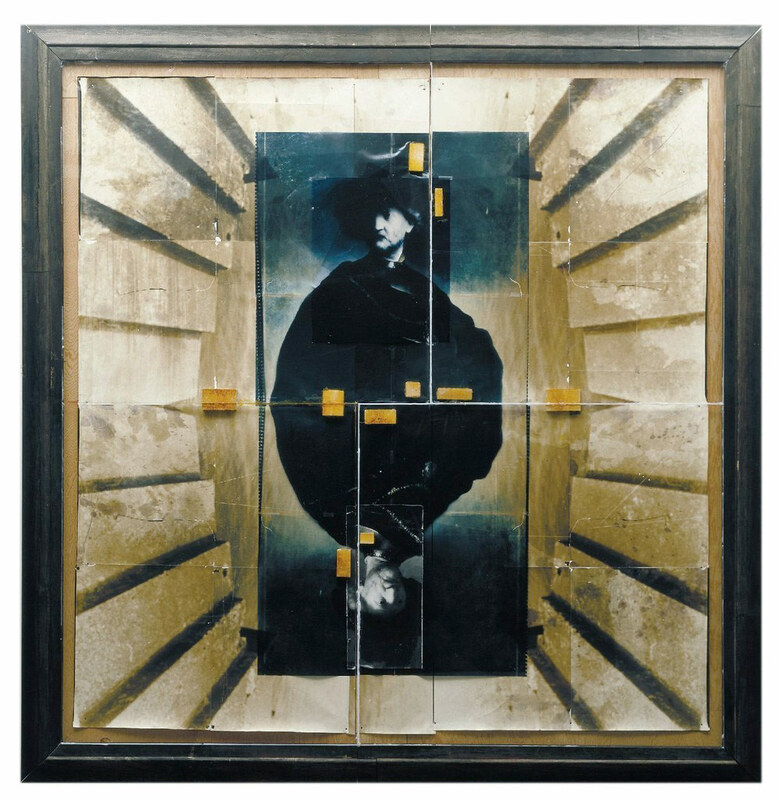 Using take, wood, and glue, the brothers assembles sheets of photographic film and paper to create a dynamic composition that includes an appropriated image of Rembrandt van Rijn’s Old Man with a Gold Chain (1631). Double Rembrandt (with steps) challenges the authority of the austere fine art print, as well as the aura of the original painting, while playfully invoking the twins’ own double identity. 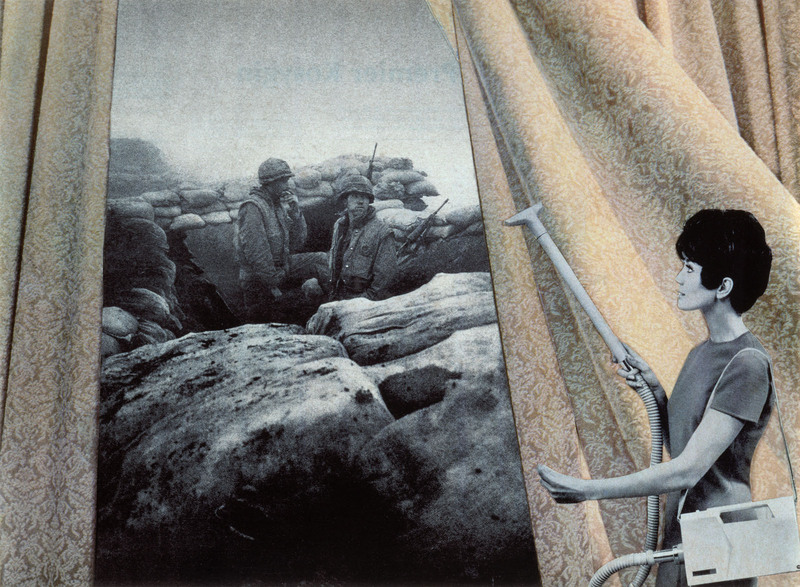 A painter, photographer, video artist, feminist, activist writer, and teacher, Martha Rosler made this photomontage while she was a graduate student in the late 1960s and early 1970s. Frustrated by the portrayal of the Vietnam War on television and in other media, she wrote: “The images were always very far away and of a place we couldn’t imagine.” To bring “the war home,” as she announced in her title, she cut out images from Life magazine and House Beautiful to make powerfully layered collages that contrast American middle-class life with the realities of the war. She selected color pictures of the idealized American life rich in the trappings of consumer society, and used black-and-white pictures of troops in Vietnam to heighten the contrast between here and there, while also calling attention to stereotypical views of men and women. Sally Mann, who is best known for the pictures of her children she made in the 1980s and 1990s, began to photograph when she was a teenager. 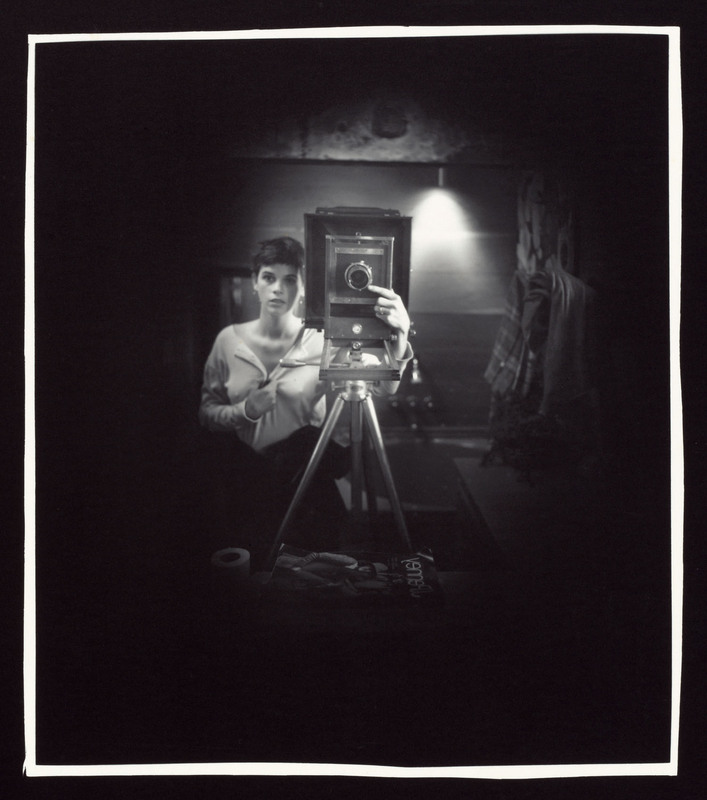 In this rare, early, and intimate self-portrait, the artist is reflected in a mirror, clasping her loose shirt as she stands in a friend’s bathroom. Her thoughtful, expectant expression, coupled with her finger pointing directly at the lens of the large view camera that towers above her, foreshadows the commanding presence photography would have in her life. 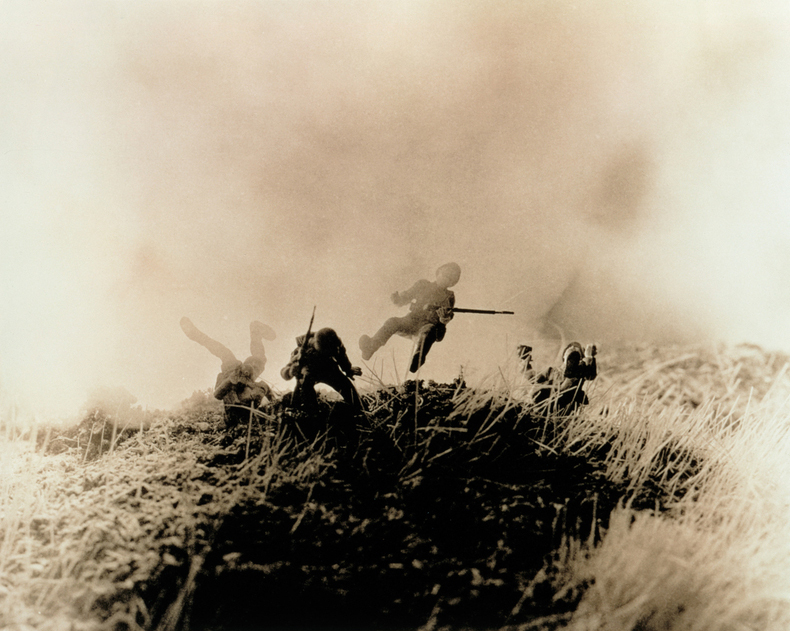 Levinthal’s series of photographs Hitler Moves East was made not during World War II, but in 1975, when the news media was saturated with images of the end of America’s involvement in the Vietnam War. In this series, he appropriates the grainy look of photojournalism and uses toy soldiers and fabricated environments to stage scenes from Germany’s brutal campaign on the Eastern Front during World War II. His pictures are often based on scenes found in television and movies, further distancing them from the actual events. A small stick was used to prop up the falling soldier and the explosion was made with puffs of flour. Hitler Moves East casts doubt on the implied authenticity of photojournalism and calls attention to the power of the media to define public understanding of events. 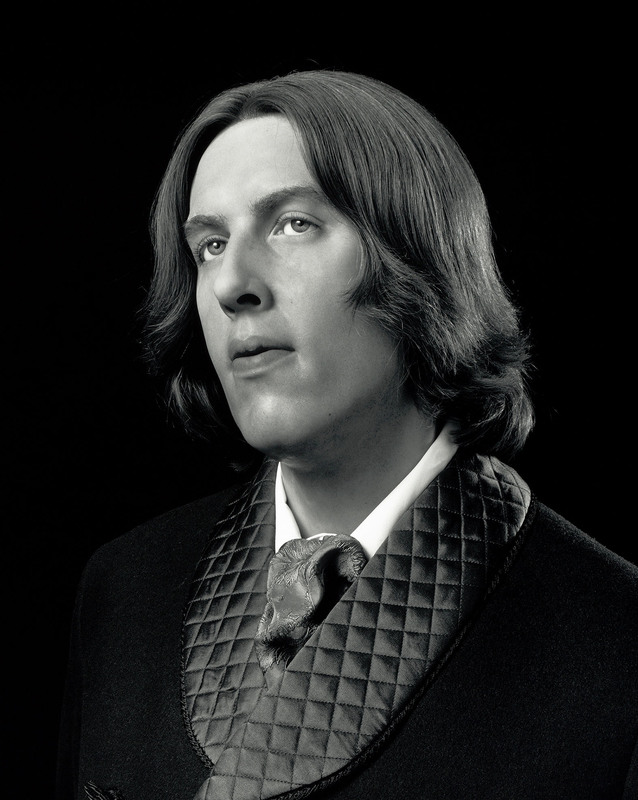 While most traditional portrait photographers worked in studios, Sugimoto upended this practice in a series of pictures he made at Madame Tussaud’s wax museums in London and Amsterdam, where lifelike wax figures, based on paintings or photographs, as is the case with Oscar Wilde, are displayed in staged vignettes. By isolating the figure from its setting, posing it in a three-quarter-length view, illuminating it to convey the impression of a carefully lit studio portrait, and making his final print almost six feet tall, Sugimoto renders the artificial as real. Triply removing his portrait from reality – from Oscar Wilde himself to a portrait photograph to a wax sculpture and back to a photograph – Sugimoto collapses time and confounds our expectations of the nature of photography. Muniz has spent his career remaking works of art by artists as varied as Botticelli and Warhol using unusual materials – sugar, diamonds, and even junk. 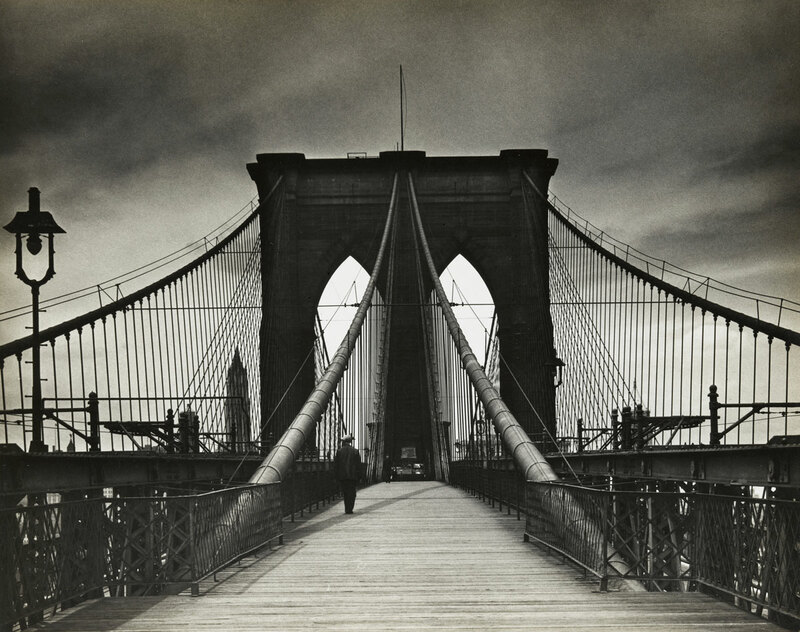 He has been especially interested in Stieglitz and has re-created his photographs using chocolate syrup and cotton. 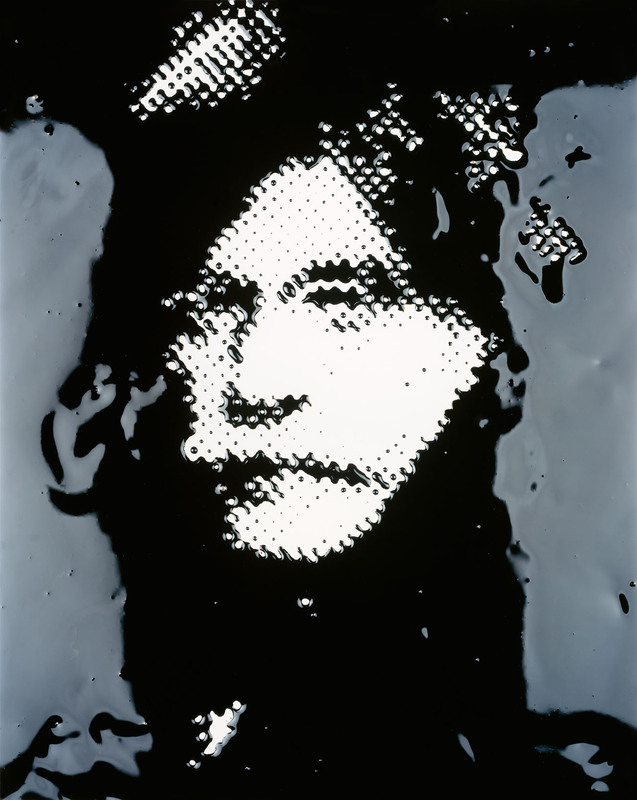 Here, he refashioned Stieglitz’s celebrated self-portrait using wet ink and mimicking the dot matrix of a halftone reproduction. He then photographed his drawing and greatly enlarged it so that the dot matrix itself becomes as important as the picture it replicates. 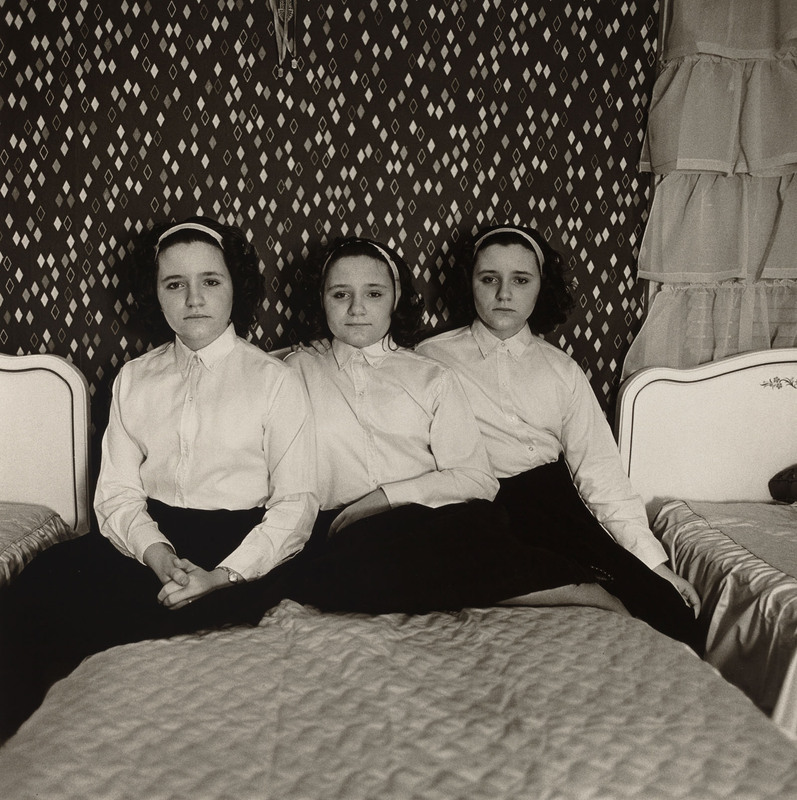 A writer, painter, and philosopher, Witkiewicz began to photograph while he was a teenager. 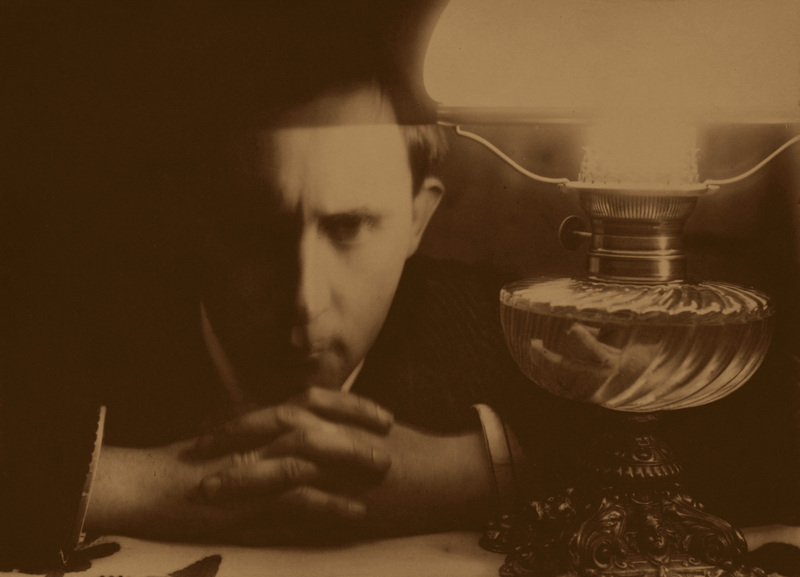 From 1911 to 1914, while undergoing psychoanalysis and involved in two tumultuous relationships (one ending when his pregnant fiancée killed herself in 1914), he made a series of startling self-portraits. Close-up, confrontational, and searching, they are pictures in which the artist seems to seek understanding of himself by scrutinizing his visage. 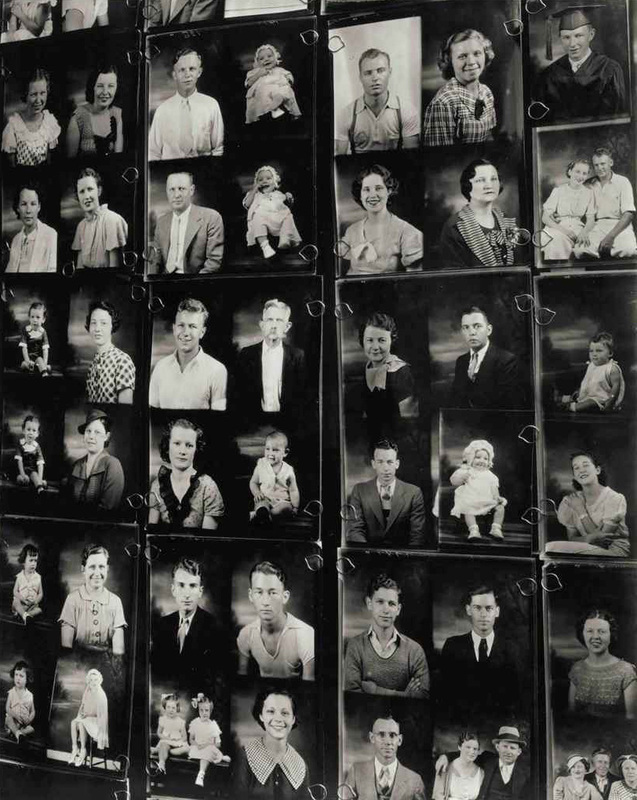 In 1911, Sander began a massive project to document “people of the twentieth century.” Identifying them by their professions, not their names, he aimed to create a typological record of citizens of the Weimar Republic. 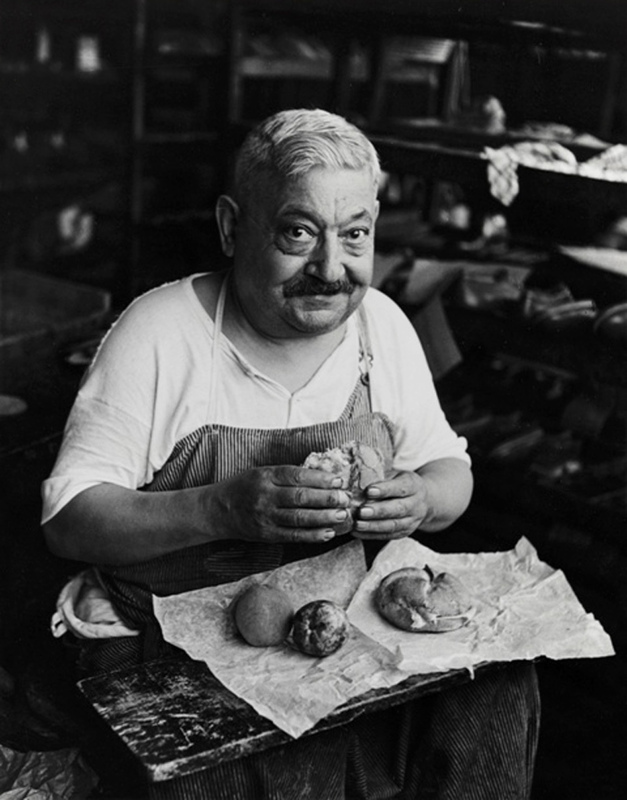 He photographed people from all walks of life – from bakers, bankers, and businessmen to soldiers, students, and tradesmen, as well as gypsies, the unemployed, and the homeless. The Nazis banned his project in the 1930s because his pictures did not conform to the ideal Aryan type. 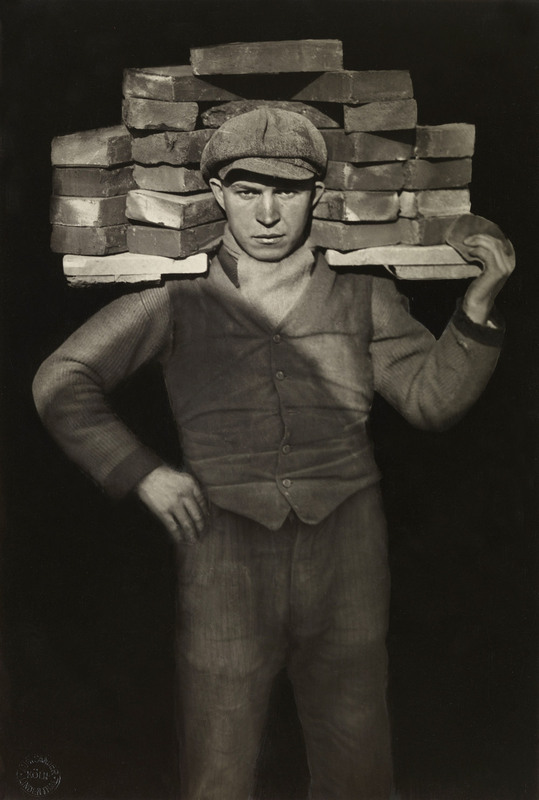 Although he stopped working after World War II, he made this rare enlargement of a bricklayer for an exhibition of his photographs in the early 1950s. 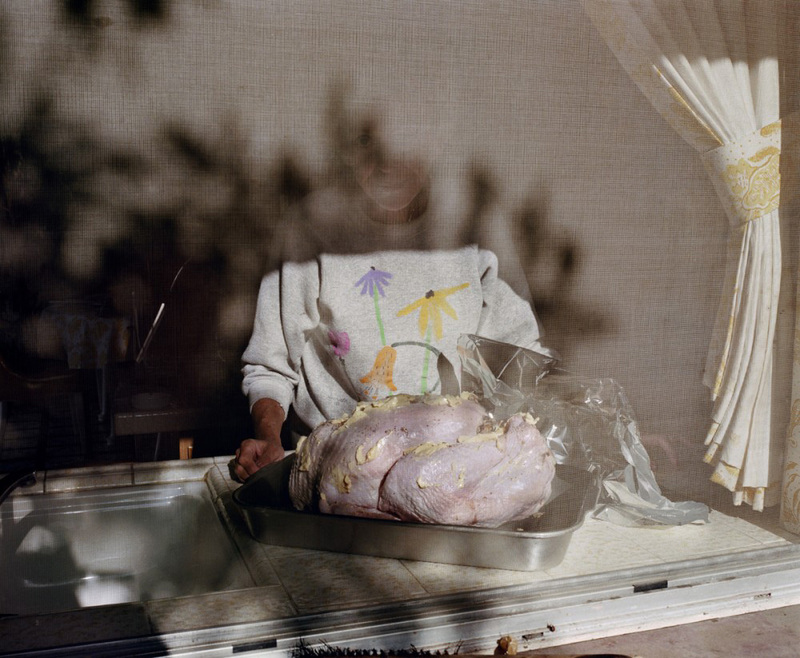 From the mid-1980s to the present, Simpson has created provocative works that question stereotypes of gender, identity, history, and culture, often by combining photographs and words. 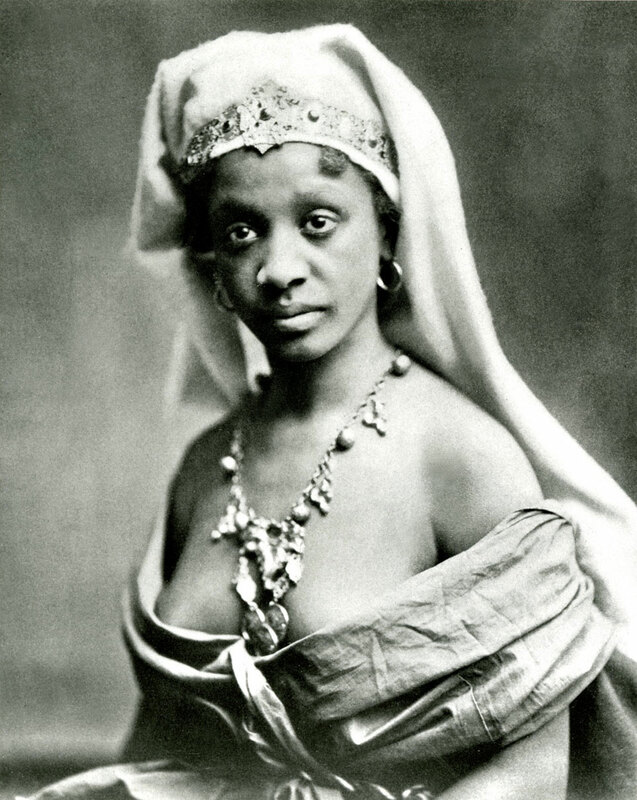 Two Necklines shows two circular and identical photographs of an African American woman’s mouth, chin, neck, and collarbone, as well as the bodice of her simple shift. 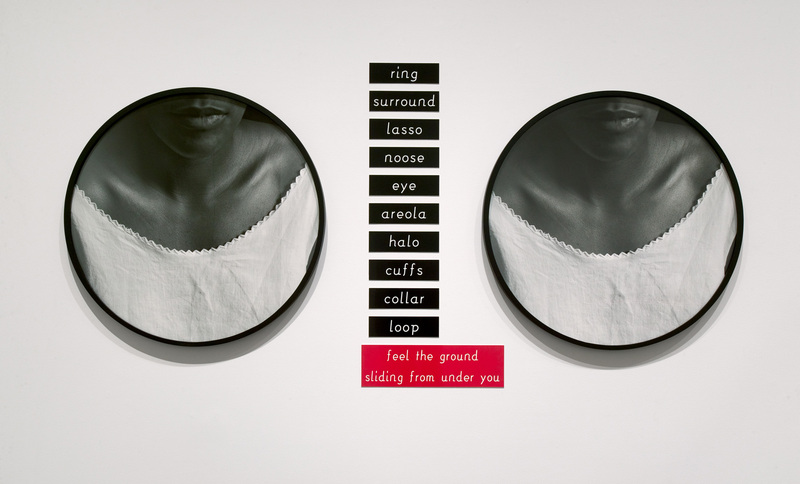 Set in between are black plaques, each inscribed with a single word: “ring, surround, lasso, noose, eye, areola, halo, cuffs, collar, loop.” The words connote things that bind and conjure a sense of menace, yet when placed between the two calm, elegant photographs, their meaning is at first uncertain. But when we read the red plaque inscribed “feel the ground sliding from under you” and note the location of the word “noose” adjacent to the two necklines, we realize that Simpson is quietly but chillingly referring to the act of lynching. 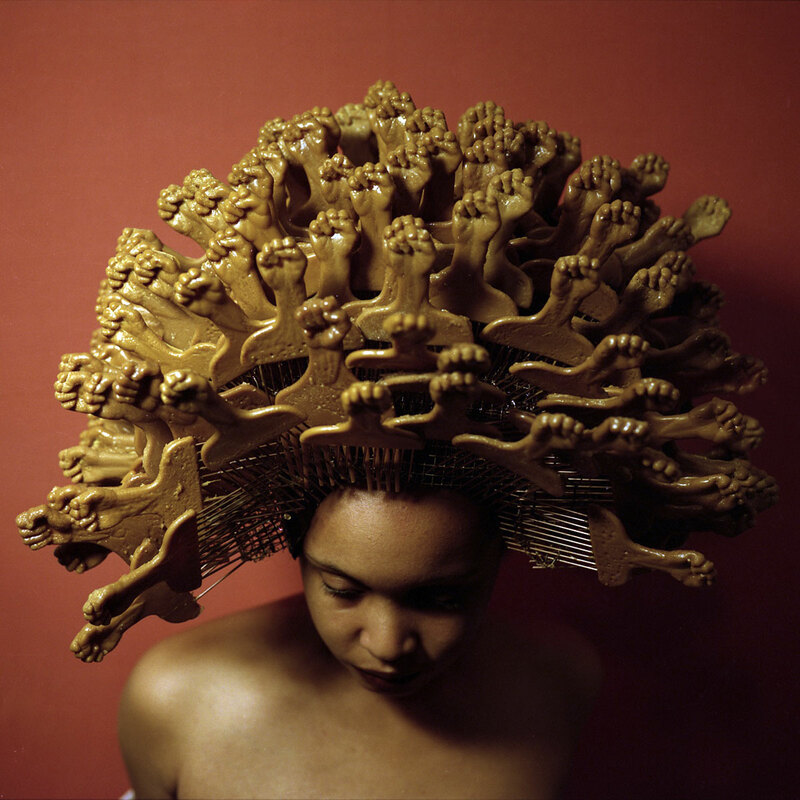 And One is from Thomas’s Strange Fruit series, which explores the concepts of spectacle and display as they relate to modern African American identity. Popularized by singer Billie Holiday, the series title Strange Fruit comes from a poem by Abel Meeropol, who wrote the infamous words “Black bodies swinging in the southern breeze; Strange fruit hanging from the poplar trees” after seeing a photograph of a lynching in 1936. In And One, a contemporary African American artist reflects on how black bodies have been represented in two different contexts: lynching and professional sports. 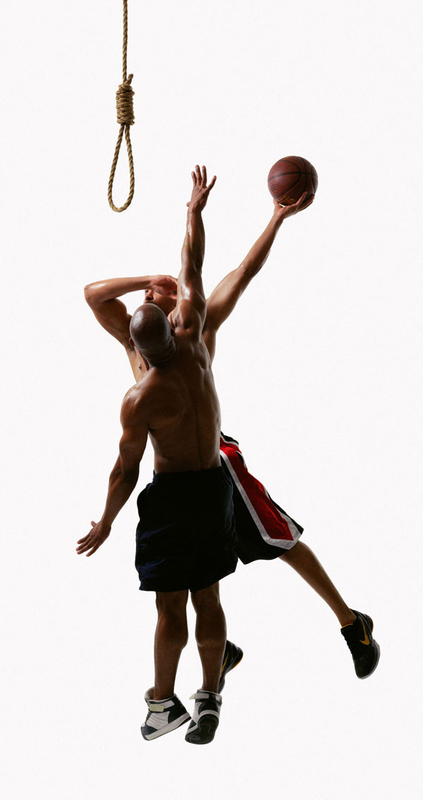 Thomas ponders the connections between these disparate forms through his dramatic photograph of two basketball players frozen in midair, one dunking a ball through a hanging noose. What looks to be another fascinating exhibition. They are coming thick and fast at the moment, it’s hard to keep up! Many thankx to the Art Institute of Chicago for allowing me to publish the photographs in the posting. Please click on the photographs for a larger version of the image. “The American city of the 1960s and 1970s experienced seismic physical changes and social transformations, from urban decay and political protests to massive highways that threatened vibrant neighborhoods. Nowhere was this sense of crisis more evident than in the country’s three largest cities: New York, Chicago, and Los Angeles. 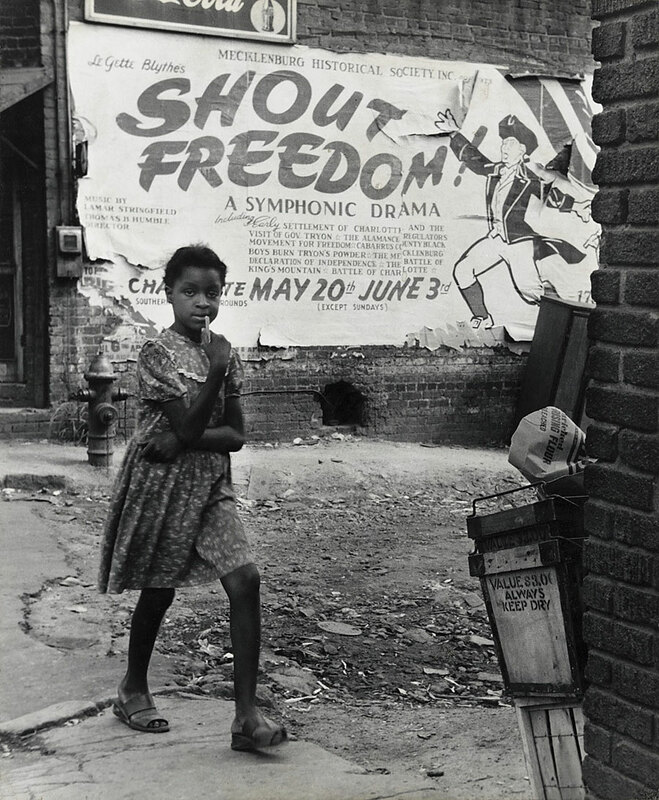 Yet in this climate of uncertainty and upheaval, the streets and neighborhoods of these cities offered places where a host of different actors – photographers, artists, filmmakers, planners, and activists – could transform these conditions of crisis into opportunities for civic discourse and creative expression. The City Lost and Found is the first exhibition to explore this seminal period through the emergence of new photographic and cinematic practices that reached from the art world to the pages of Life magazine. 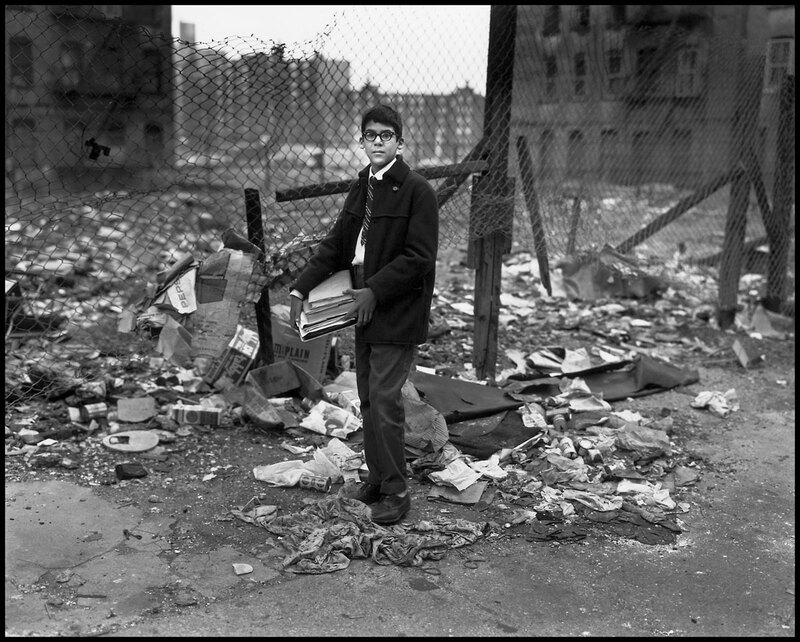 Instead of aerial views and sweeping panoramas, photographers and filmmakers turned to in-depth studies of streets, pedestrian life, neighborhoods, and seminal urban events, like Bruce Davidson’s two-year study of a single block in Harlem, East 100th Street (1966-68). These new forms of photography offered the public a complex image of urban life and experience while also allowing architects, planners, and journalists to imagine and propose new futures for American cities. Drawn from the Art Institute’s holdings, as well as from more than 30 collections across the United States, this exhibition brings together a large range of media, from slideshows and planning documents to photo collage and artist books. 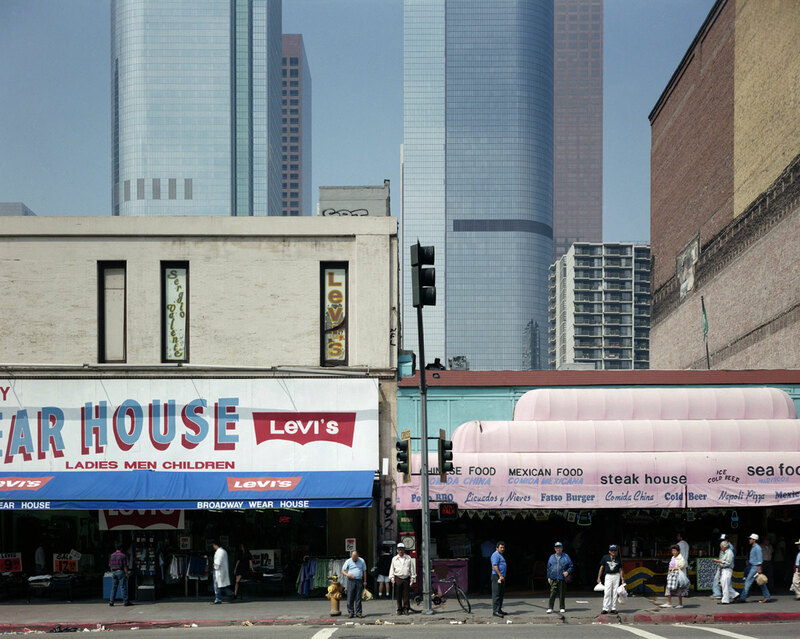 The City Lost and Found showcases important bodies of work by renowned photographers and photojournalists such as Thomas Struth, Martha Rosler, and Barton Silverman, along with artists known for their profound connections to place, such as Romare Bearden in New York and ASCO in Los Angeles. 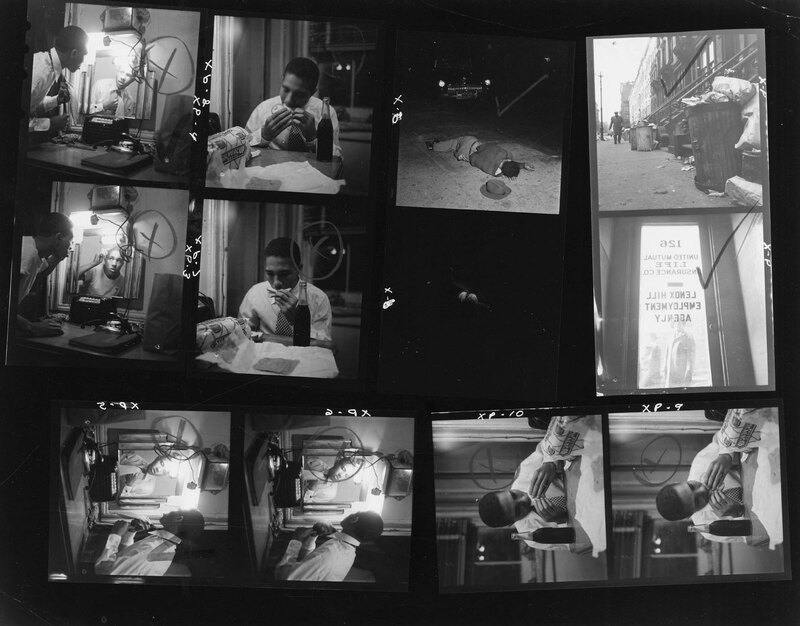 In addition, projects like artist Allan Kaprow’s Chicago happening, Moving, and architect Shadrach Wood’s hybrid plan for SoHo demonstrate how photography and film were used in unconventional ways to make critical statements about the stakes of urban change. 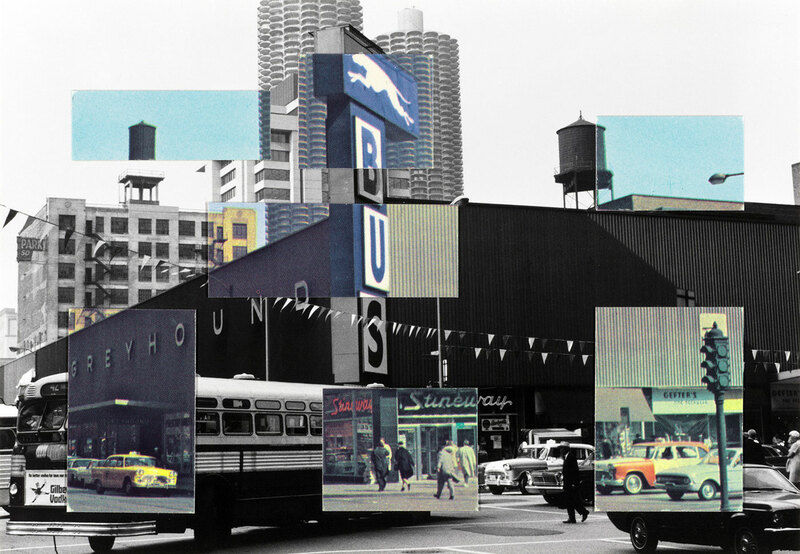 Blurring traditional boundaries between artists, activists, planners, and journalists, The City Lost and Found offers an unprecedented opportunity to experience the deep interconnections between art practices and the political, social, and geographic realities of American cities in the 1960s and 1970s. James Nares’s film Pendulum illustrates the extraordinary status of Lower Manhattan during the 1970s, where disuse and decay created both the threat of demolition and the freedom to produce ambitious public art projects. The film shows a large pendulum swinging languidly in largely abandoned streets, suggesting the passage of time as well as the menace of the wrecking ball. Nares created this project by suspending a cast-concrete ball from an elevated pedestrian bridge on Staple Street on the Lower West Side adjacent to his loft. Unlike many neighborhoods, urban renewal plans never came to fruition for this area, which still retains a connection to this precarious, yet liberating time in New York. This monumental collage depicts both a specific, identifiable block in Harlem and also the importance of everyday routines to the city. 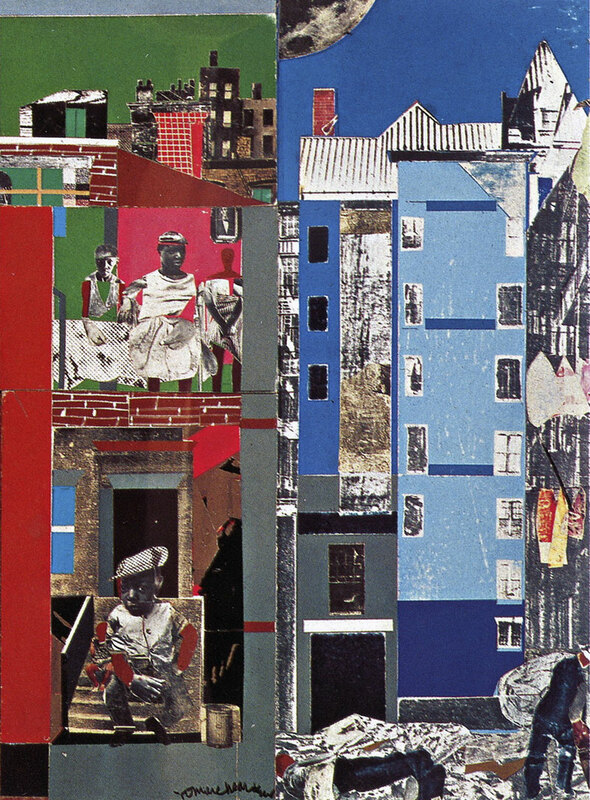 From the 1960s Romare Bearden used collage to convey the texture and dynamism of urban life, combining paint and pencil with found photographs and images from newspapers, magazines, product labels, and fabric and wallpaper samples. 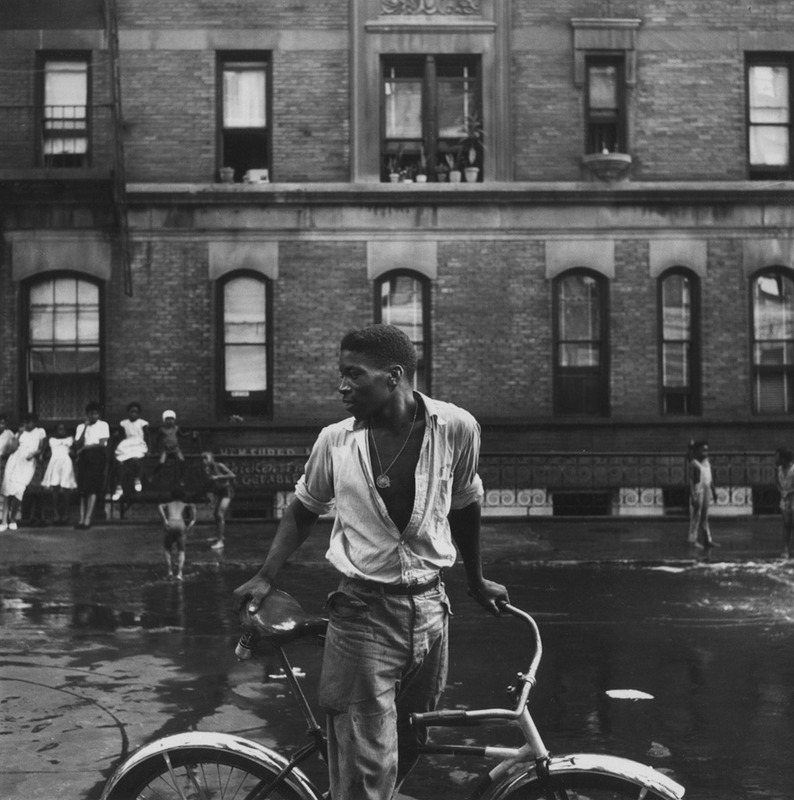 Here Bearden showed the diverse inhabitants of Harlem apartment buildings perched in windows and on fire escapes, sitting on front stoops and street benches. The scene highlights the innumerable ways city dwellers “make do” so that their environments are more functional and livable, from transforming front steps into a living room to turning sidewalks into playgrounds. 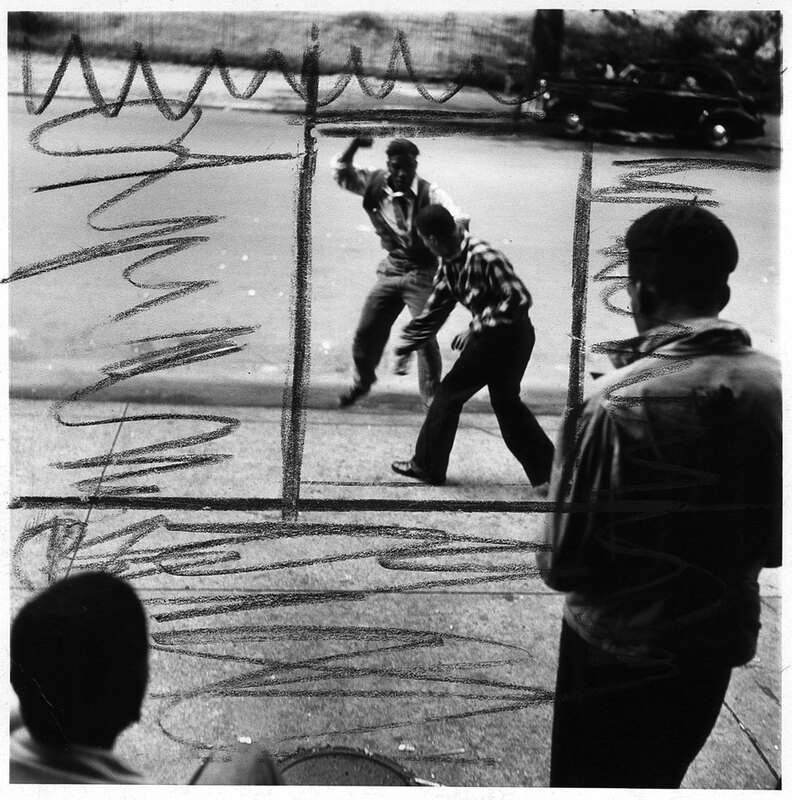 While Bearden’s work has strong connections to avant-garde art and American and African histories, his collage technique can also be seen as a form of making do, just like the practices of his neighbors in New York. 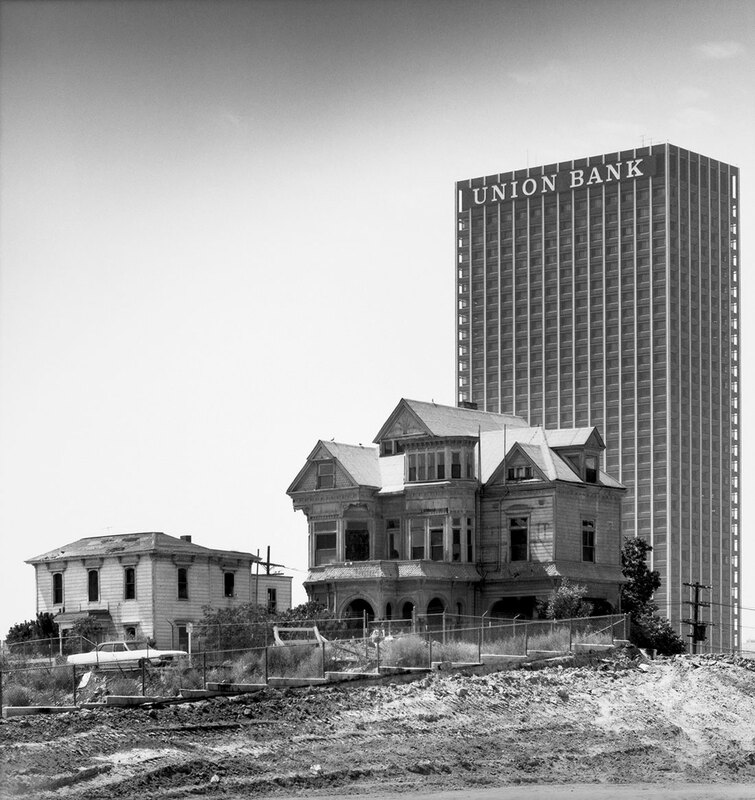 “The American city of the 1960s and ’70s witnessed seismic physical changes and social transformations, from shifting demographics and political protests to the aftermath of decades of urban renewal. In this climate of upheaval and uncertainty, a range of makers – including photographers, filmmakers, urban planners, architects, and performance artists – countered the image of the city in crisis by focusing on the potential and the complexity of urban places. Moving away from the representation of cities through aerial views, maps, and sweeping panoramas, new photographic and planning practices in New York, Chicago, and Los Angeles explored real streets, neighborhoods, and important urban events, from the Watts Rebellion to the protests surrounding the Democratic National Convention in Chicago. These ideas and images defined not only cities’ social and political stakes in the eyes of the American public, but they also led a new generation of architects, urban planners, and sociologists to challenge long-held attitudes about the future of inner-city neighborhoods. The election of Mayor John Lindsay in 1965 represented a watershed for New York, as the city moved away from administrator Robert Moses’s highly centralized push for new infrastructure and construction in previous decades. Lindsay’s efforts to create a more open and participatory city government were often in dialogue with ideas advanced by critic Jane Jacobs, who argued for the value of streets, neighborhoods, and small-scale change. 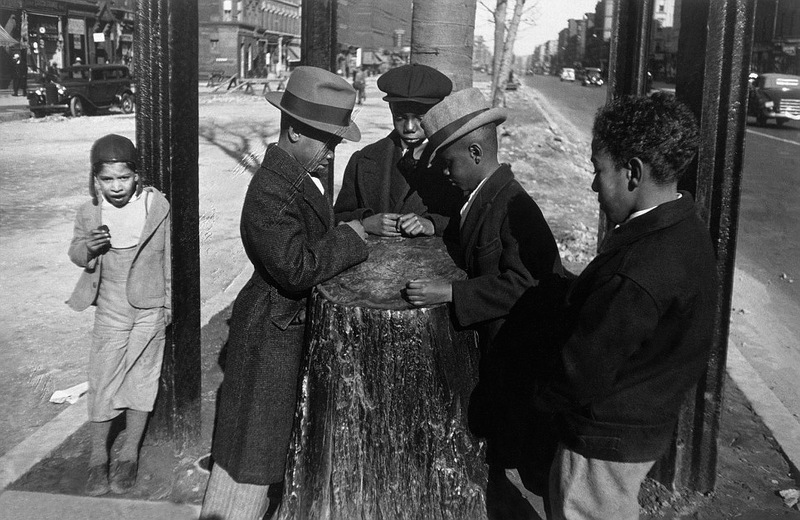 This new focus on local and self-directed interventions had a wide influence, leading to the development of pocket parks to replace vacant lots and the groundbreaking Plan for New York City’s use of photo essays and graphic design to express goals of diversity and community. In turn, many artists of the period, including Hans Haacke and Mierle Laderman Ukeles, created work that directly engaged with important social and political issues in the city, such as slum housing and labor strikes. 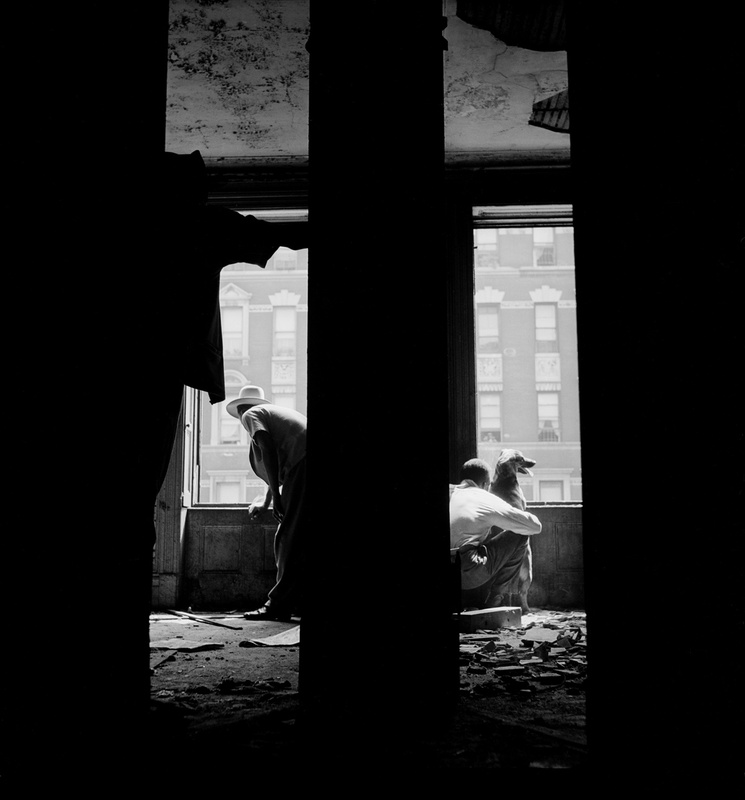 A multifaceted theme of preservation comes to the fore in work by the many artists and architects in New York who documented, staged, and inhabited areas where buildings were left vacant and in disrepair following postwar shifts in population and industry. 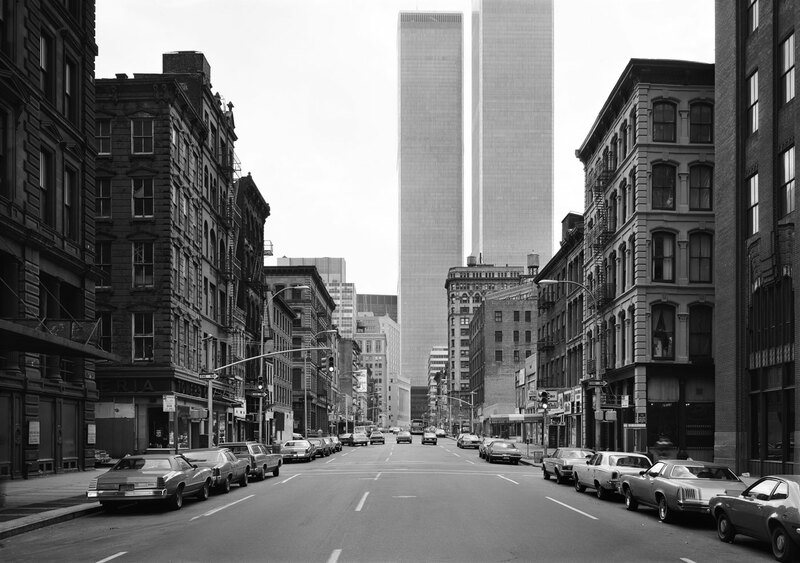 The historic streets of Lower Manhattan became an integral part of projects by artist Gordon Matta-Clark and architect Paul Rudolph, for example, while low-income, yet vibrant neighborhoods like Harlem gave rise to important bodies of work by Romare Bearden, Bruce Davidson, and Martha Rosler. James Nares’s elegiac film Pendulum and Danny Lyon’s remarkable photographs in The Destruction of Lower Manhattan are examples of a growing awareness of the struggle to preserve the existing urban fabric and cultures of New York during the 1960s and ’70s. Known for high-tech buildings in concrete, architect Paul Rudolph began working on a project for Lower Manhattan Expressway in 1965, funded by the Ford Foundation as research and design exploring “New Forms of the Evolving City.” Rudolph diverged from Robert Moses’s strategy for infrastructural projects through a sensitive engagement with the scale and texture of the dense urban fabric of Lower Manhattan. He proposed a below-grade road surmounted by a large, continuous residential structure of varying heights that would protect the surrounding neighborhood from the pollution and noise of the highway. In many places this terraced megastructure was precisely scaled to the height of the surrounding loft buildings, with entrances and gardens on existing streets, a contextual quality emphasized in his detailed drawings. 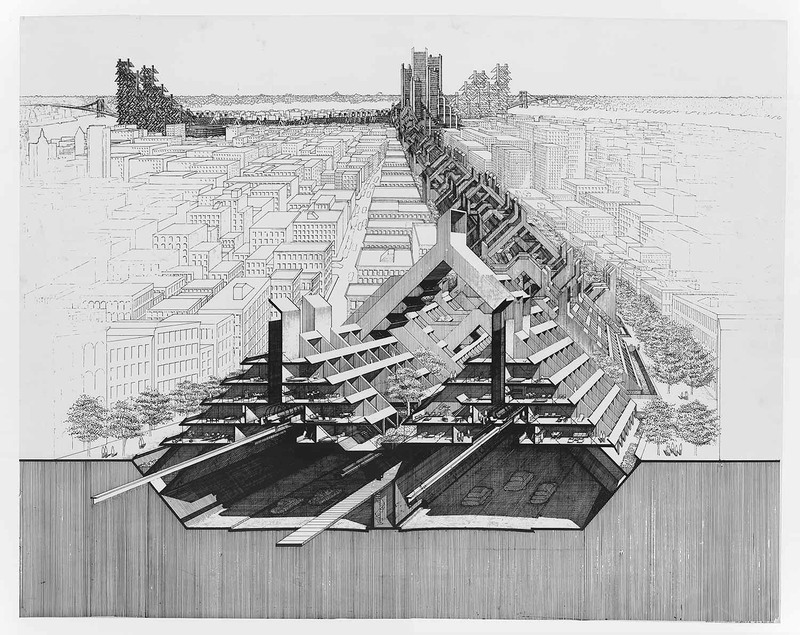 Rudolph also designed the expressway complex to resonate with established functions and symbols of the city, with tall buildings flanking the Manhattan and Williamsburg Bridges like monumental gates to the city. In the 1960s and ’70s Chicago emerged from its industrial past led by a powerful mayor, Richard J. Daley, who prioritized development in the downtown areas. 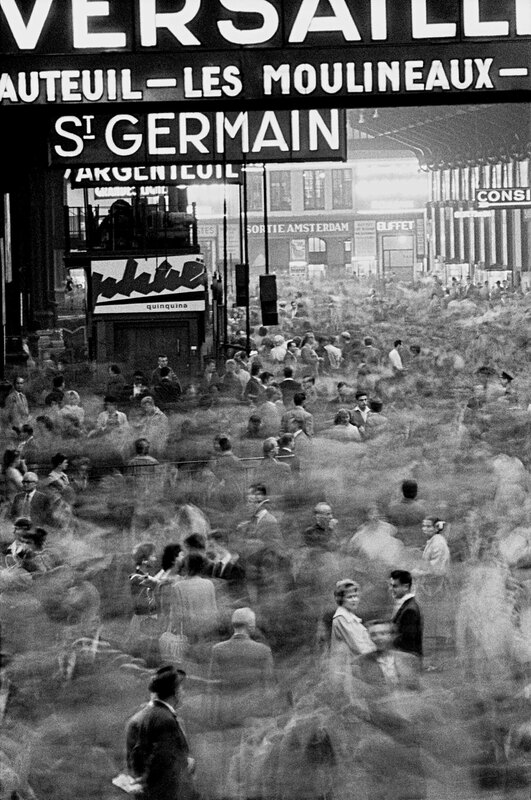 His work to modernize the city resulted in the construction of massive highways, housing projects, and imposing skyscrapers – new architectural and infrastructural icons that were explored by many photographers of the era. The arts experienced a similar boom, with the foundation and expansion of museums and university programs. 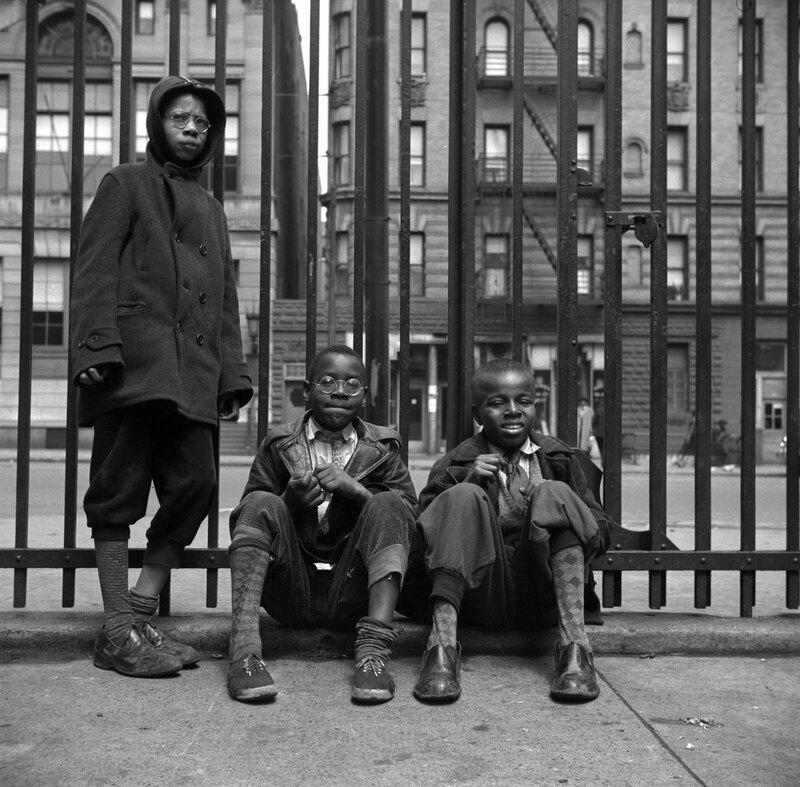 Growth came at a cost, however, and the art of this period highlights the disparate experiences of local communities in Chicago, including Jonas Dovydenas’s photographs of life in ethnic neighborhoods and independent films exploring issues ranging from the work of African American community activists to the forced evictions caused by urban renewal projects. Demonstrations loomed large in Chicago, where artists responded to two major uprisings in 1968, the first on the West Side, following the assassination of Martin Luther King Jr., and the second downtown, during the Democratic National Convention. These violent confrontations between protestors and police drew national attention to issues of race relations and political corruption in Chicago and led to an outpouring of new art projects as forms of demonstration, including community murals like the West Wall and an exhibition at the Richard Feigen Gallery condemning Daley’s actions during the DNC. The image of Chicago that emerged in the mass media of this period was one of destruction and resilience, a duality highlighted by contemporary artists like Gordon-Matta Clark and Allan Kaprow, whose work existed in the fragile space of opportunity between the streets and the wrecking ball. 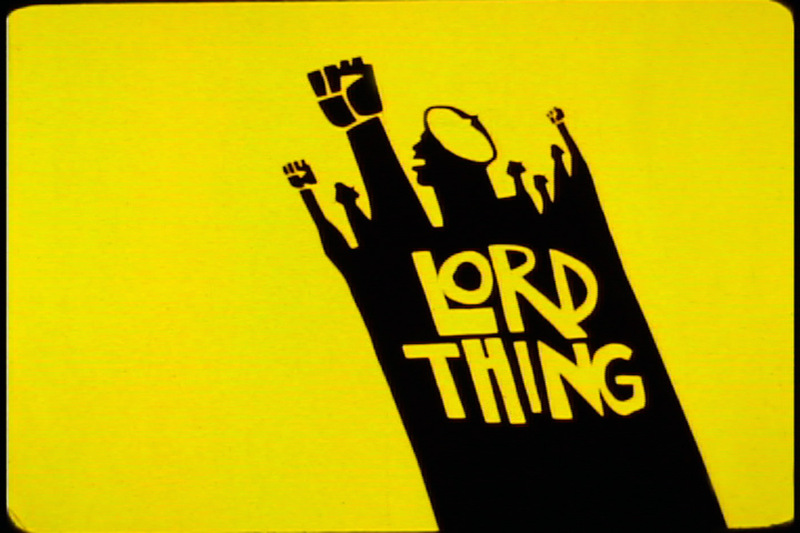 Lord Thing documents the development of the Vice Lords from an informal club for young men on the streets of Chicago’s West Side, its emergence as a street gang, and its evolution into the Conservative Vice Lords, a splinter group that aspired to nonviolent community activism. 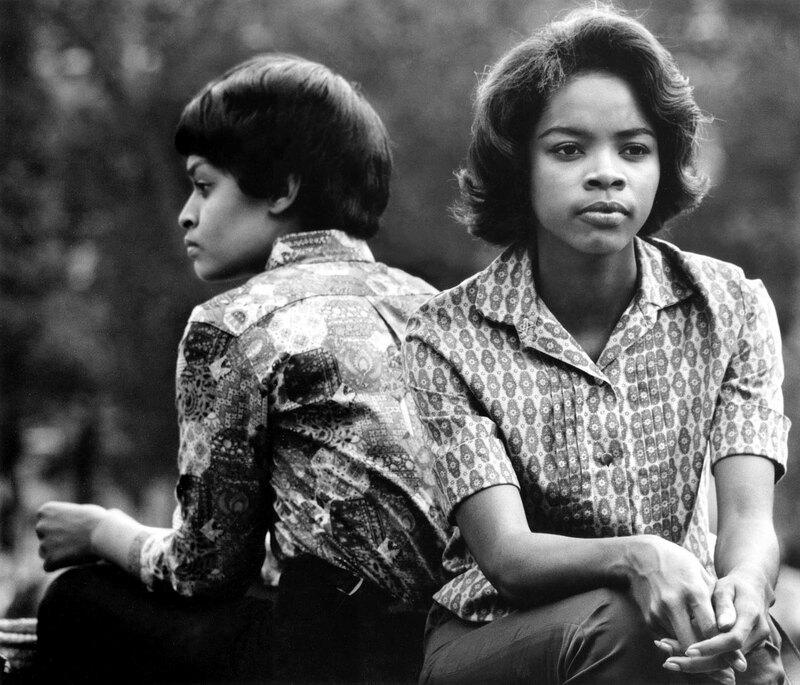 The film uses a mix of black-and-white sequences to retrospectively analyze the group’s violent middle period and contrasts these with color sequences that show the Conservative Vice Lords fostering unity and developing black-owned businesses and social programs during the late 1960s. Together, Lord Thing argues for the agency of African Americans in the face of decades of spatialized oppression in Chicago. 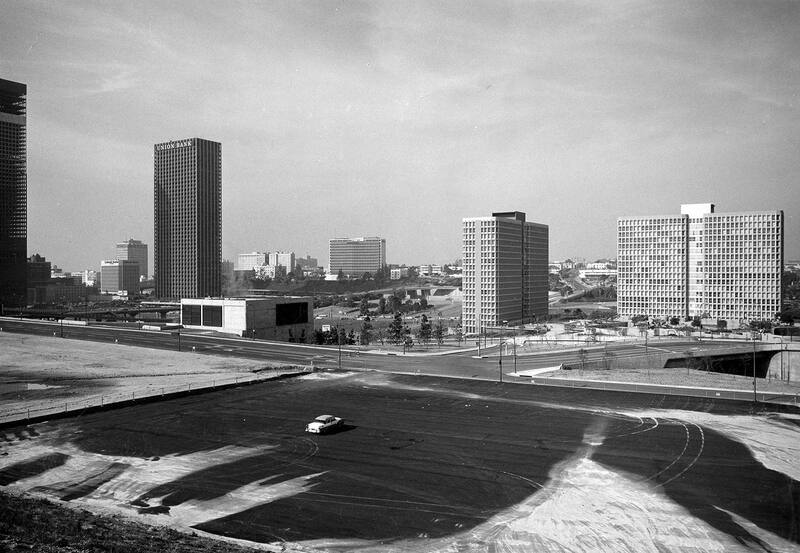 The concept of the city as organism emerged during the 1960s as a response to the increasingly complex interconnections of technology, communication, and history. One exceptional project in this vein was the British architect Alvin Boyarsky’s Chicago à la Carte. 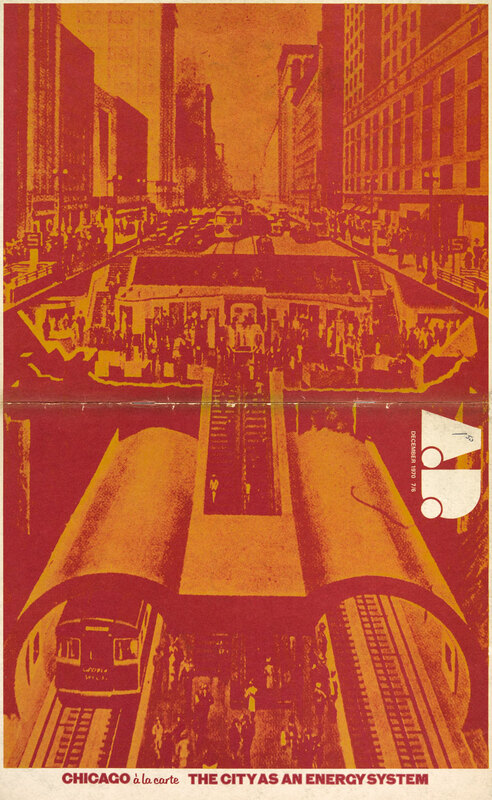 Boyarsky drew on an archive of historical postcards, newspaper clippings, and printed ephemera to trace a hidden history of Chicago’s built environment as an “energy system.” This idea was represented on the cover by a striking postcard image of a vivisection of State Street in the Loop, showing subway tunnels, sidewalks, El tracks, and skyscrapers in what Boyarsky described as “the tumultuous, active, mobile, and everywhere dynamic centre of a vast distribution system.” On other pages, Boyarsky showed images of Chicago’s newly built skyscrapers with newspaper clippings of recent political protests to juxtapose the city’s reaction to recent political protests against the disciplinary tradition of modern architecture in Chicago. Los Angeles has always been known for its exceptionalism, as a city of horizontal rather than vertical growth and a place where categories of private and public space prove complex and intertwined. 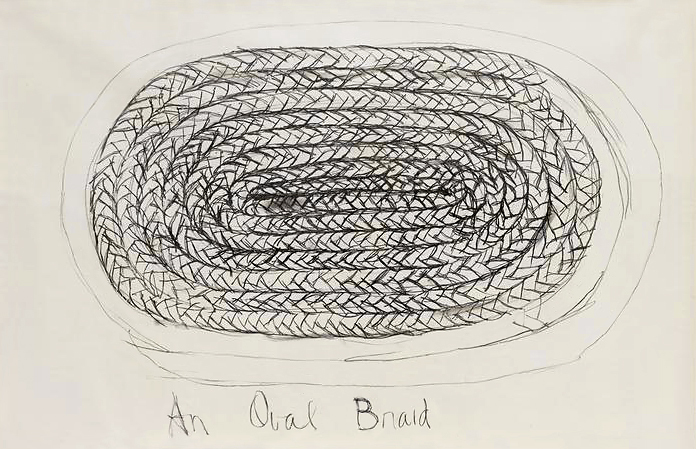 During the 1960s and ’70s these qualities inspired visual responses by seminal artists like Ed Ruscha as well as critics like Reyner Banham, one of the most attentive observers of the city during this period. 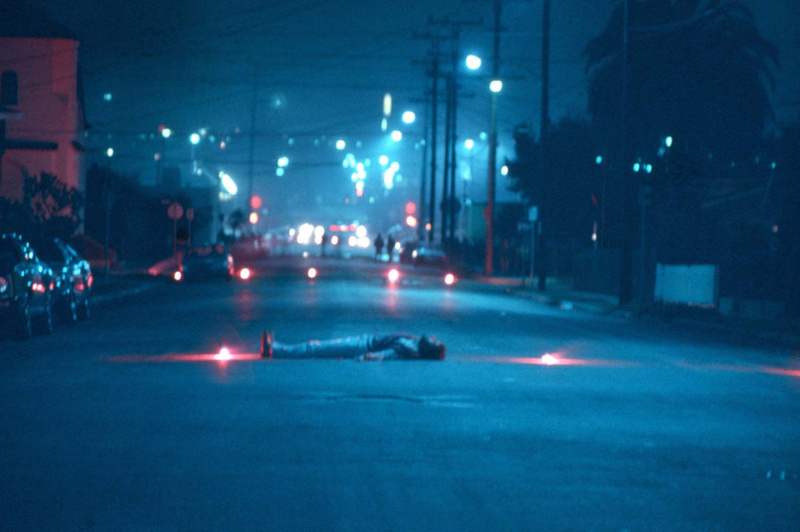 In many other respects, however, Los Angeles experienced events and issues similar to those of New York and Chicago, including problems of racial segregation, a sense of crisis about the decay of its historical downtown, and large-scale demonstrations, with responses ranging from photography and sculpture to provocative new forms of performance art by the collective Asco. Concerns about the future forms of urbanism in Los Angeles and a renewal of the idea of the city were major preoccupations for artists, architects, and filmmakers. Many photographers focused on the everyday banality and auto-centric nature of the city, such as Robbert Flick’s Sequential Views project and Anthony Hernandez’s Public Transit Areas series. The historic downtown core continued to hold a special place in popular memory as many of these areas – including the former neighborhood of Bunker Hill – were razed and rebuilt. Julius Shulman’s photographs of new development in the 1960s – including Bunker Hill and Century City – focus on the spectacular quality of recent buildings as well their physical and cultural vacancy. Architects played a strong role in creating new visions for the future city, including an unrealized, yet bold and influential plan for redeveloping Grand Avenue as a mixed-use district shaped by ideals of diversity and pedestrian-friendly New Urbanism. Photograph by Harry Gamboa Jr. Courtesy of Harry Gamboa Jr. The Chicano art collective Asco was famous for their No Movies – works that appropriate certain stylistic qualities of the movies while maintaining a nonchalance that allows them to critique the media industry’s role in Los Angeles. Asco’s performances, therefore, function on different registers to engage with current events and issues facing the Chicano community as well as acknowledge the mainstream media’s distorted image of the city. For Decoy Gang War Victim, Asco’s members staged a fake gang shooting then circulated the images to local television stations, simultaneously feeding and deriding the media’s hunger for sensationalist imagery of urban neighborhoods. The museum is closed Thanksgiving, Christmas, and New Year’s days. If beauty is only skin deep, and colour deep, why the need to differentiate? Surely it doesn’t matter what colour your skin, beauty just is. You know it when you see it, regardless of colour. Not everything is about power; not everything is a site of contestation… to me, recognising true beauty is an acknowledgement of the light that shines from within, not something that is imposed from without. When you see true beauty, you know it instinctively. Intuitively. Enough of this posing – are you image or essence? 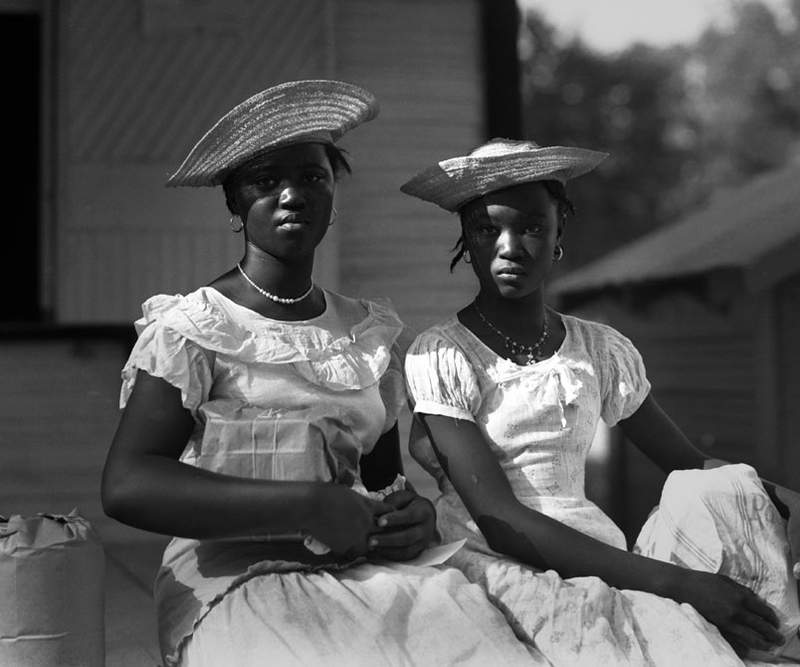 Many thankx to the Virginia Museum of Fine Arts for allowing me to publish the photographs in the posting. Please click on the photographs for a larger version of the image. “That there are so few images of African-American women circulating in popular culture or in fine art is disturbing; the pathology behind it is dangerous … We got a sistah in the White House, and yet mediated culture excludes us, denies us, erases us. 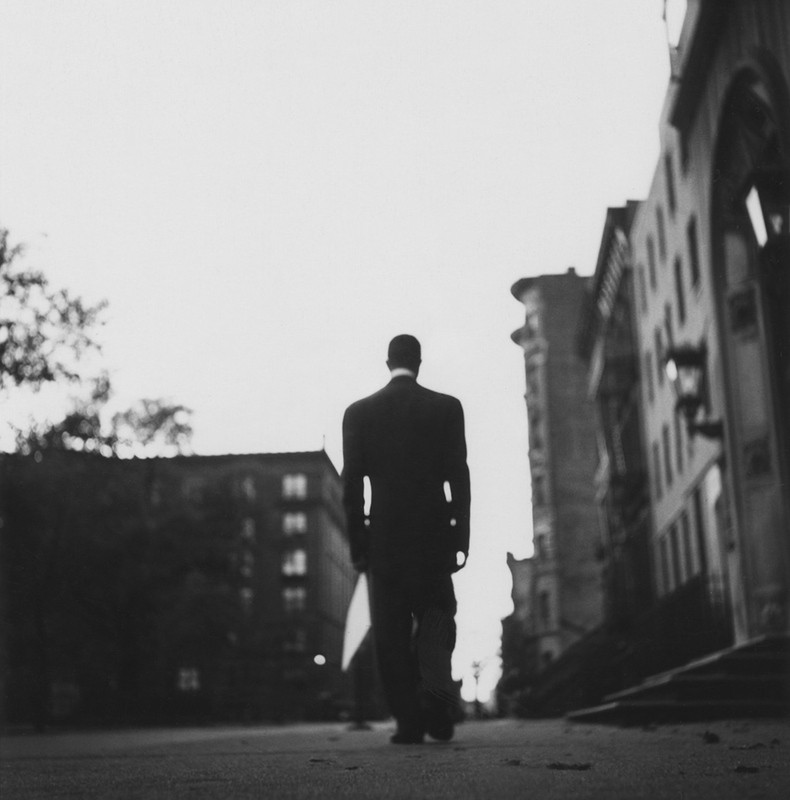 But in the face of refusal, I insist on making work that includes us as part of the greater whole,” said Carrie Mae Weems in a 2009 interview conducted by Dawoud Bey for BOMB Magazine. 8 1/4 x 12 1/4 in. 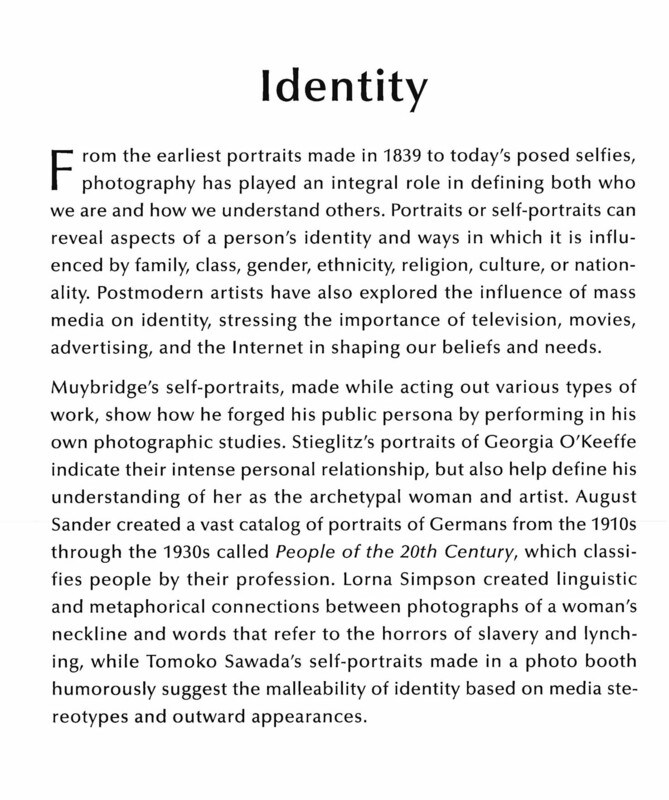 “Exploring contemporary understandings of beauty, Posing Beauty in African American Culture frames the notion of aesthetics, race, class, and gender within art, popular culture, and political contexts. 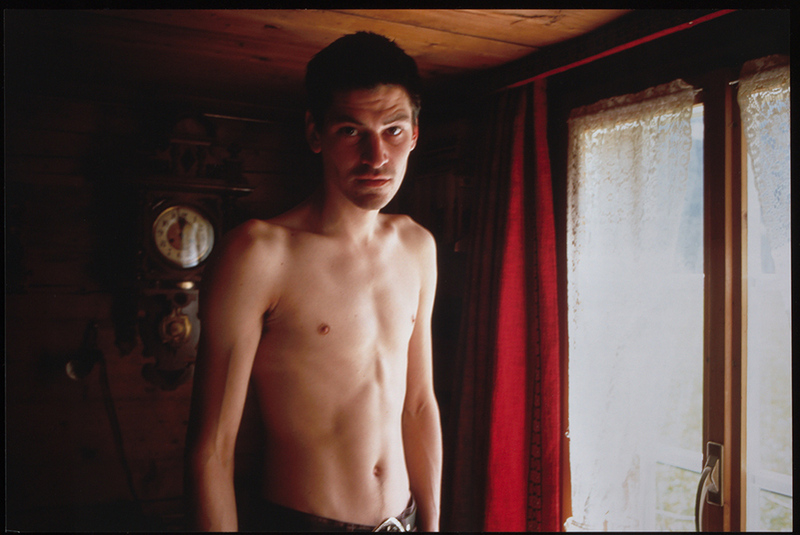 The exhibition – and its companion, Identity Shifts – will be on view April 26 – July 27, 2014. Posing Beauty in African American Culture examines the contested ways in which African and African American beauty has been represented in historical and contemporary contexts through a diverse range of media including photography, film, video, fashion, advertising, and other forms of popular culture such as music and the Internet. The exhibition explores contemporary understandings of beauty by framing the notion of aesthetics, race, class, and gender within art, popular culture, and political contexts. 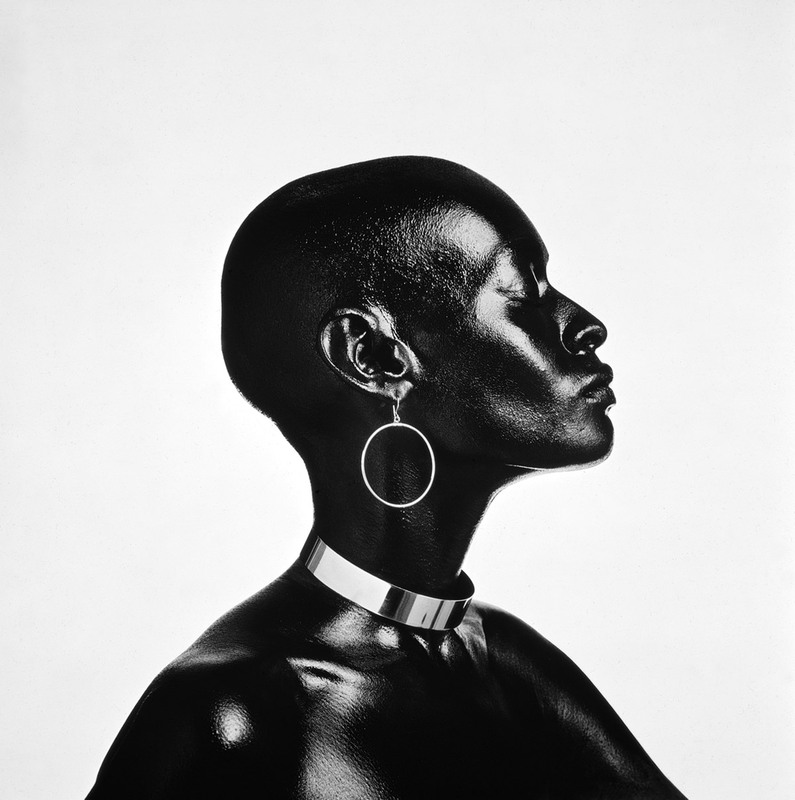 The exhibition is organized by the Department of Photography & Imaging at New York University, Tisch School of the Arts, traveled by Curatorial Assistance Traveling Exhibitions, and curated by Dr. Deborah Willis. The touring exhibition is made possible in part by the JP Morgan Chase Foundation. Additional support has been provided by grants from the Tisch School of the Arts Office of the Dean’s Faculty Development Fund, Visual Arts Initiative Award from the NYU Coordinating Council for Visual Arts, and NYU’s Advanced Media Studio. 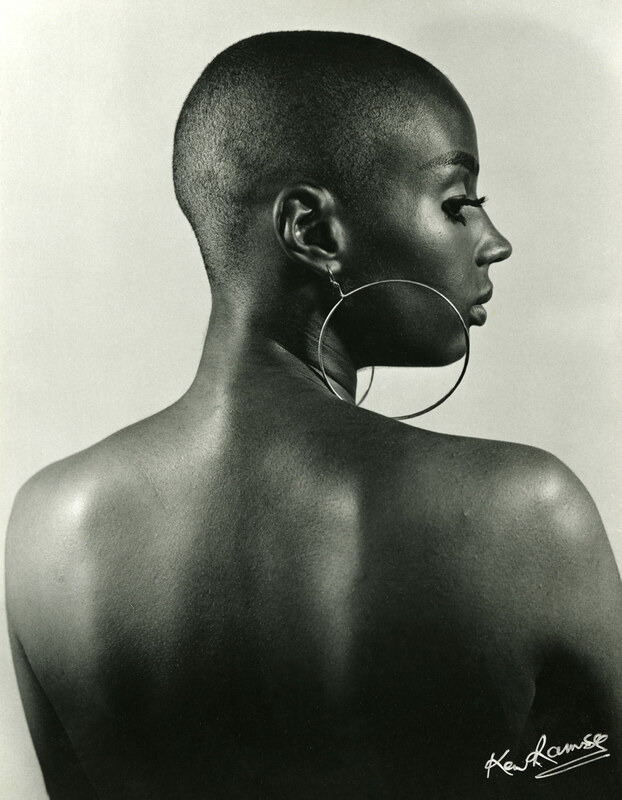 Drawn from public and private collections, Posing Beauty features approximately 85 works by artists such as Carrie Mae Weems, Charles “Teenie” Harris, Eve Arnold, Gary Winogrand, Sheila Pree Bright, Leonard Freed, Renee Cox, Anthony Barboza, Bruce Davidson, Mickalene Thomas, and Jeanne Moutoussamy-Ashe. Posing Beauty is divided into three thematic sections. The first theme, Constructing a Pose, considers the interplay between the historical and the contemporary, between self-representation and imposed representation, and the relationship between subject and photographer. The second theme, Body and Image, questions the ways in which our contemporary understanding of beauty has been constructed and framed through the body. The last section, Modeling Beauty and Beauty Contests, invites a deeper reading of beauty, its impact on mass culture and individuals and how the display of beauty affects the ways in which we see and interpret the world and ourselves. 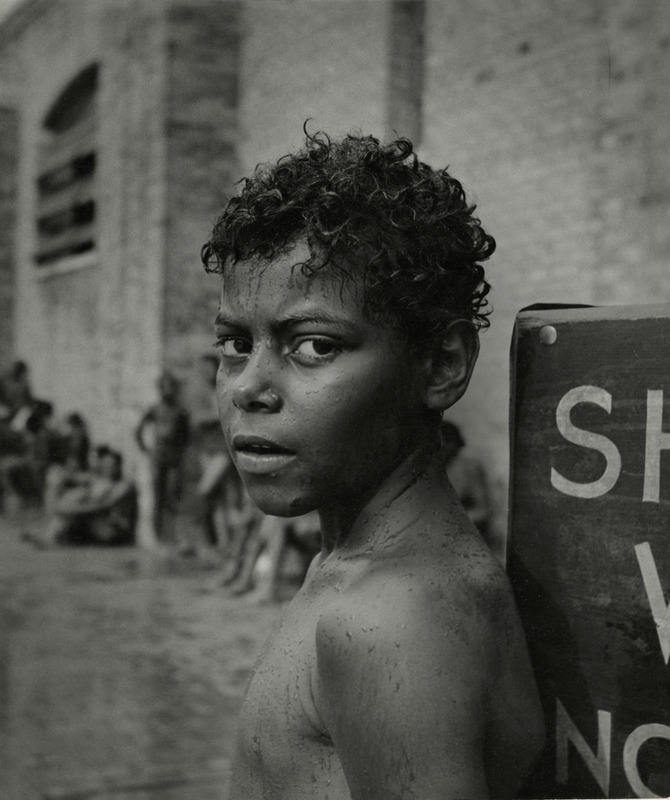 Another great photographer with a social conscience. Fantastic to observe the dynamics of the proof sheets and how the images were cropped for final publication. The angles, the angles of Red’s young brother are illuminating, to see how the photographer framed his subject, what worked, what didn’t. There is a relatively new boxed set of the complete works of this artist published by Stiedl titled Gordon Parks Collected Works (2012). Reasonably priced for a five volume set, I think this would be a must buy for any aficionado of his work. Many thankx to The New Orleans Museum of Art for allowing me to publish the photographs in the posting. Please click on the photographs for a larger version of the image. 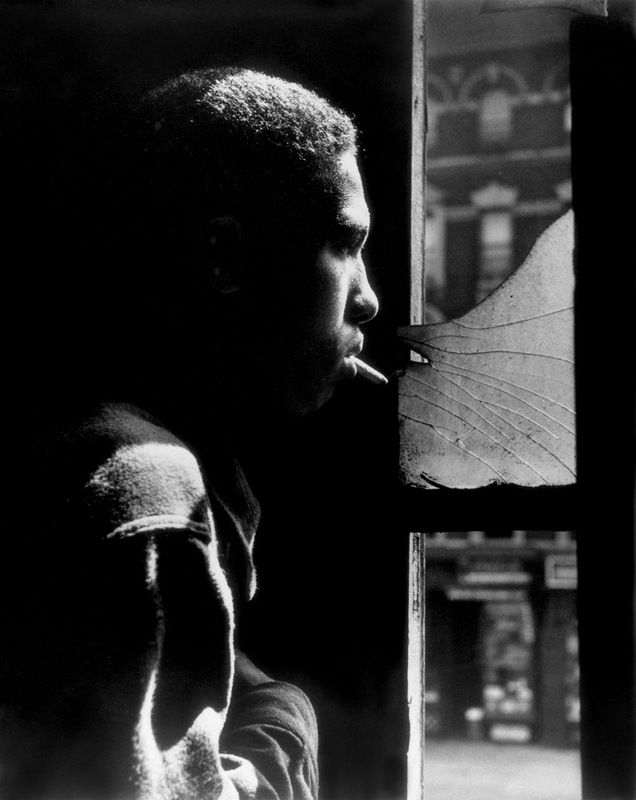 This image shows both the full frame image that Gordon Parks shot and the cropped selection, framed in editor’s marking pen, that was ultimately published in Life magazine. The cropped version dramatically heightens the intensity of the image, bringing the viewer closer to the fight (see proof sheet below). 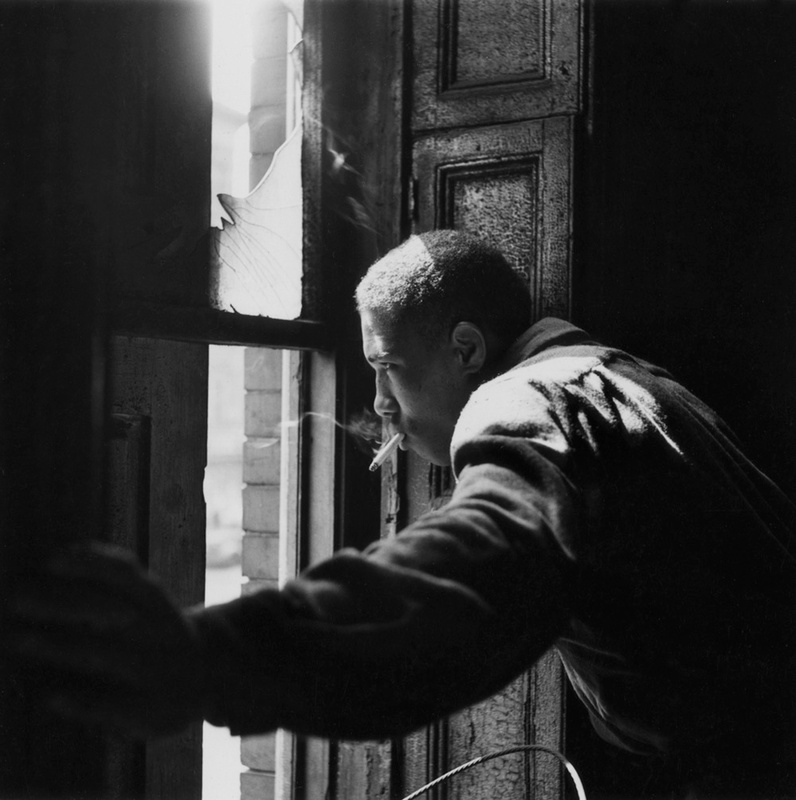 “This exhibition explores the making of Gordon Parks’ first photographic essay for Life magazine in 1948, “Harlem Gang Leader.” After gaining the trust of one particular group of gang members and their leader, Leonard “Red” Jackson, Parks produced a series of photographs that are artful, poignant, and, at times, shocking. From this large body of work (Parks made hundreds of negatives) the editors at Life selected twenty-one pictures to print in the magazine, often cropping or enhancing details in the pictures in the process. 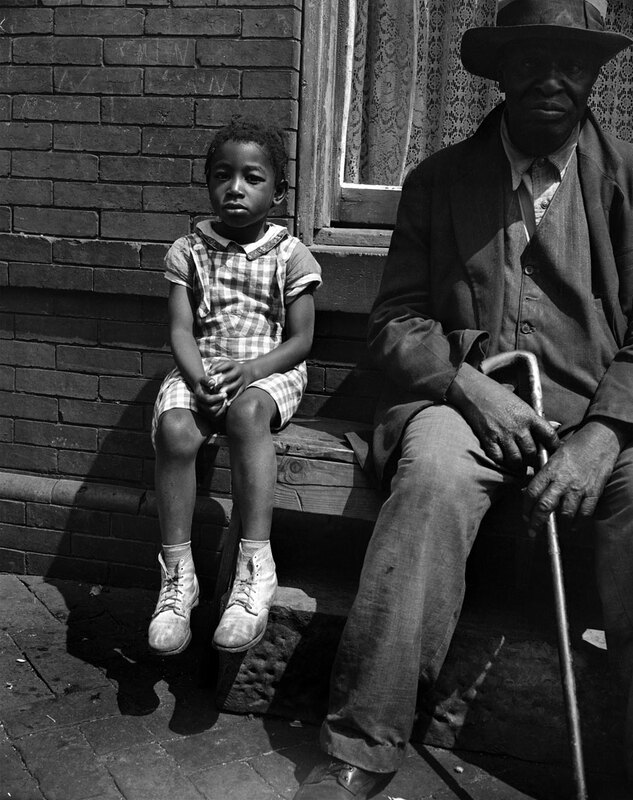 Gordon Parks: The Making of an Argument traces this editorial process and parses out the various voices and motives behind the production of the picture essay. 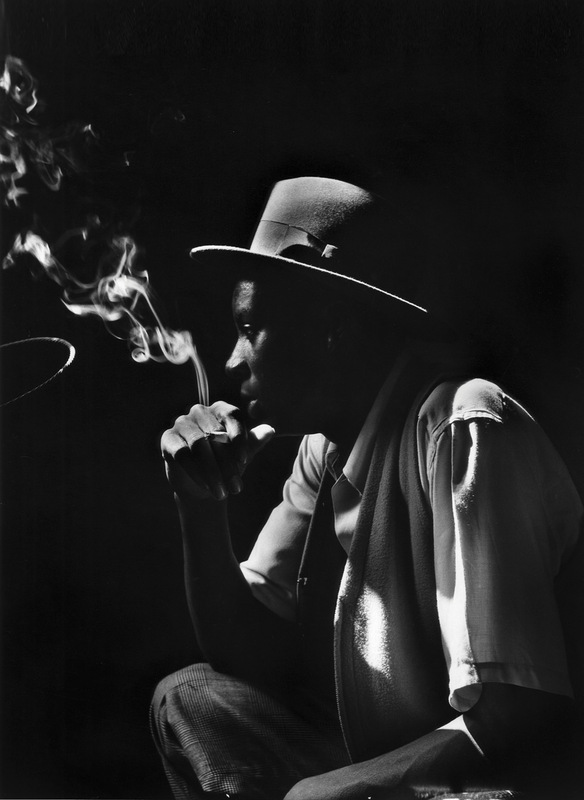 In 1948, Gordon Parks began a professional relationship with Life magazine that would last twenty-two years. 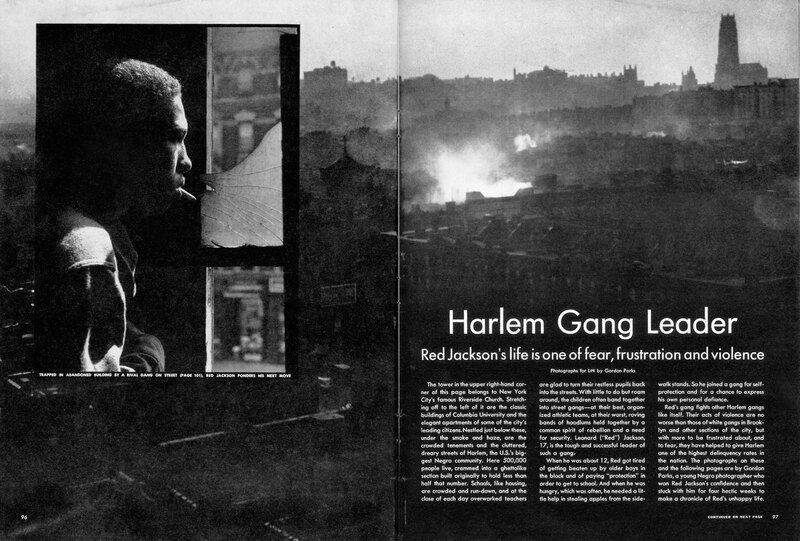 For his first project, he proposed a series of pictures about the gang wars that were then plaguing Harlem, believing that if he could draw attention to the problem then perhaps it would be addressed through social programs or government intervention. 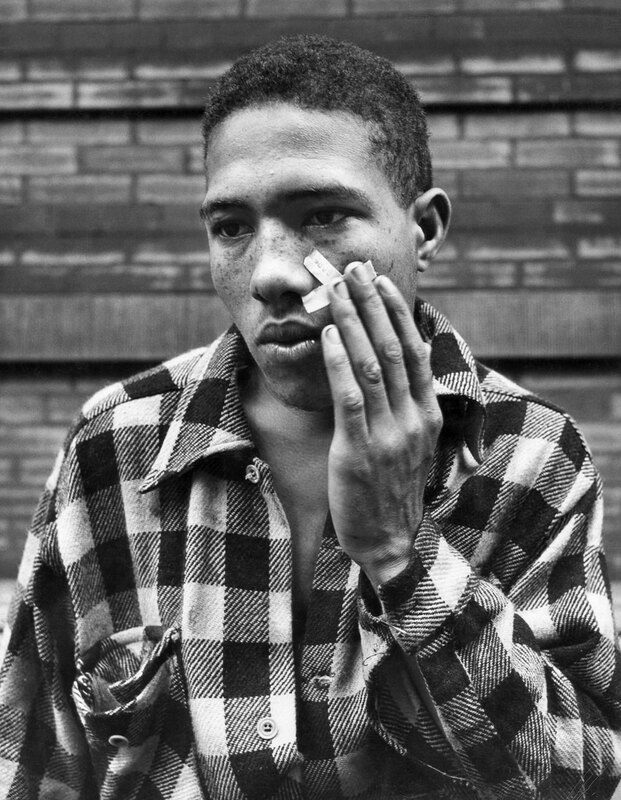 As a result of his efforts, Parks gained the trust of one particular group of gang members and their leader, Leonard “Red” Jackson, and produced a series of pictures of them that are artful, emotive, poignant, touching, and sometimes shocking. From this larger body of work, twenty-one pictures were selected for reproduction in a graphic and adventurous layout in Life magazine. A slight, bespectacled, intelligent gay man. A man who has the courage of his convictions. There is something insidious about the American nation. Not its citizens, not its place, but its government. This government has perpetrated evil in the name of its people. Think of Iraq and Afghanistan, invasions in the name of freedom, the support of puppet governments, the assassinations, the military advisors on the ground, the profits made. Bradley Manning revealed all of this because he has a mighty moral compass. He knows right from wrong. He was not afraid to expose the hypocrisy that for many years has beaten, unfettered, in the breast of a nation. The home of the brave and the free is sadly under attack from within. In the name of its people. And why is this text relevant to this posting? So often in the history of America, dissension is shut down because of some imagined menace, from within or without. Here another group of people (photographers documenting American social conditions) were persecuted for standing up for social causes, for the freedom to expose injustice where it lives. The paranoia of patriotism. Many thankx to The Norton Museum of Art for allowing me to publish the photographs in the posting. Please click on the photographs for a larger version of the image. 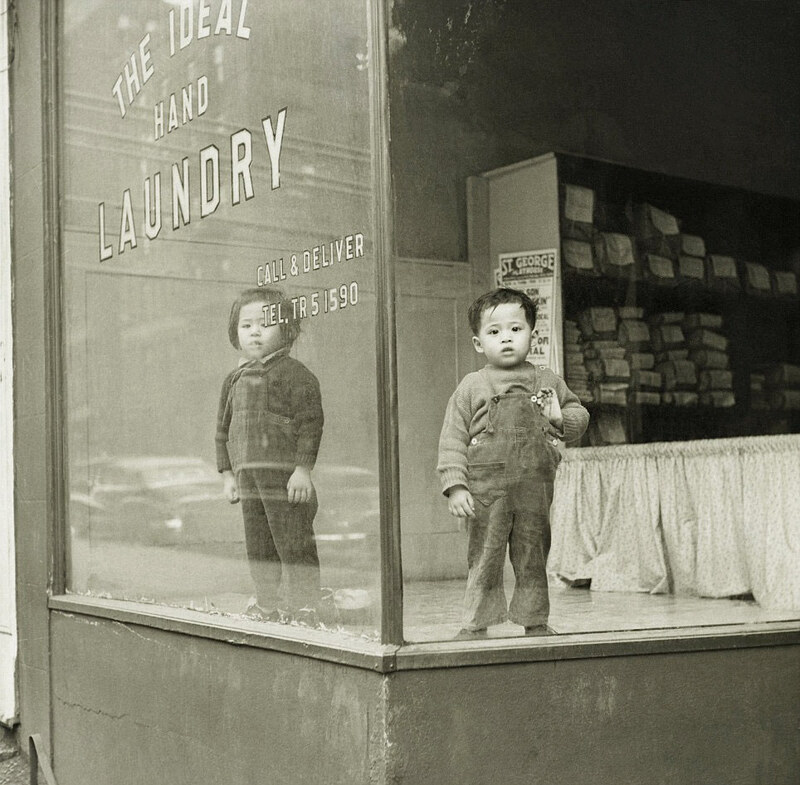 away from the laundry line (emblem of poverty), and suggests the social mobility of the postwar era. Born in New York; Newman attended Brooklyn College, where he studied sculpture with Burgoyne Diller and photography with Walter Rosenblum. 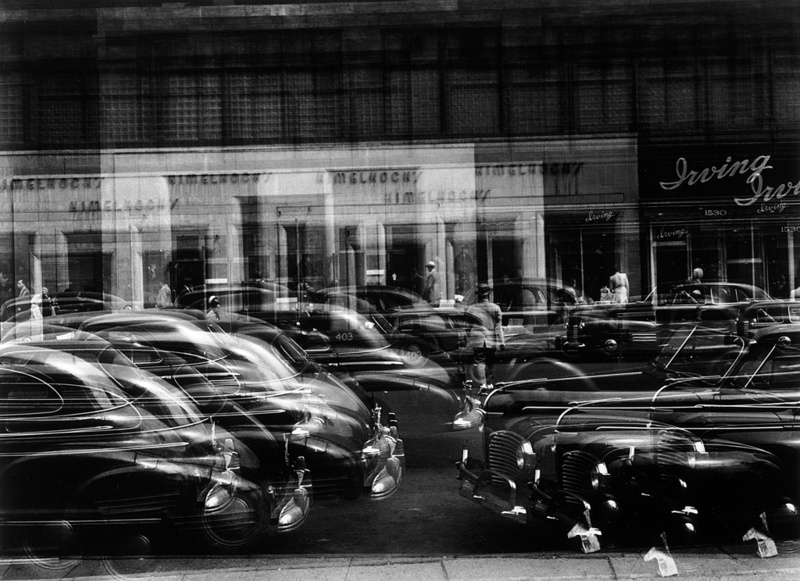 Following Rosenblum’s suggestion, he joined the Photo League in 1948, taking classes with John Ebstel. The Photo League, founded in 1936, blazed a trail for serious photographers for 15 years, providing a forum for ideas, cheap darkroom space, and the vision of using the art of picture taking to change the world. 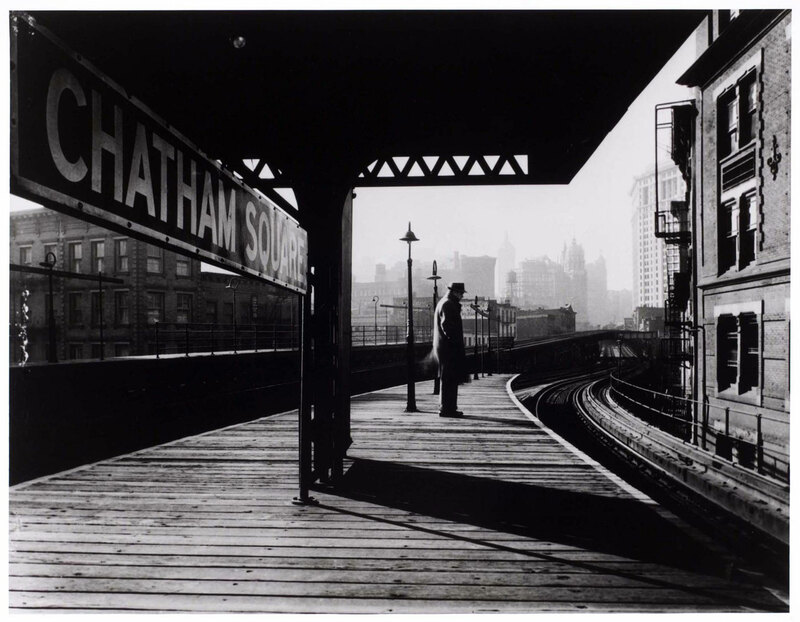 Newman then attended the Institute of Design, Chicago (1949-52), where, after studying with Harry Callahan and Aaron Siskind, he received one of the first MS degrees in photography (1952). During this time, Newman won national contests, including one sponsored by American Photography (1950) and another by Time, Inc. (1951). 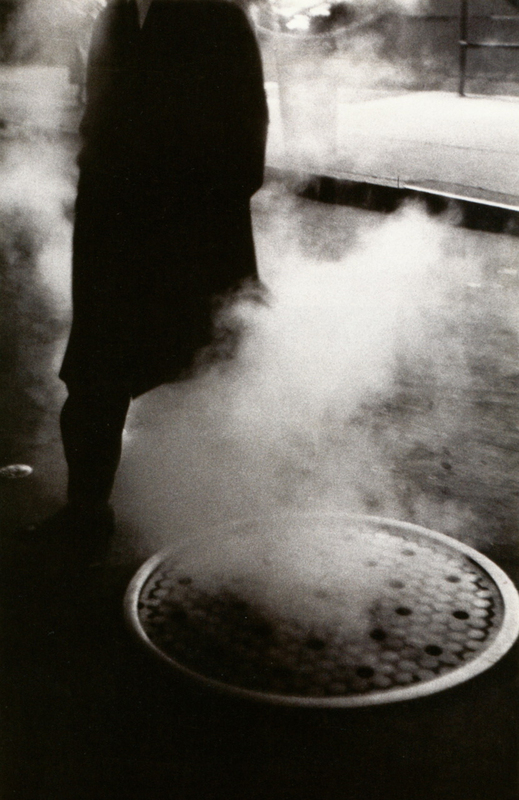 His work appeared in the Always a Young Stranger exhibition at the Museum of Modern Art, New York, and in a one-man show at Roy De Carava’s A Photographer’s Gallery (1956). Well-known as a photojournalist, Newman has been a major contributor to Sports Illustrated since its inception (1953), as well as to Life, Look, Newsweek, and Smithsonian magazines. 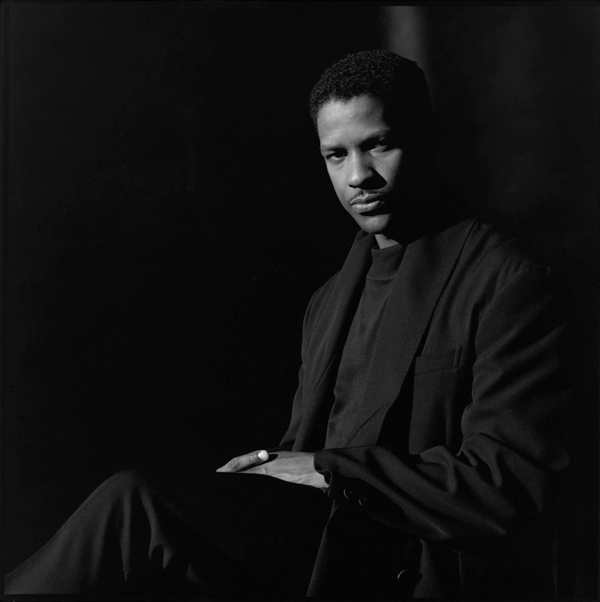 In addition, he has been the national president of the American Society of Magazine Photographers, authored or coauthored eight books on photography, and received the Art Director’s Gold Medal for Editorial Photography. window is a reminder of a time when unescorted women were not always welcome in public dining establishments. When I began working in the 1940s, few women were doing magazine photography in a field that was almost exclusively male. As I progressed from box camera to Speed Graphic (my first professional camera), and then to a Rolleiflex, I stopped thinking about the mechanics of film speed, f-stops, shutter speed, and began focusing on subject matter that interested me. What interested me so much were ordinary people and their everyday activities. 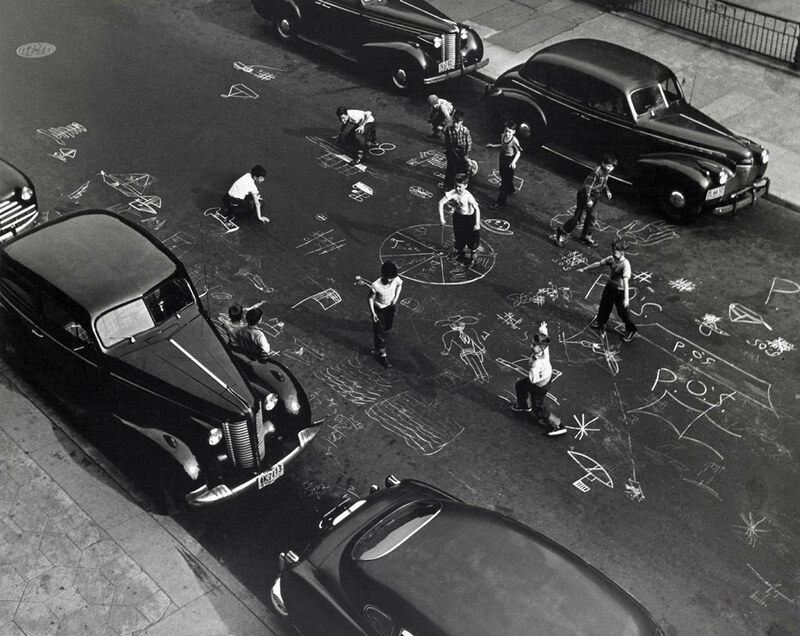 Early on, I had documented children’s games and unusual architectural details in my Bronx neighborhood. I decided to expand, to go elsewhere, taking the subway to Harlem, Chinatown, and lower Manhattan, exploring those neighborhoods and looking for photos. I became a member of the Photo League in 1946. 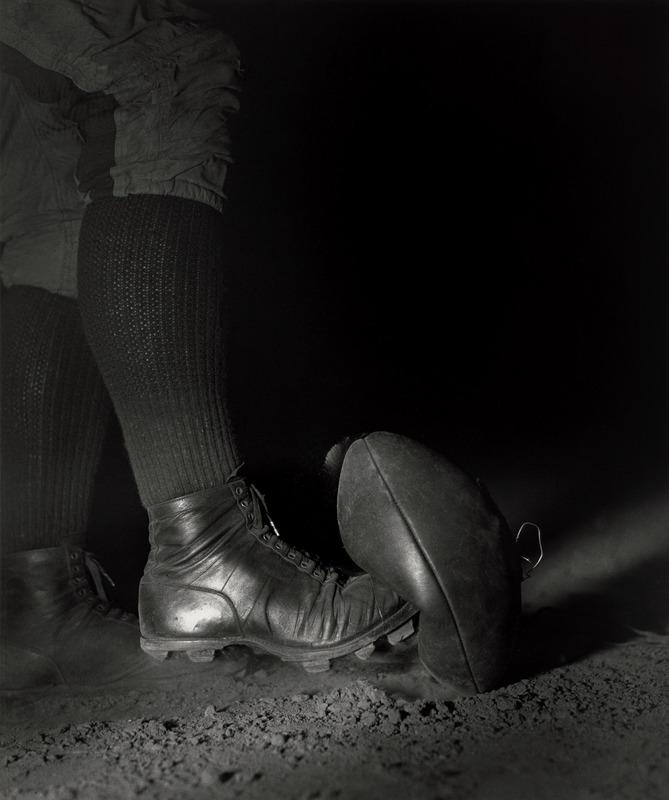 I considered myself a documentary photographer and the League’s philosophy of honest photography appealed to me. I also began to understand the power of photos to help improve the social order by showing the conditions under which many people lived and worked. Even after leaving the League the following year, I continued to emphasize visual and social realities in my straightforward photographs. 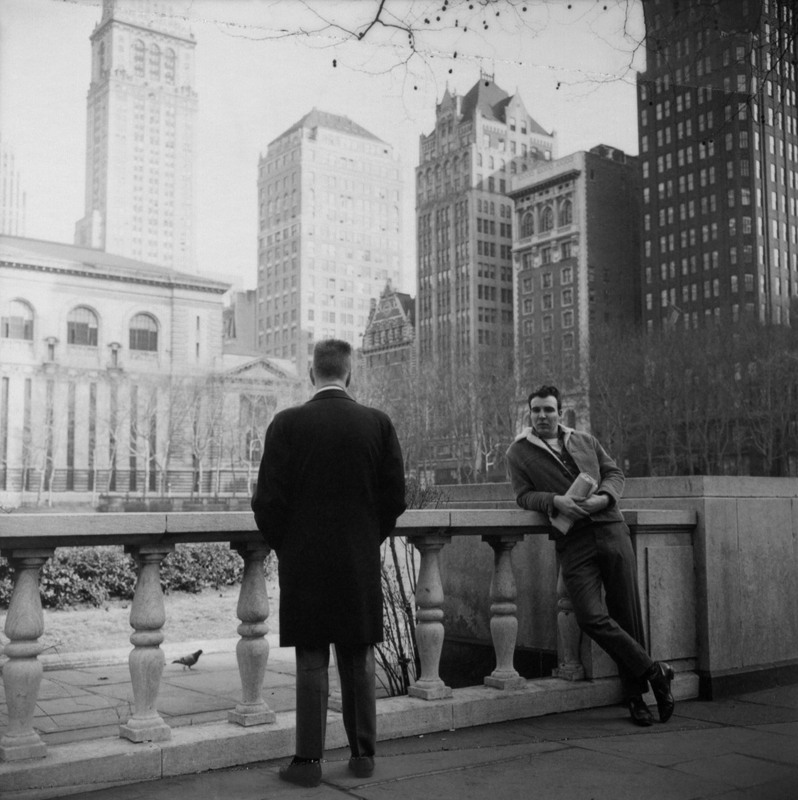 Beginning with my earliest photos seeing New York City with my feet, and in whatever part of the country I was in, I continued my own walkabout, learning the area, engaging my subject, listening, and respecting their dignity. This continued to be my approach when taking photos. My photographs depicted daily life in America’s modern metropolitan centers, including Chicago and Los Angeles as well as New York. dancer, moved the stump to a nearby block and planted a new Tree of Hope beside it to assume wishgranting duties. it for luck before going onstage. differences in body language and dress. 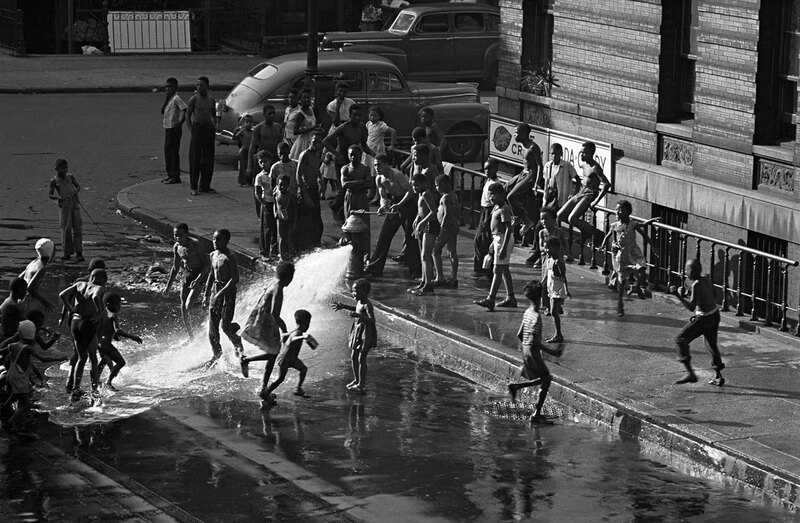 I first heard of the Photo League from Lou Stoumen in Puerto Rico in 1942. I was working for the U.S. Army Signal Corps and Lou was preparing to join Yank Magazine. When I returned to New York City, I walked up the rickety stairs to League Headquarters and took a beginners class with Johnny Ebstel. I bought a used Rolleicord for a precious $100, and dared to go out on the city streets to photograph the life around me. Soon the guys began to come back from the war and the heady life of Photo League workshops, exhibits, lectures, photo hunts, and committee assignments intensified. I took eye-heart-soul opening workshops with Sid Grossman, worked as the paid (!) secretary for a year or so, and worked on the Lewis Hine Committee under Marynn Ausubel. I photographed in Spanish Harlem, Greenwich Village, midtown Manhattan, at the Hebrew Immigration Aid Society, at an anti-lynching rally in Madison Square Park, at a Jehovah’s Witness convention in Yankee Stadium, and on Coney Island. Mostly, I photographed children and reflections of my city – rough-edged, tender, and very beautiful in its diversity. Some of this work was shown in the major 1949 exhibition, This is the Photo League. The heartbreaking end of the League coincided with a huge change in my personal life. I got married and my husband began to go to college and we were out of NY for a while. And then the biggest change: our own family arrived and the joys of our son, and later our daughter, absorbed my time. Prints and negatives were stashed away in boxes and I lost track of all the old friends at the League. After so many years of being in the shadows, you can imagine my pleasure, at 90+ years of age, to have my photographs out of their boxes and onto walls where they can be seen, thought about, and enjoyed – and perhaps again take their place in the history of the Photo League. 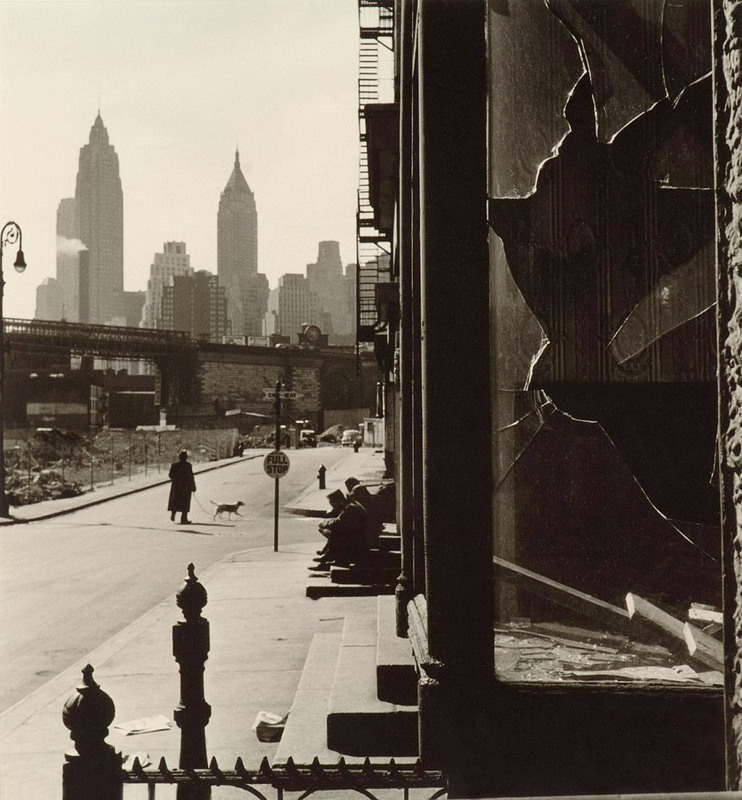 “The Norton Museum of Art’s newest special exhibition, The Radical Camera: New York’s Photo League, 1936 – 1951, is a formidable survey of the League’s history, and its artistic, cultural, social, and political significance. 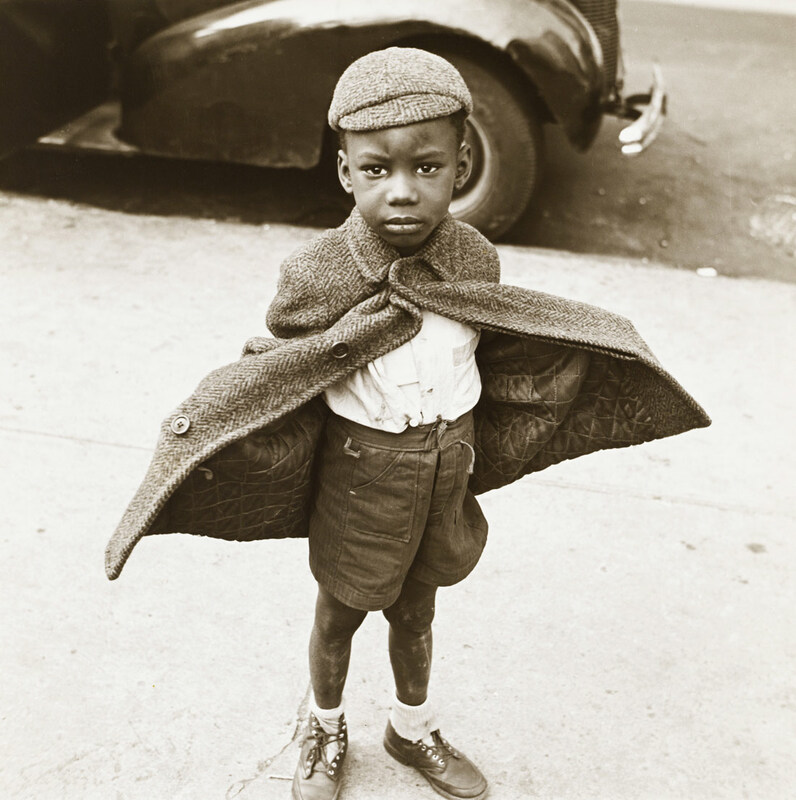 Opening March 14 and on view through June 16, 2013, this striking exhibition includes nearly 150 vintage photographs from Photo League collections at the Columbus Museum of Art, Ohio, and The Jewish Museum in New York City. The exhibition is organized by Mason Klein, Curator of Fine Arts at The Jewish Museum and Catherine Evans, the William and Sarah Ross Soter Curator of Photography of the Columbus Museum of Art. It premiered in at The Jewish Museum in 2011 to rave reviews. The New York Times called The Radical Camera a “stirring show,” and the New York Photo Review hailed it as “nothing short of splendid.” The New Yorker named the exhibition one of the top 10 photography exhibitions of 2011. The Norton is the final venue on the exhibition’s tour. The exhibition explores the fascinating blend of aesthetics and social activism at the heart of the Photo League. 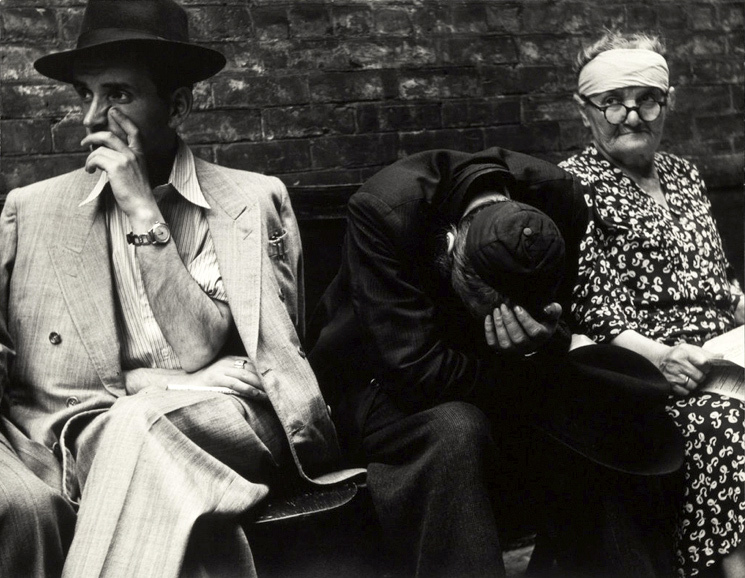 League members were known for capturing sharply revealing, compelling moments from everyday life. The League focused on New York City and its vibrant streets – a shoeshine boy, a brass band on a bustling corner, a crowded beach at Coney Island. 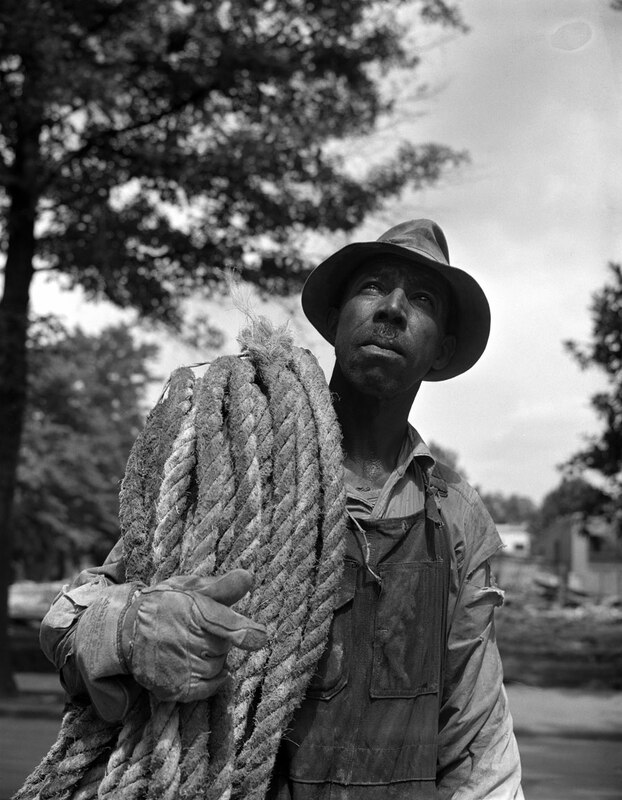 Many of the images are beautiful, yet harbor strong social commentary on issues of class, race, and opportunity. 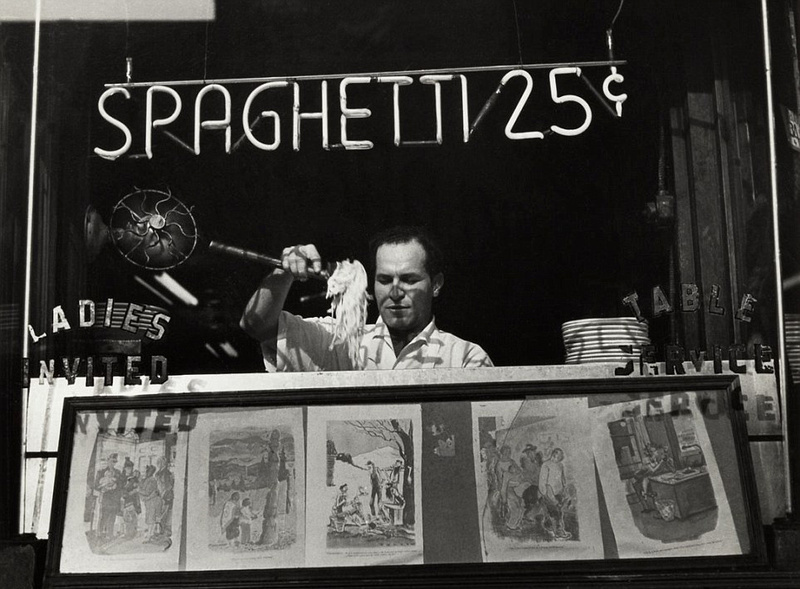 The organization’s members included some of the most noted photographers of the mid-20th century – W. Eugene Smith, Weegee (Arthur Fellig), Lisette Model, Berenice Abbott and Aaron Siskind, to name a few. 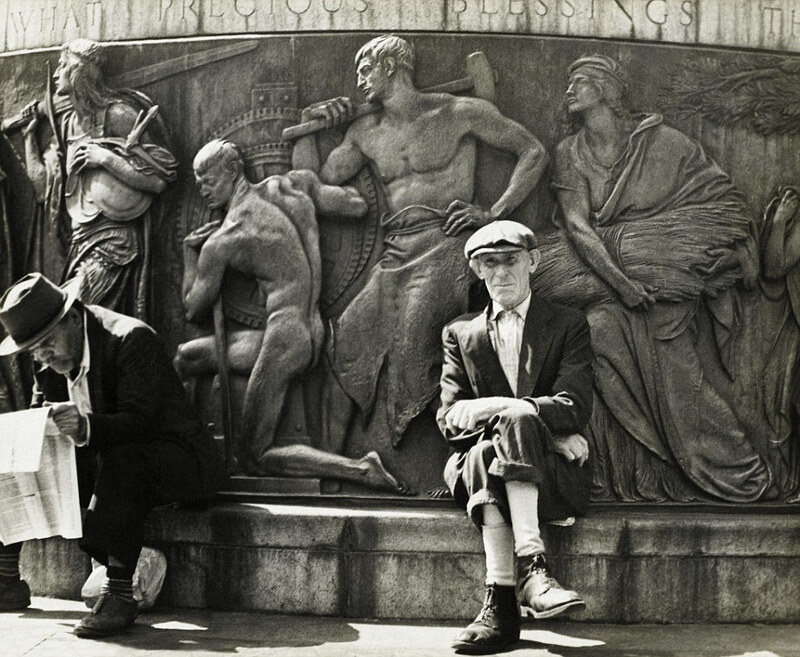 In 1936, a group of young, idealistic photographers, most of them Jewish, first-generation Americans, formed an organization in Manhattan called the Photo League. Their solidarity centered on a belief in the expressive power of the documentary photograph, and on a progressive alliance in the 1930s of socialist ideas and art. (The Photo League also helped validate photography as a fine art, presenting student work and guest exhibitions by established photographers.) The Radical Camera presents the development of the documentary photograph during a tumultuous period that spanned the New Deal reforms of the Depression, World War II, and the Cold War. 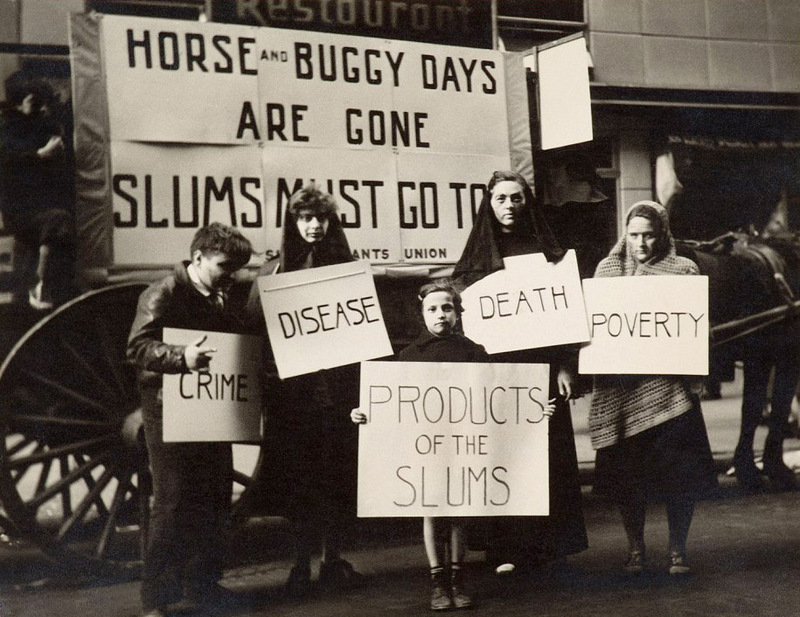 Offering classes, mounting exhibitions, and fostering community, members of the Photo League focused on social reform and the power of the photograph to motivate change. At the height of their influence, their membership included the most important photographers of their day including Berenice Abbot, Aaron Siskind, Barbara Morgan, Sid Grossman, Weegee (Arthur Fellig), and Lisette Model. Featuring more than 175 works by these artists as well as many more Photo League members, The Radical Camera traces the organization’s interests, attitudes toward photography, and impact during its 15-year lifespan. 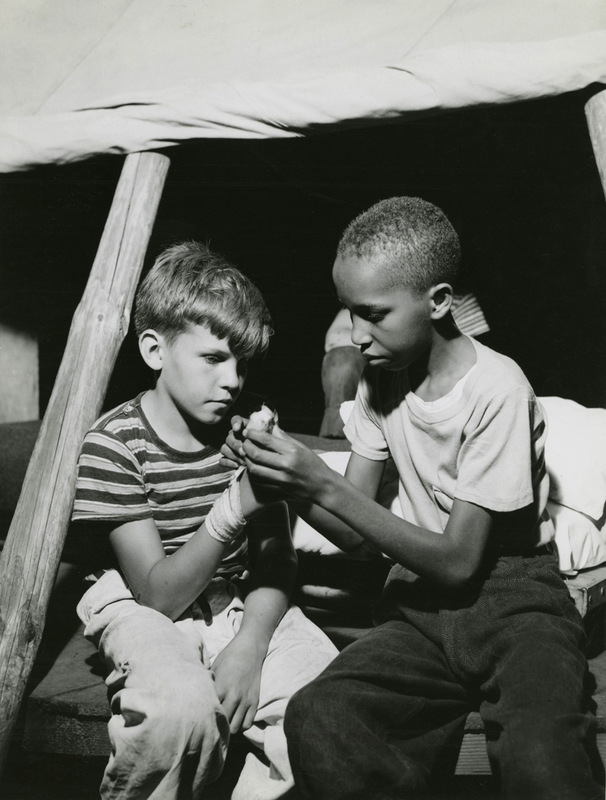 The innovative contributions of the Photo League during its 15-year existence (1936-1951) were significant. As it grew, the League mirrored monumental shifts in the world starting with the Depression, through World War II, and ending with the Red Scare. 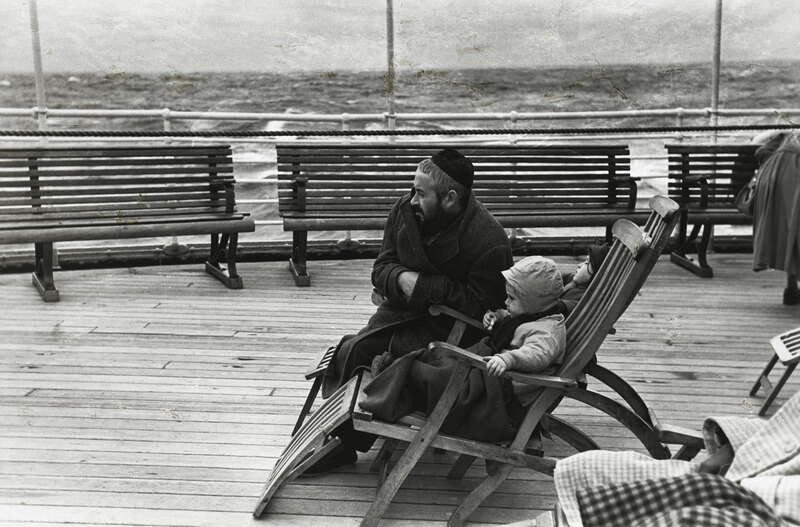 Born of the worker’s movement, the Photo League was an organization of young, idealistic, first-generation American photographers, most of them Jewish, who believed in documentary photography as an expressive medium and powerful tool for exposing social problems. 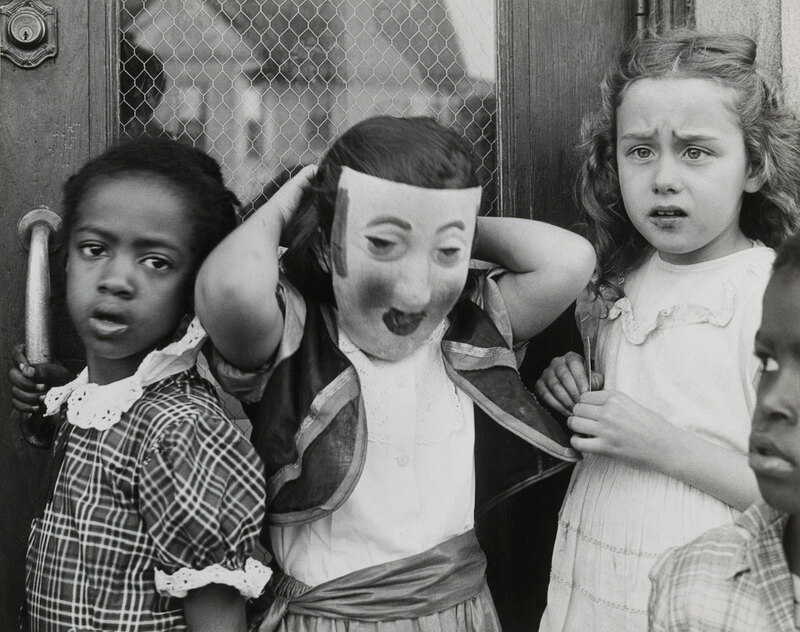 It was also a school with teachers such as Sid Grossman, who encouraged students to take their cameras to the streets and discover the meaning of their work as well as their relationship to it. The League had a darkroom for printing, published an acclaimed newsletter called Photo Notes, offered exhibition space, and was a place to socialize. 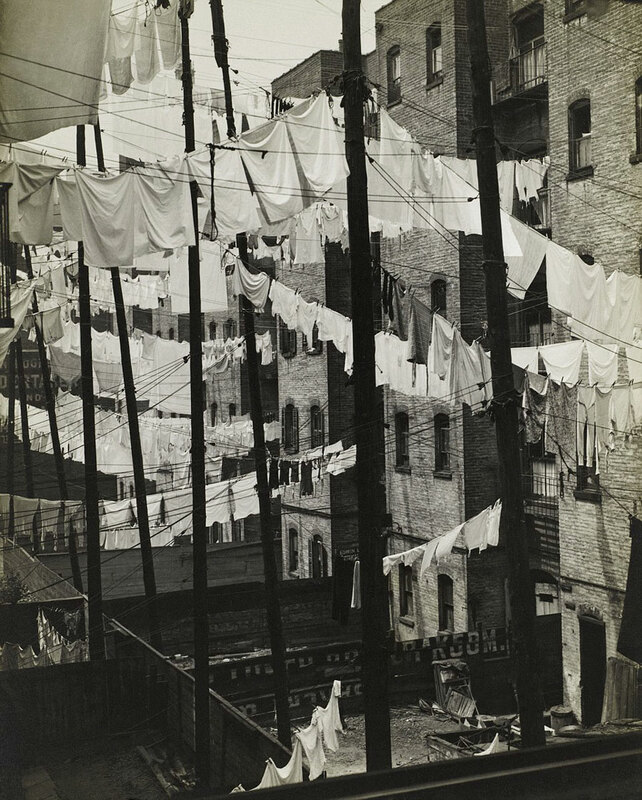 The Photo League helped validate photography as a fine art, presenting student work and guest exhibitions by established photographers such as Eugène Atget, Henri Cartier-Bresson, and Edward Weston, among others. 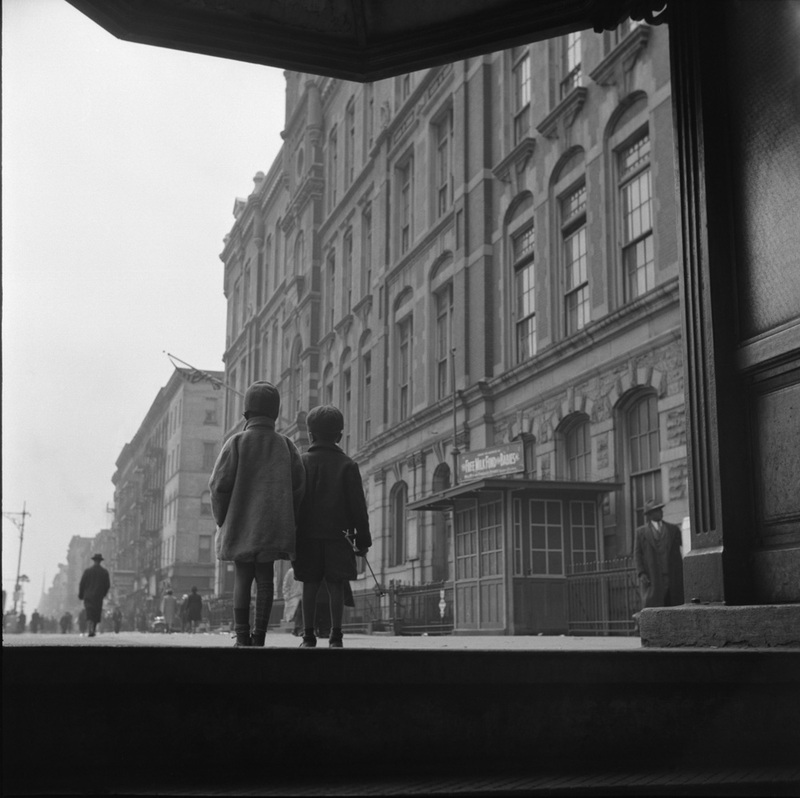 These affecting black and white photographs show life as it was lived mostly on the streets, sidewalks and subways of New York. Joy and playfulness as well as poverty and hardship are in evidence. 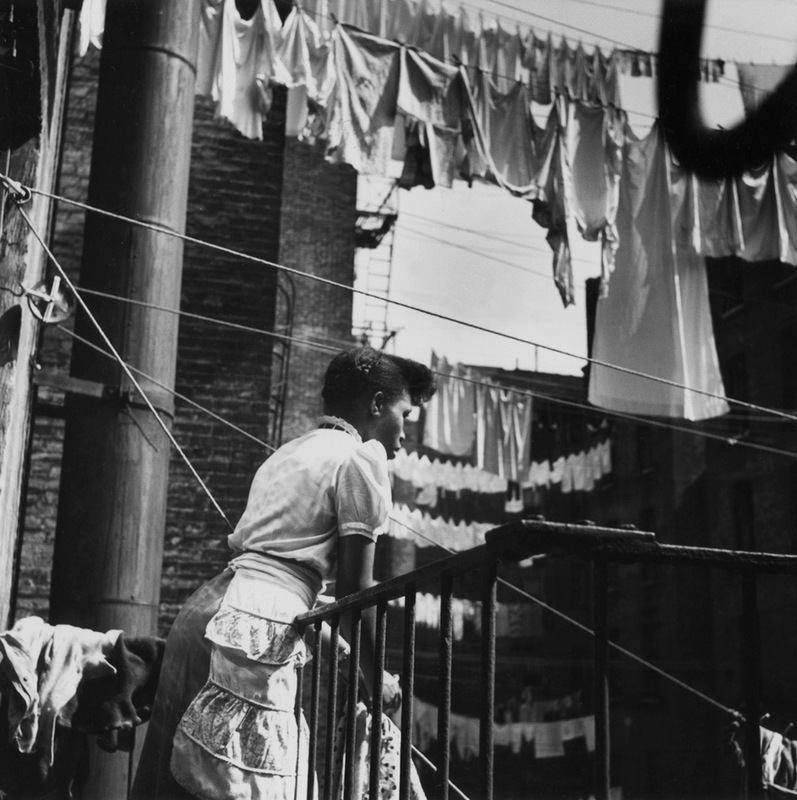 In addition to their urban focus, “Leaguers” photographed rural America, and during World War II, took their cameras to Latin America and Europe. The exhibition also addresses the active participation of women who found rare access and recognition at the League. The Radical Camera presents the League within a critical, historical context. Developments in photojournalism were catalyzing a new information era in which photo essays were appearing for the first time in magazines such as Life and Look. As time went on, its social documentary roots evolved toward a more experimental approach, laying the foundation for the next generation of street photographers. This is a classic photograph. 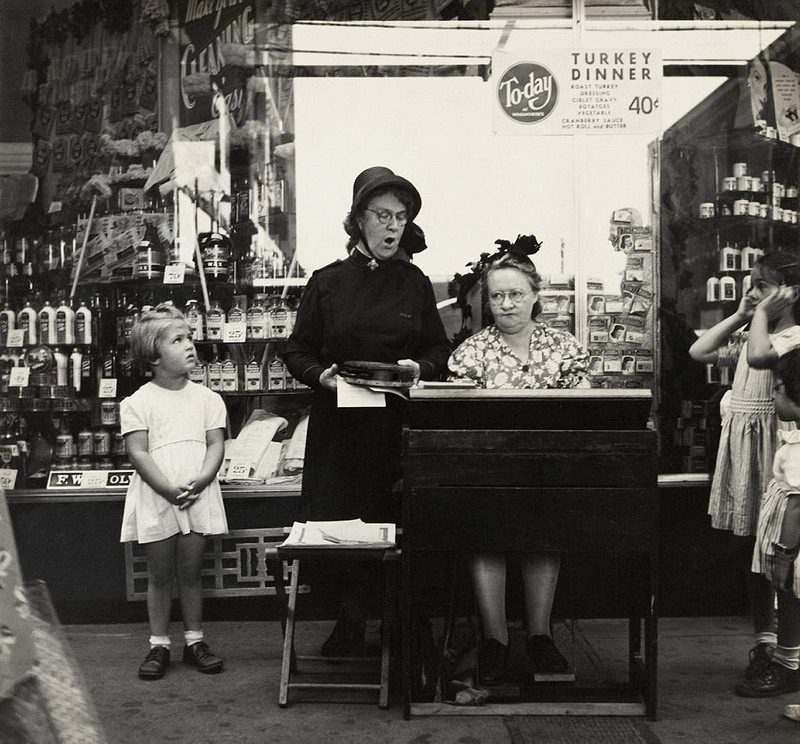 Look at the triangle that forms the central part of the image, from the girl at left looking with disdain at the matriarch singing then down to the look on the organ players face. Notice the girl at right covering her ears so she cannot hear the racket. Imagine the legs of the organ player going up and down, pumping air into the organ; and finally observe the shadow of a man’s face captured by reflection in the shop window as he walks past the scene. Magic. motif in League imagery) is Kanaga’s empathy for the living conditions of the working class. 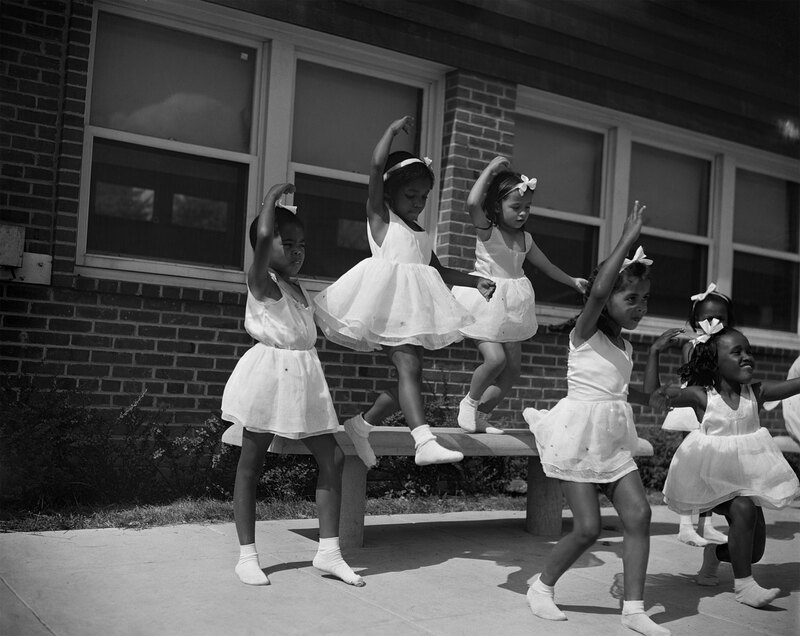 Mary Bruce opened a dancing school in Harlem in 1937. For fifty years she taught ballet and tap, giving free lessons to those who could not afford them. 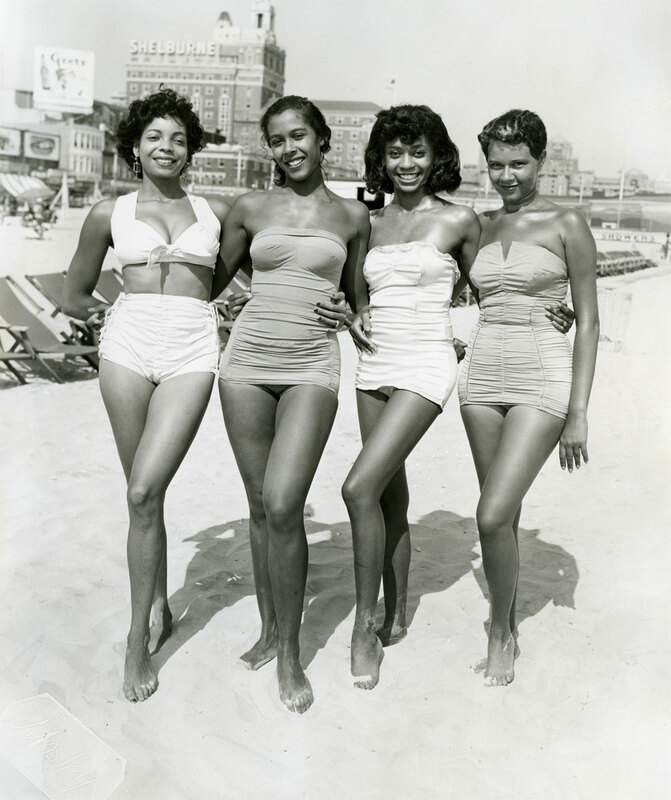 Her illustrious pupils included Katherine Dunham, Nat King Cole, Ruby Dee, and Marlon Brando. The more I see the work of this outstanding artist, the more I fall in love with it. There is just a beautiful lyricism here – nothing extraneous or superfluous within the picture frame, sensitively balanced photographs that are whimsical and engaging. 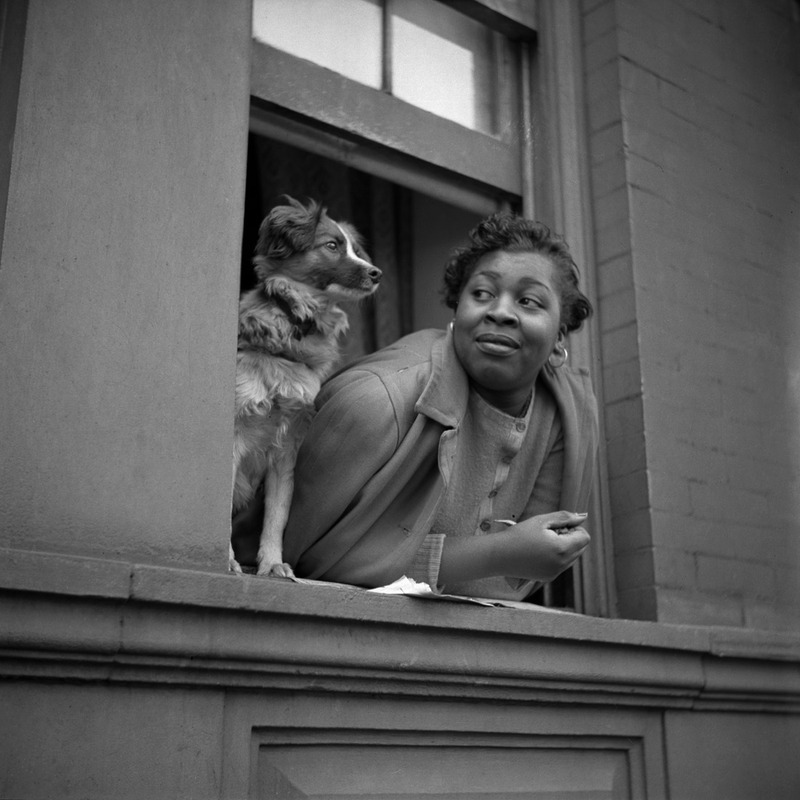 A woman and her dog in Harlem, NY, 1943 (below) is just a joy. Many thankx to the New York State Museum for allowing me to publish the photographs in the posting. Please click on the photographs for a larger version of the image. 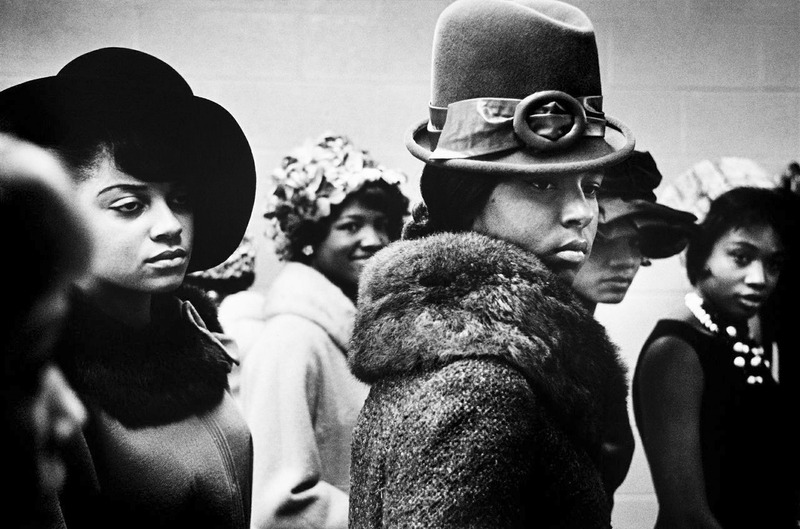 “A new exhibition celebrating the 100th birthday of world-renowned photographer Gordon Parks opens on January 26, 2013 at the New York State Museum. Gordon Parks: 100 Moments showcases six decades of Parks’ photographs, including numerous never-before-seen images and Parks’ most famous photo, American Gothic, Washington, D.C. On display at the State Museum through May 19, 2013, the stunning visual collection is organized by the Schomburg Center for Research in Black Culture. The exhibit also includes images from the Farm Security Administration and Office of War Information (OWI) collections at the Library of Congress, Prints and Photographs Division.